I have actually come to enjoy the process of cutting a new button on a stem. It has taken a lot of practice but I can honestly say that I am getting better at it. I still have more to learn; as I am sure will always be the case. But the method I use now can be fine-tuned and personalized by others who choose to use it. That is why I thought that for this article I would walk you through the steps I take when cutting and shaping a new button. 1. 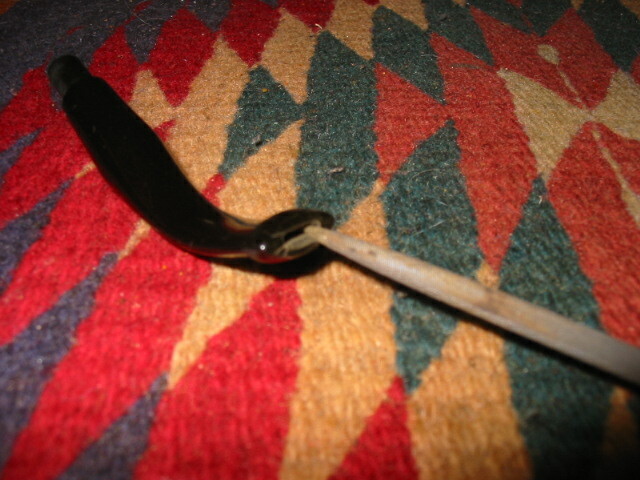 A stem that is unrepairable and has sufficient meat to it that if I remove the first ¼ inch or less still has material above and below the airway in the end of the stem. This is a candidate for reshaping and reforming a button. I often take a picture of the remaining button and angles before I trim it back. 2. 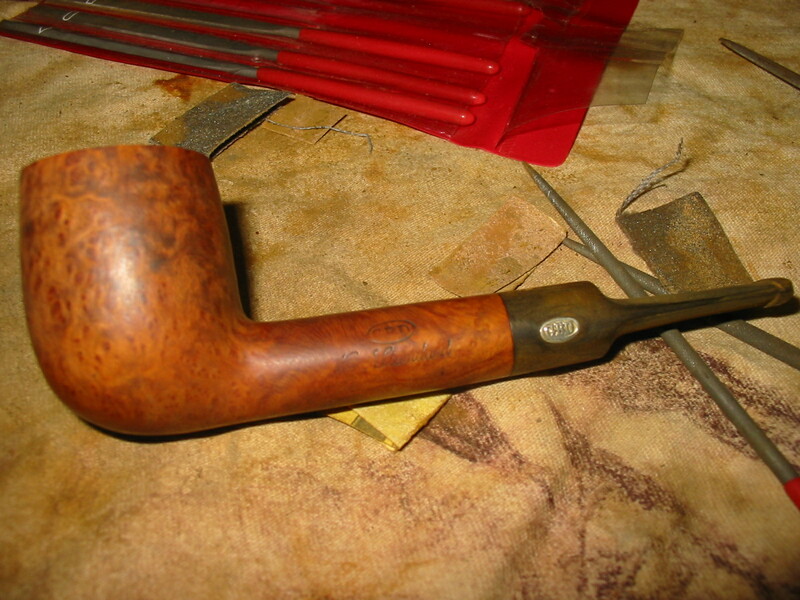 I cut off the damaged end of the stem using a Dremel with a sanding drum. I know others use various other tools for cutting it off – saws, carving tools, knives, Exacto knives and a variety of others. 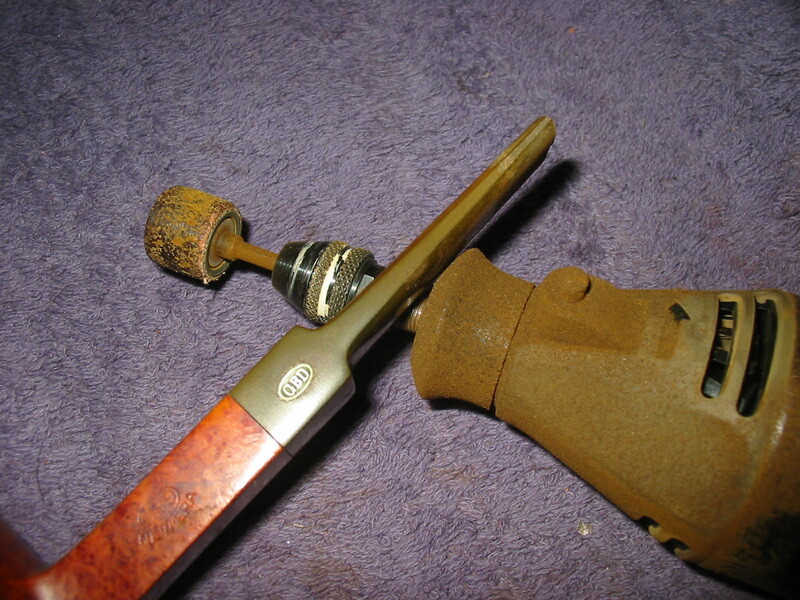 The idea here is to remove the damaged material just far enough back on the stem to leave a solid base to recarve the button. At this point the goal is to cut off the material and leave a straight line at the end. 3. 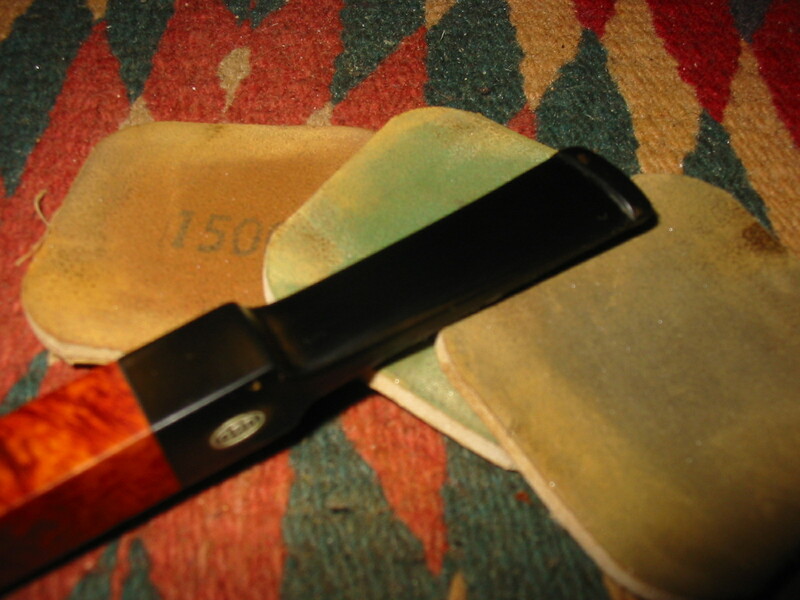 Once I have the straight edge I often trim the corners and round them slightly. My goal is to match the original button as much as possible. 4. 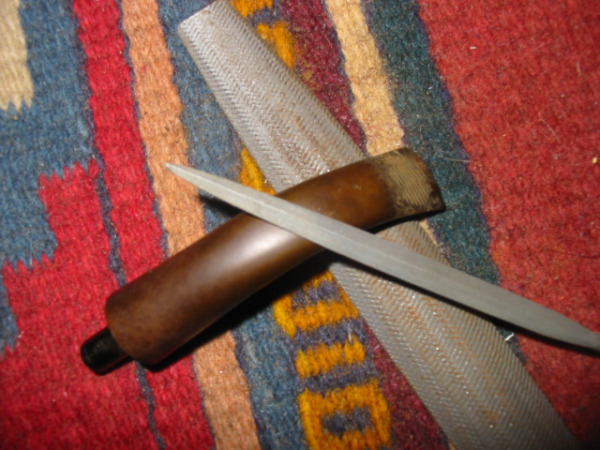 I use a sharp, straight rasp or a needle file to cut the sharp edge of the button being careful to align the top and the bottom sides of the stem. At this point I am merely marking the button area. The key here is not to make the button to broad but to aim for the original width from the end of the stem to the edge of the button. 5. I use the same needle file to carve back the stem angle from about half way up to reduce the angle to the button and give more depth to the button. 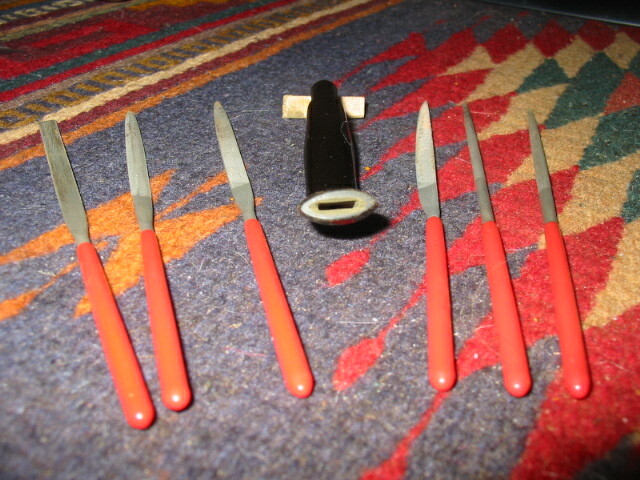 This involves using the file like a draw knife and working it from mid stem to the edge that you cut with the file. 6. 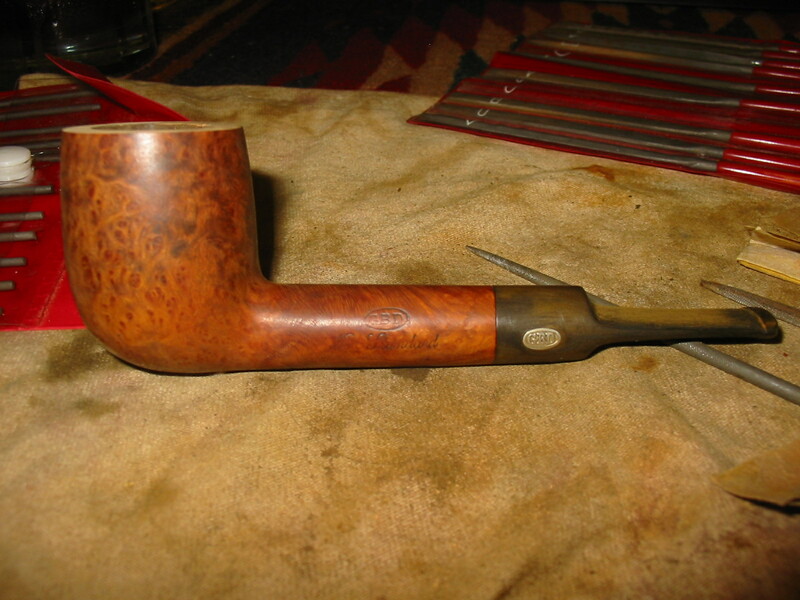 I generally start with the top of the stem and then work the underside to match the angles of the top. You have to be careful not to draw too deeply with the file as you work it. 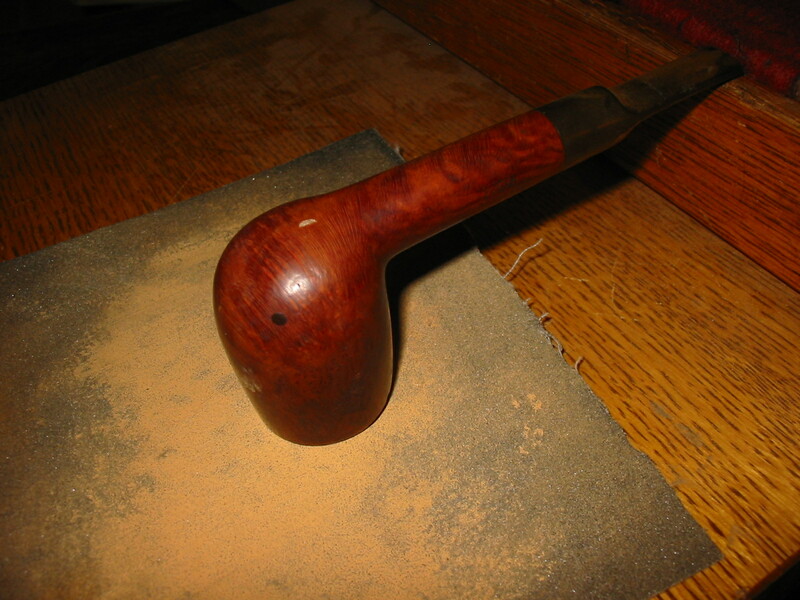 The end product of the cutting is a gentle taper that when sanded out looks natural. This process also give shape to the button. 7. 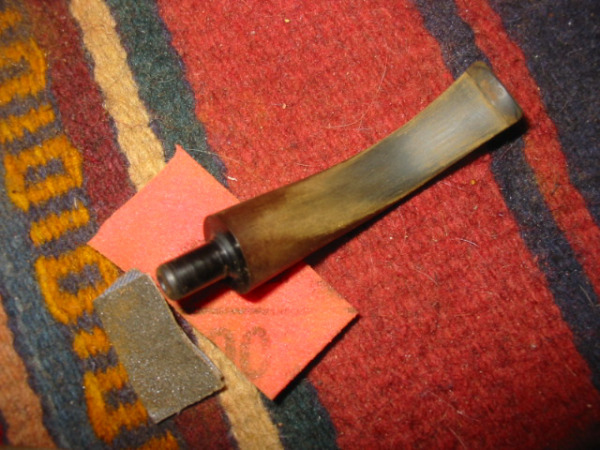 When I have the taper trimmed and even I work it over with a folded piece of 220 grit sandpaper to remove the file marks. I continue to work and shape the stem. 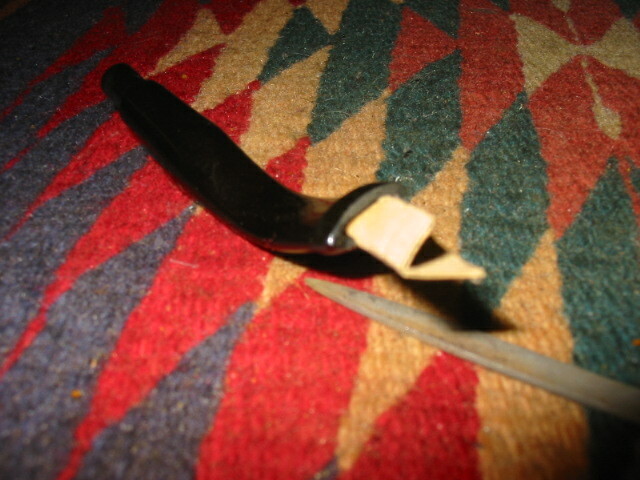 I try to crown the flat blade of the stem slightly by sanding the edges to give the stem a thin profile. This also gives shape to the button. 8. 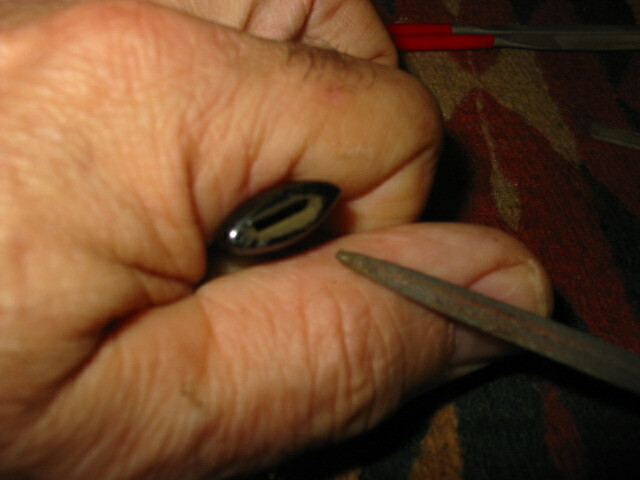 I use the sandpaper to also shape the button in a flattened oval or eye shape. 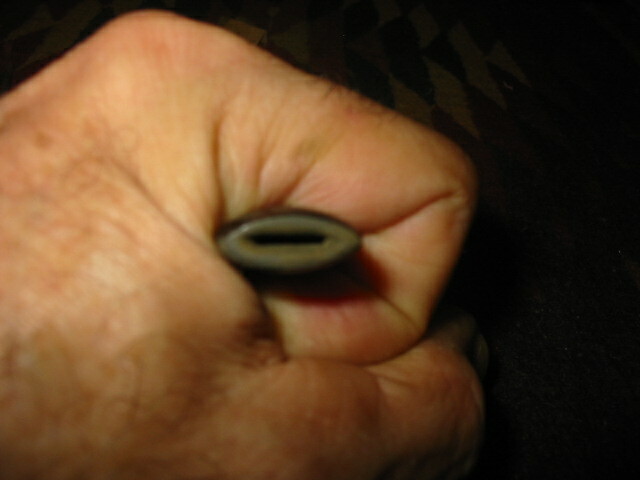 If there is room above and below the airway I also gently slope the button toward the end. I am always using the stems and buttons that I have that like as models for the final look of these reshaped buttons. 9. 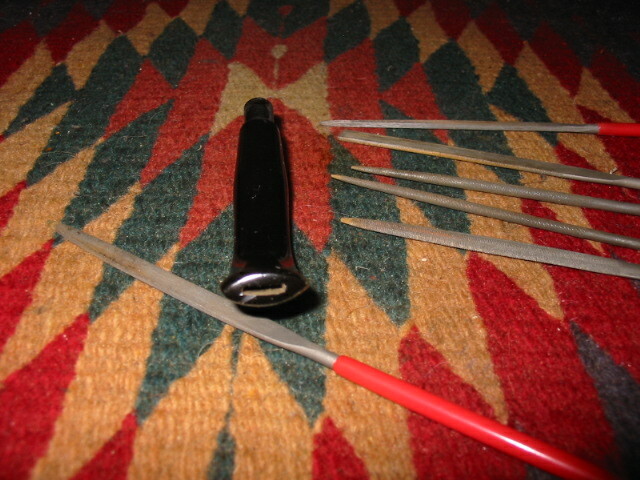 I use three different needle files to open up the slot on the end of the button. 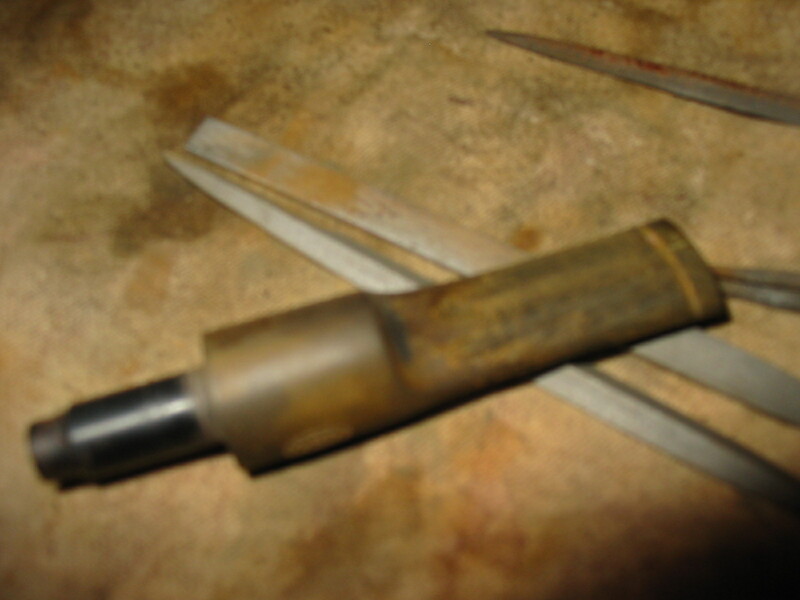 I first use a round file to open the airway and start to cut the funnel in it. When I am done with this first file the airway is beginning to look oval. 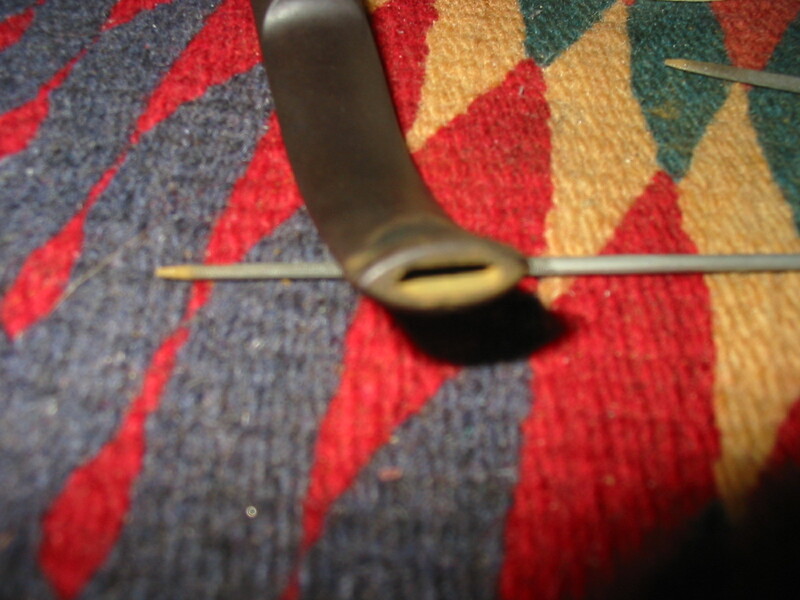 I then use a slightly oval needle file to further shape the funnel and widen it toward the outer edges of the button. 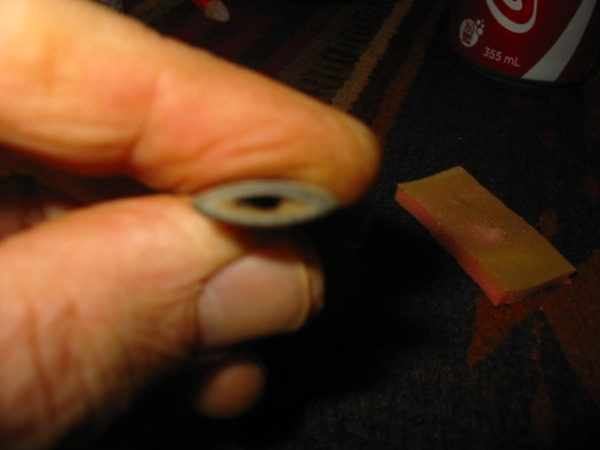 The third file is a flattened oval that gives me the ability to open the edges of the slot and the funnel so that finished airway has a flattened oval or eye shaped look to it. In general I work so that the slot has a shape similar to the shape of the button. 10. I sand the inside of the newly cut airway/funnel with folded sandpaper until it is smooth. 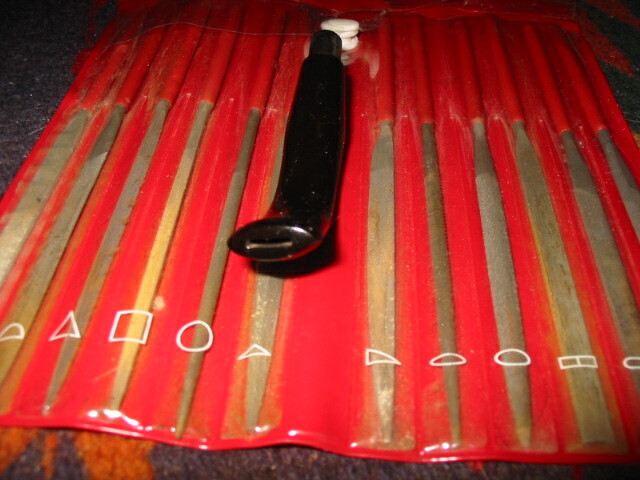 I have also used emery boards that I found in the cosmetics department of local drug stores. 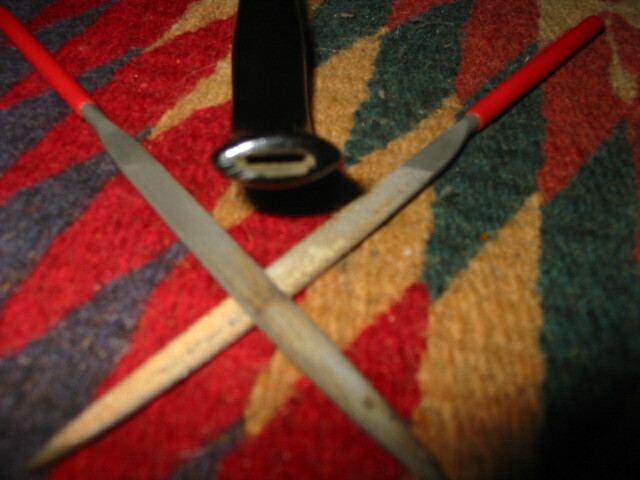 They are commonly used on fingernails but work well for the inside of the slot. 11. I fine tune the slope of the taper with medium and fine grit sanding sponges to make sure that the slope top and bottom matches. 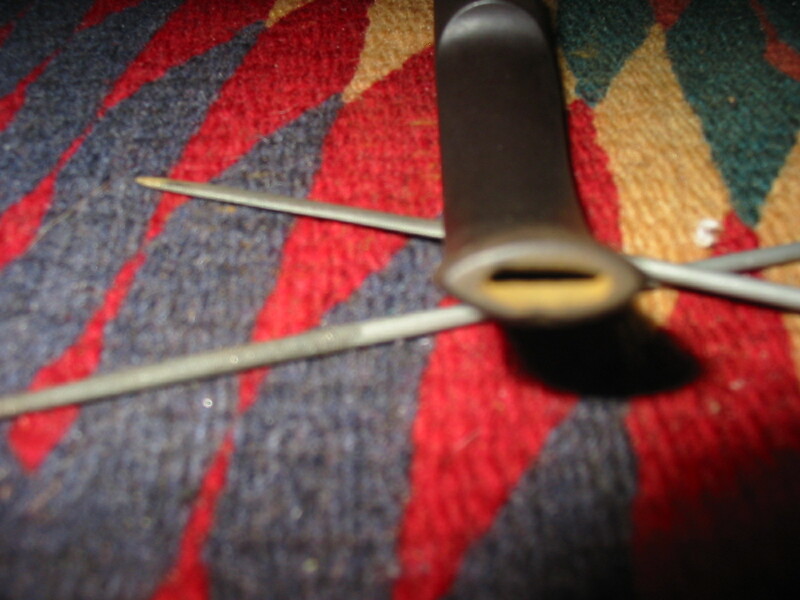 I also work on the sharp angle of the inside edge of the button to give it distinction from the slope of the stem. 12. 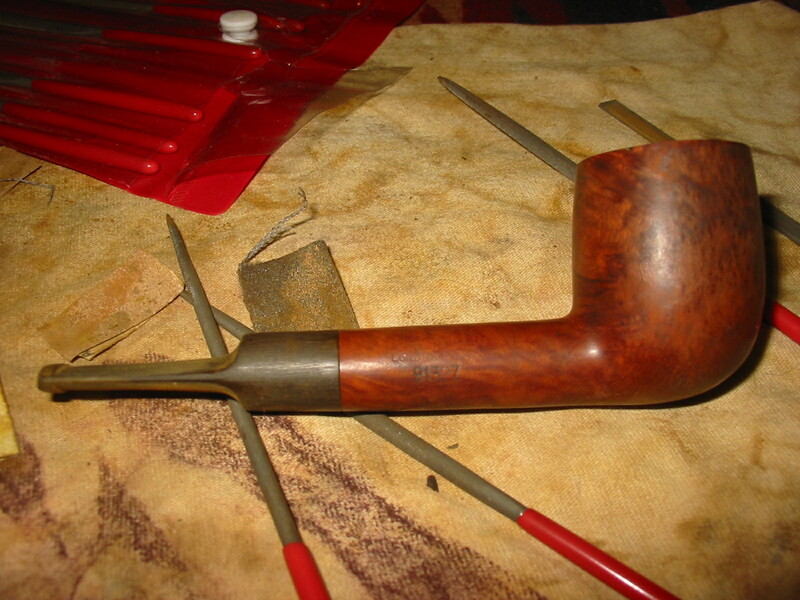 I sand the stem with micromesh sanding pads from 1500-12,000 grit to polish and bring back the deep shine. I use these on the end of the button and on the edges of the airway to make sure that the slot is smooth. 13. I buff the newly cut button and stem with White Diamond and then give it multiple coats of carnauba wax to protect and preserve it. 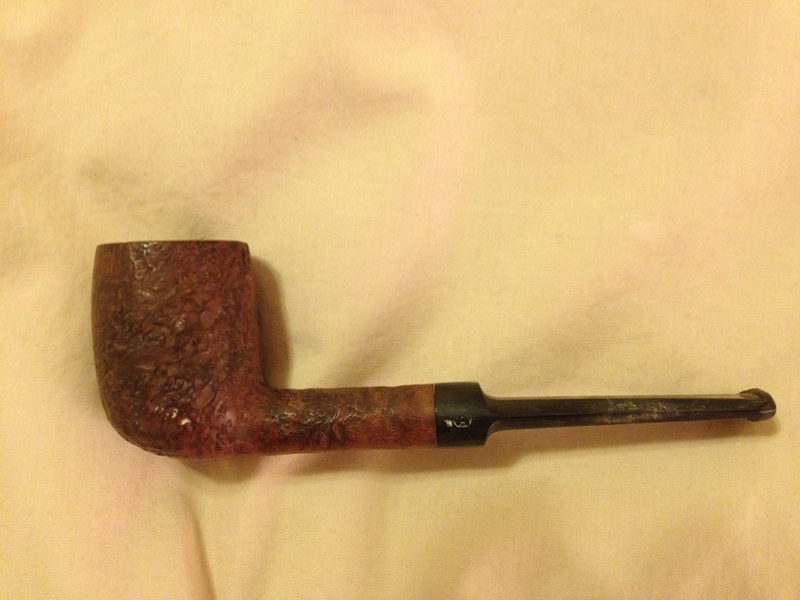 This entry was posted in Pipe Refurbishing Essays and tagged cutting a new button, opening a slot in the button, sanding a stem, shaping a stem, Stem repairs, stem work on February 25, 2014 by rebornpipes. 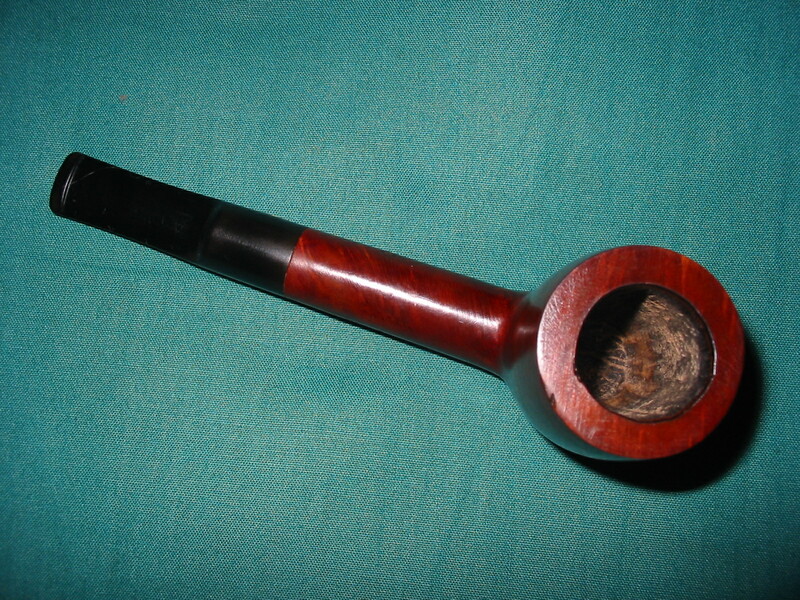 It has a deep craggy blast that attracted me to the pipe in the first place. 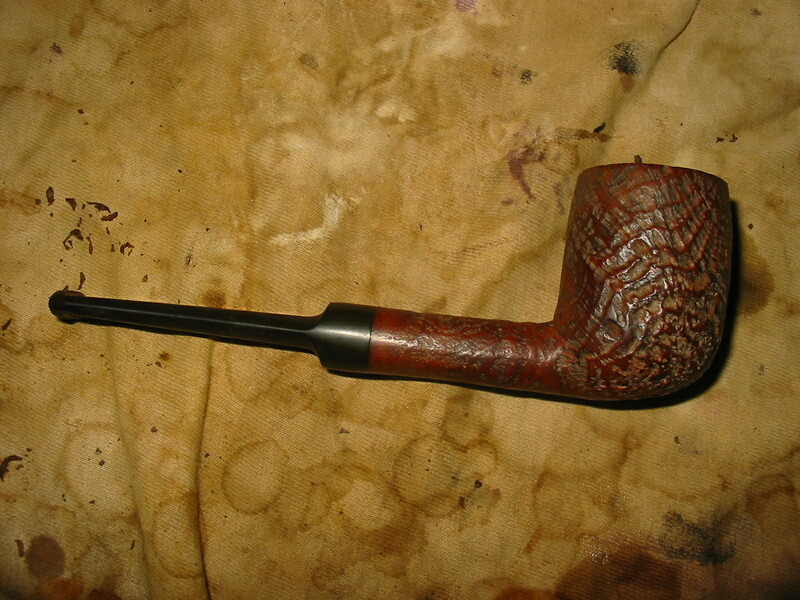 The briar was dirty and the finish was gone. The remaining stain was very spotty and dirty. 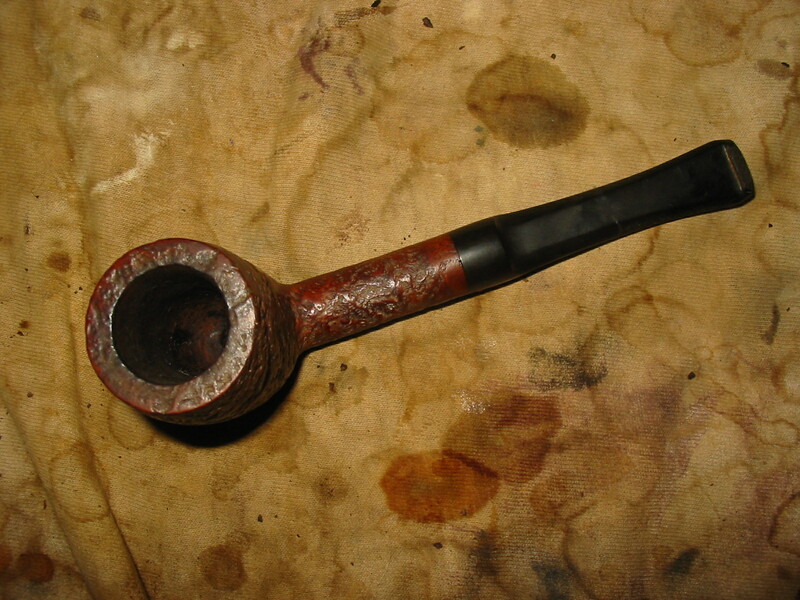 The grime of many dirty hands had ground into the blast leaving dark spots all around the bowl and shank. The state of the finish can be seen in the photo below. The bowl was dirty and had a slight cake with dottle still in the bowl. The rim had some darkening from the lighter and there was lava on the surface hiding most of the blast. 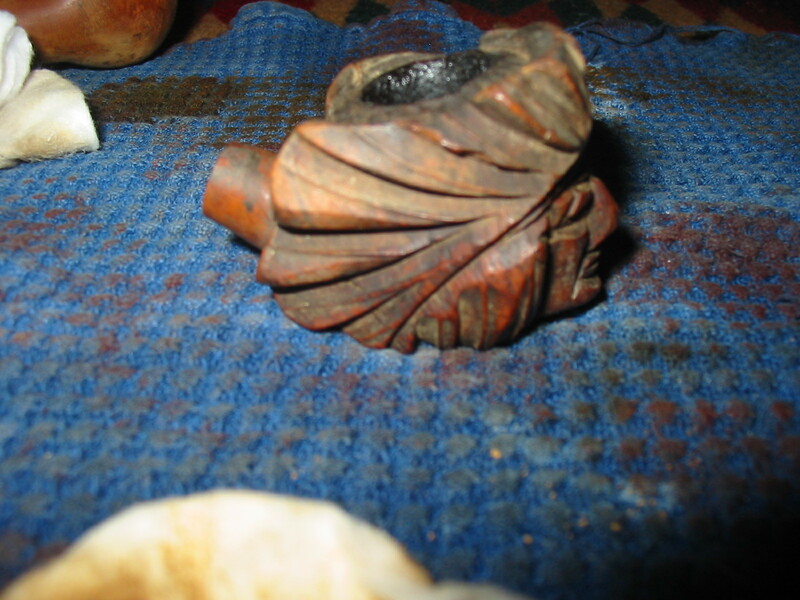 The beauty was that the bowl did not have any damage from tapping it out or burning on the edges. It would clean up very nicely. 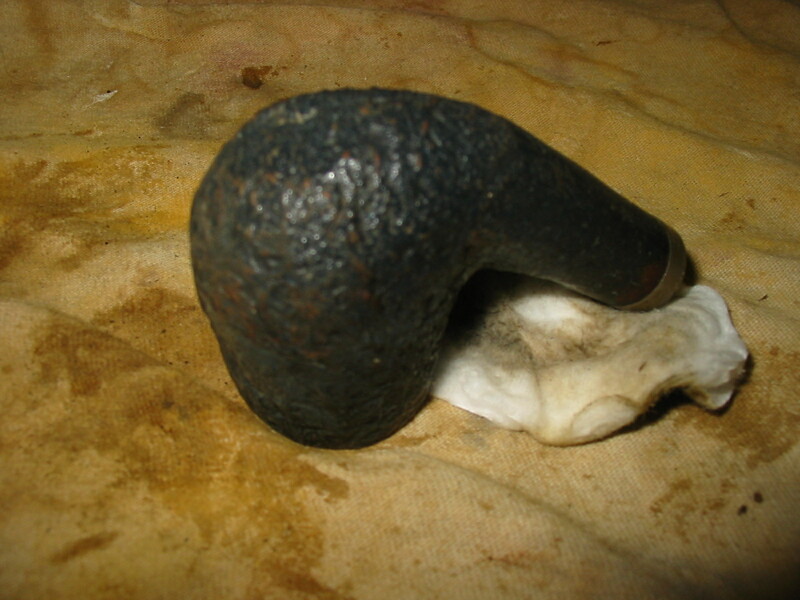 The stem was slightly oxidized and had a calcified buildup in several spots. 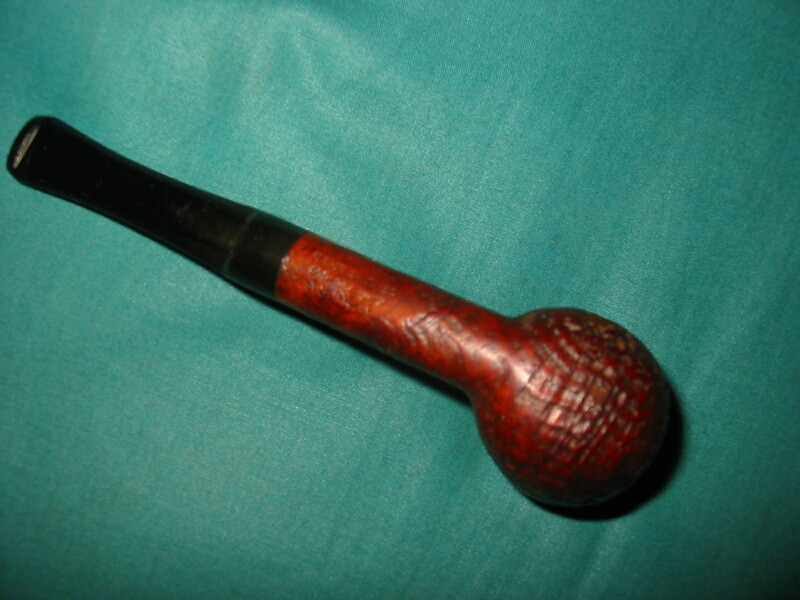 It also had a few faint tooth marks about a ¼ inch back from the button. The button itself had several dents in it as well. The slot in the button was too tight to even take a thin pipe cleaner. 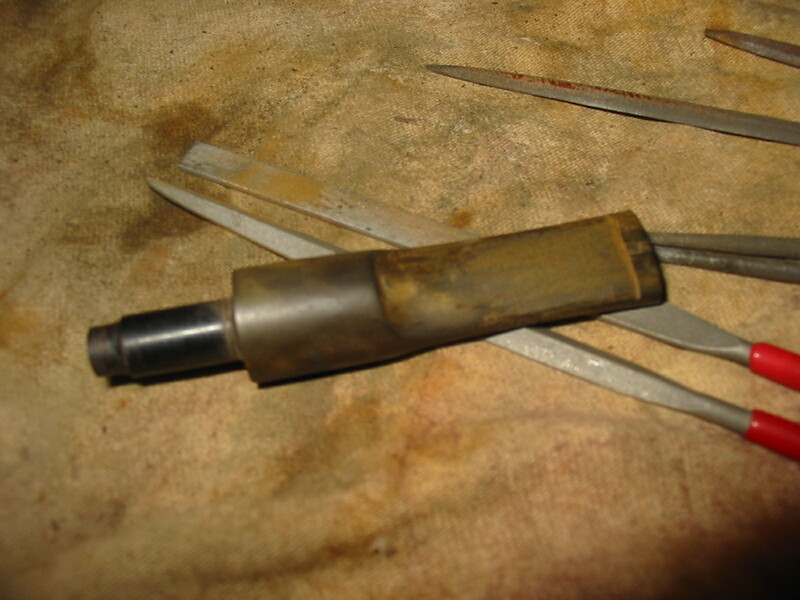 The inside of the shank was thick with a tarry buildup and the stem was clogged with buildup as well. 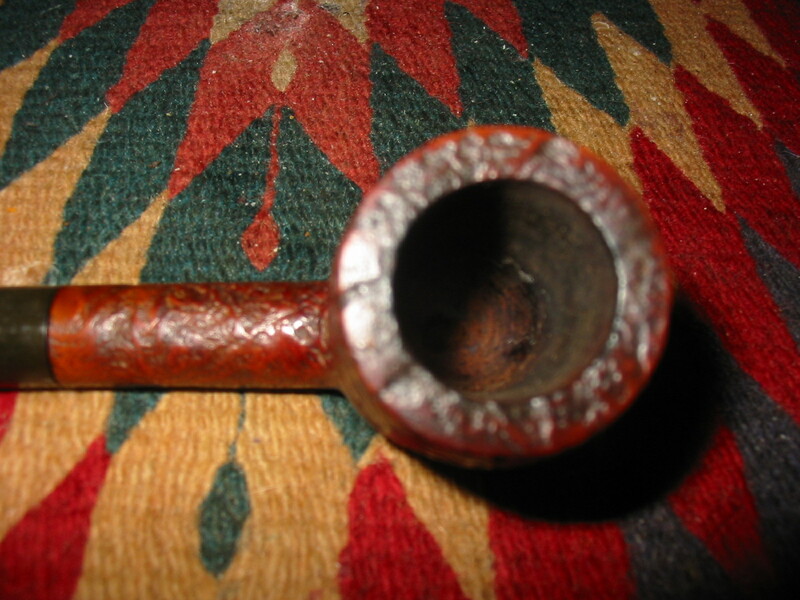 I am pretty sure the stem had never been cleaned out as a pipe cleaner would not pass through the slot. 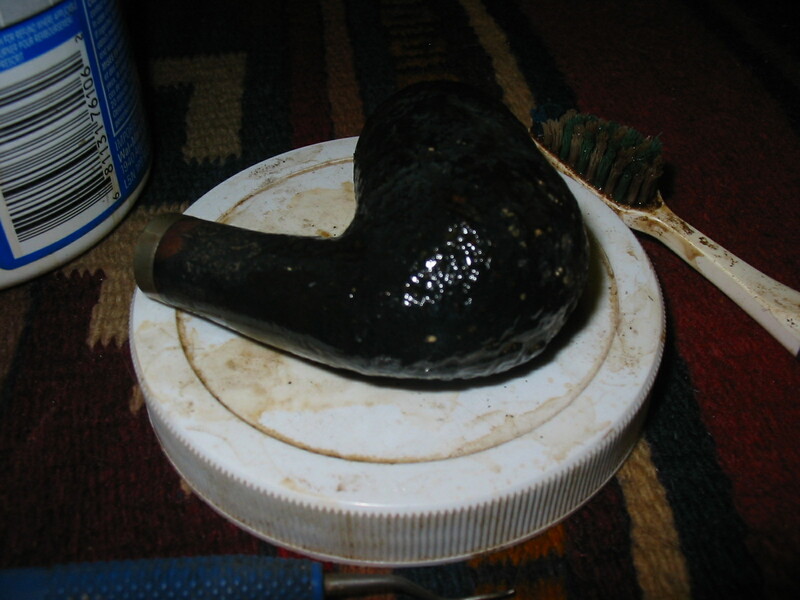 I removed the stem from the bowl and dipped the bowl in an alcohol bath and scrubbed it with a brass tire brush to remove the grit and grime in the blast. I then dropped it into the bath to soak overnight. In the morning I removed it from the bath and gave it another quick scrub with the tire brush. I flamed the alcohol in the bowl to dry it before I cleaned it. This is a simple process of lighting the alcohol on fire with a lighter. It burns blue and burns fast. 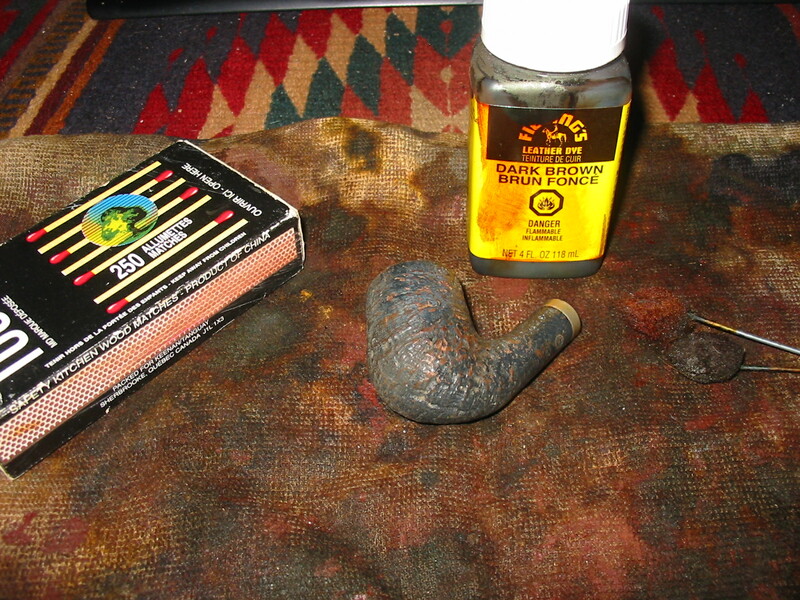 No harm is done to the briar. 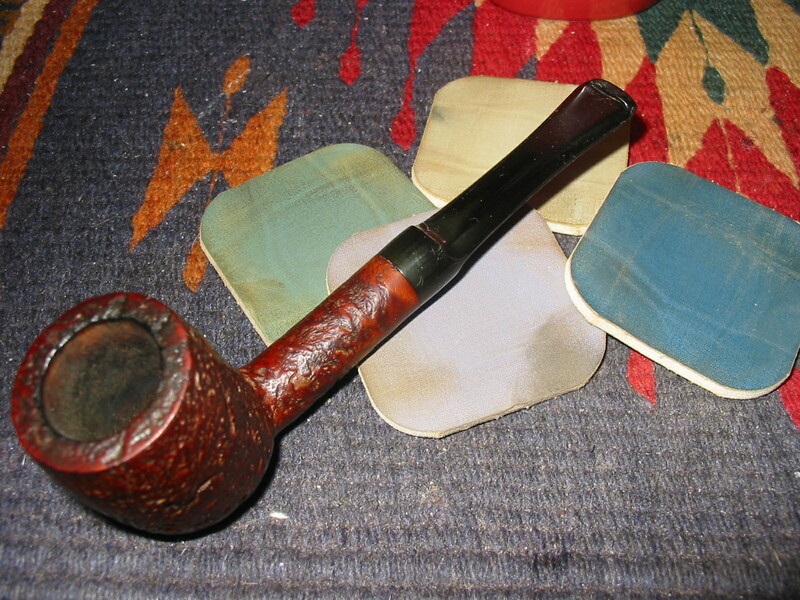 I then cleaned the bowl and shank with pipe cleaners to remove as much of the tars and oils as I could before I used the retort to give it a final cleaning. 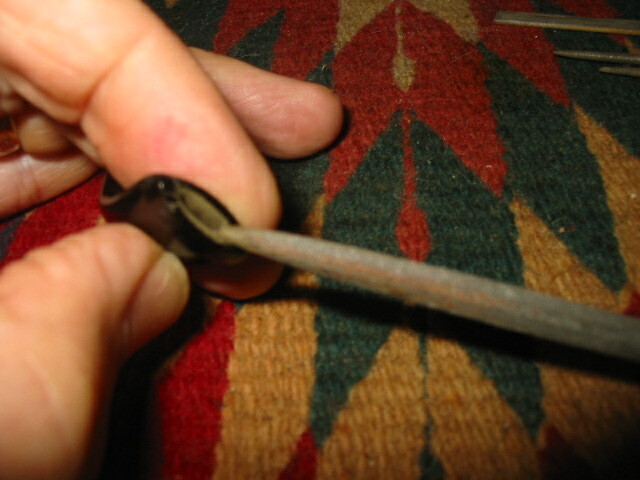 I decided to open up the button with needle files before I used the retort on the pipe. 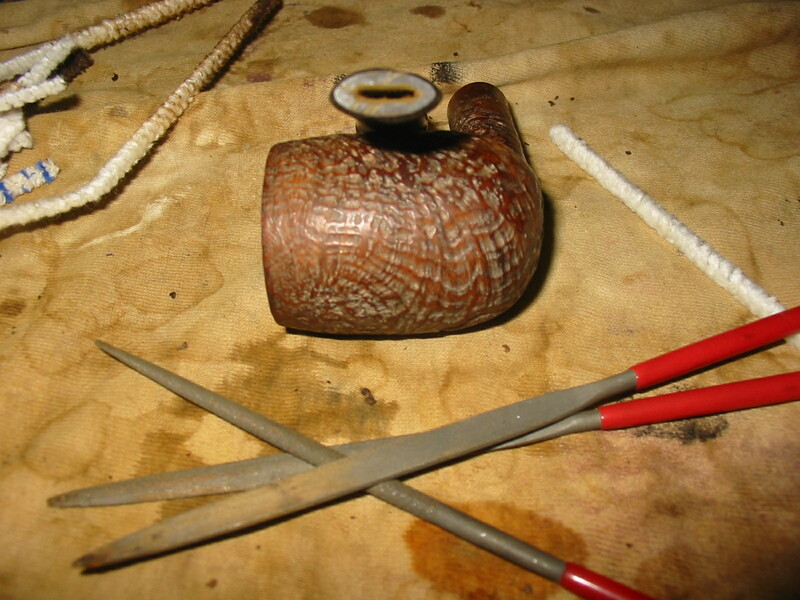 I was unable to run a pipe cleaner through the stem so I wanted to be able to remove some of the grit before I hooked up the retort. I used three different needle files to open the slot. The next four photos show the opening of the slot from start to finish. 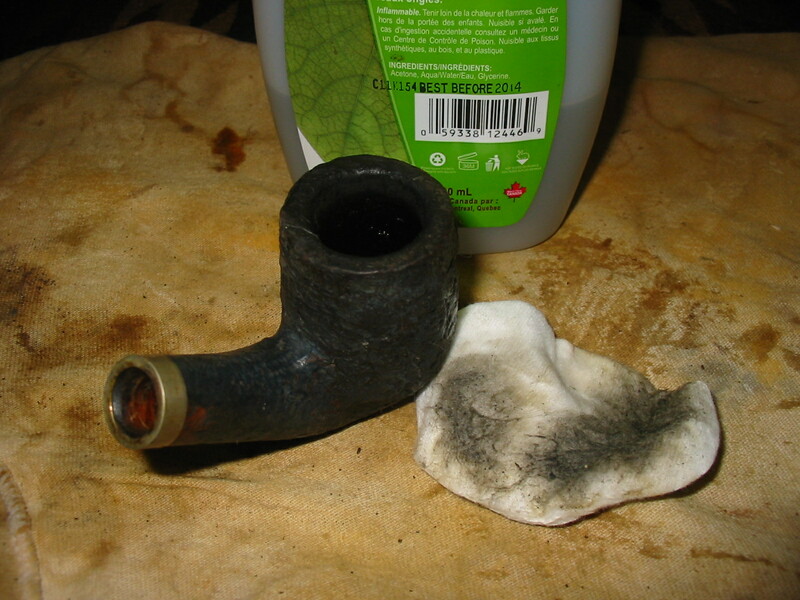 When I was done a pipe cleaner went through very easily and I was able to remove much of the tars and oils from the stem. To finish the reformed slot I used some folded medium grit emery paper and then 340 grit sandpaper to smooth out the new edges and give it a finished look. I also sanded the surface of the button to remove the scratches from the files. 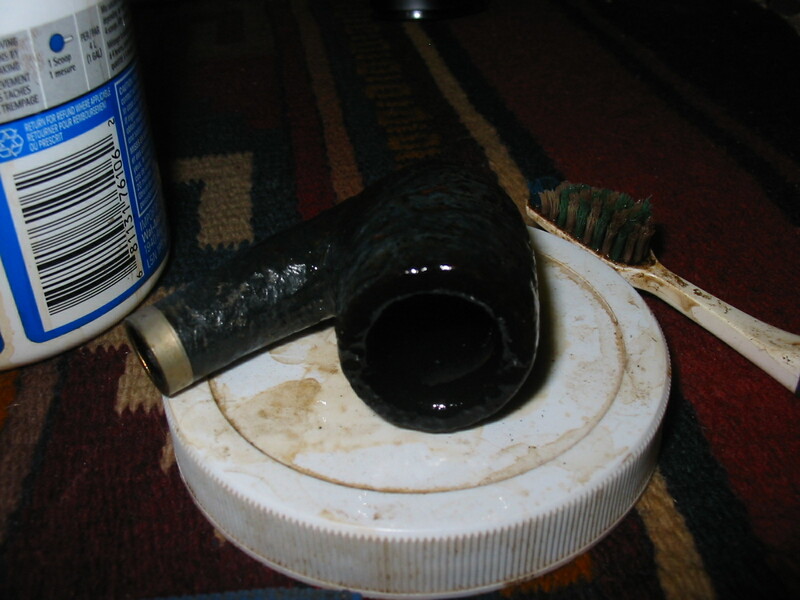 Once that was done put the stem back on the pipe and ran a few more pipe cleaners dipped in Everclear through to clean out the airway. The next two photos show the pipe at this stage in the cleanup. With the slot opened and the interior surface cleaned it was time to set up the retort. I placed a cotton boll in the bowl to keep the boiling alcohol from coming out the top of the bowl. 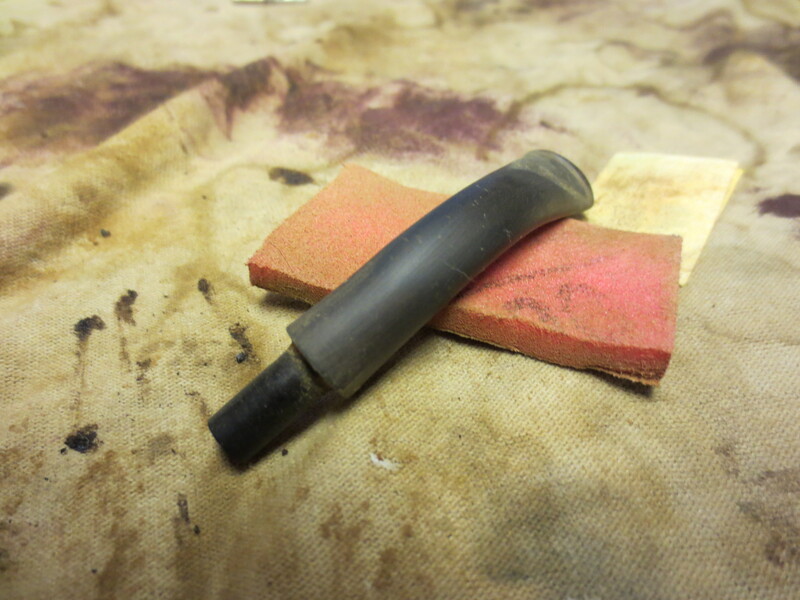 I slid the rubber surgical tubing over the end of the stem and slid it on about ½ an inch. I want a good tight seal at this point because as the alcohol boils it can bubble out the sides of the stem and give a good burn while you are holding the stem. 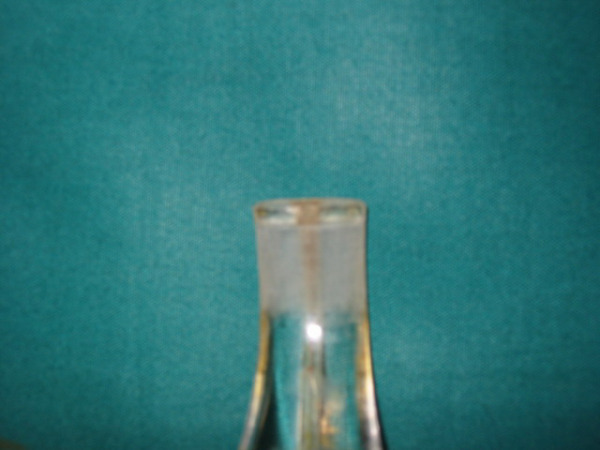 I put about 1 inch of 99% isopropyl in the test tube and put the rubber stopper in place in the mouth of the tube. 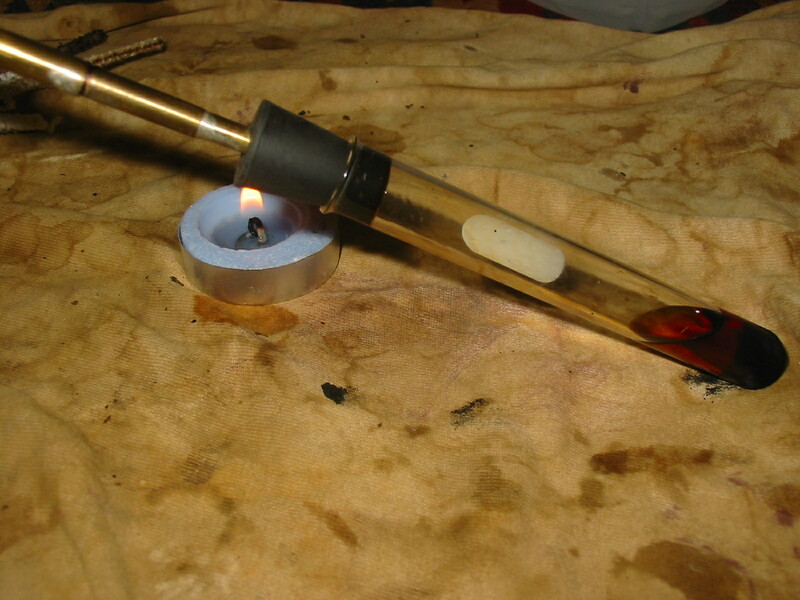 I lit a small tea light and held the bottom of the test tube over the flame. 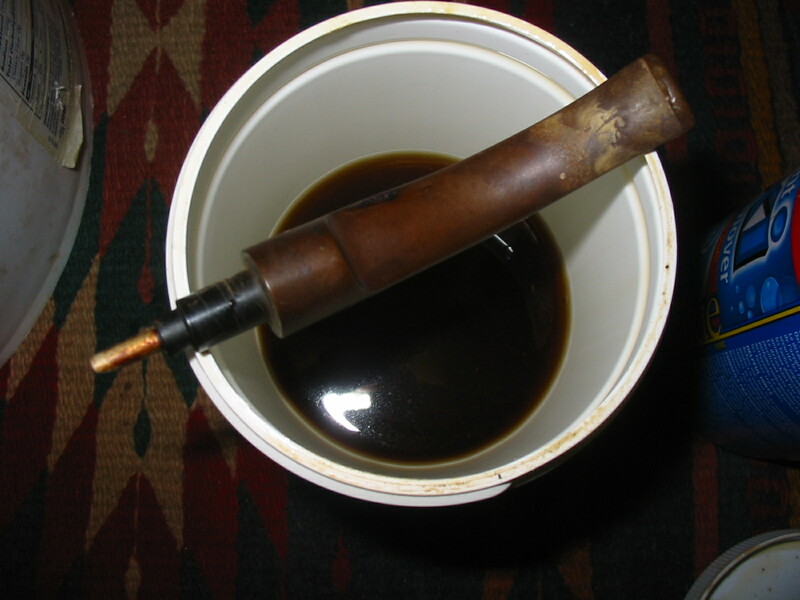 The alcohol has a low boiling point so it does not take long for it to boil and the gaseous alcohol migrates up the surgical tubing and into the stem, shank and bowl. 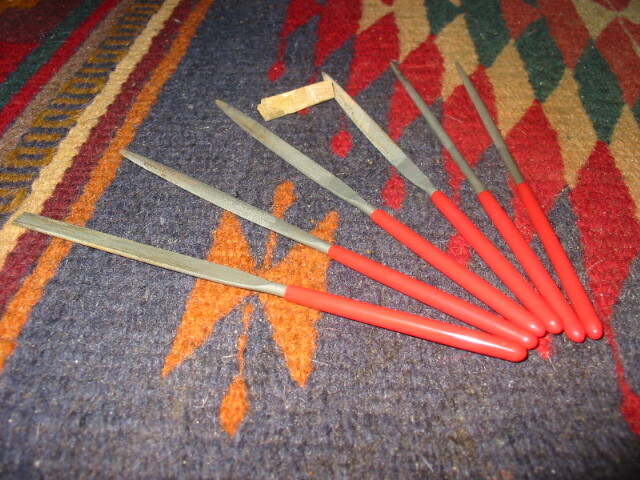 It is great to feel the shank warm up as the alcohol moves into the shank. I remove it from the flame after several minutes and let it cool off. 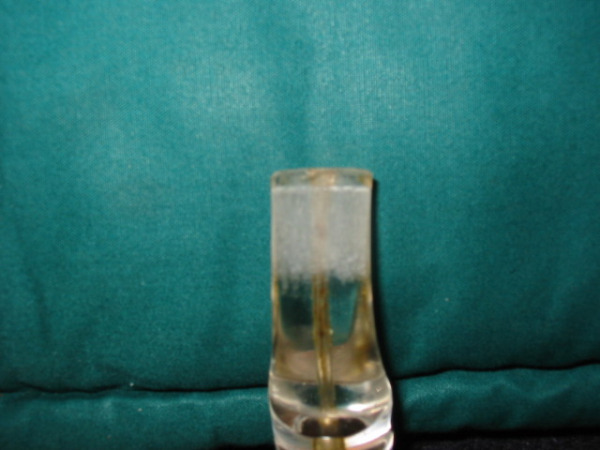 As the alcohol cools it runs back into the test tube and cools. The next series of three photos show the heating and boiling process. As it cools the alcohol migrates back into the tube. 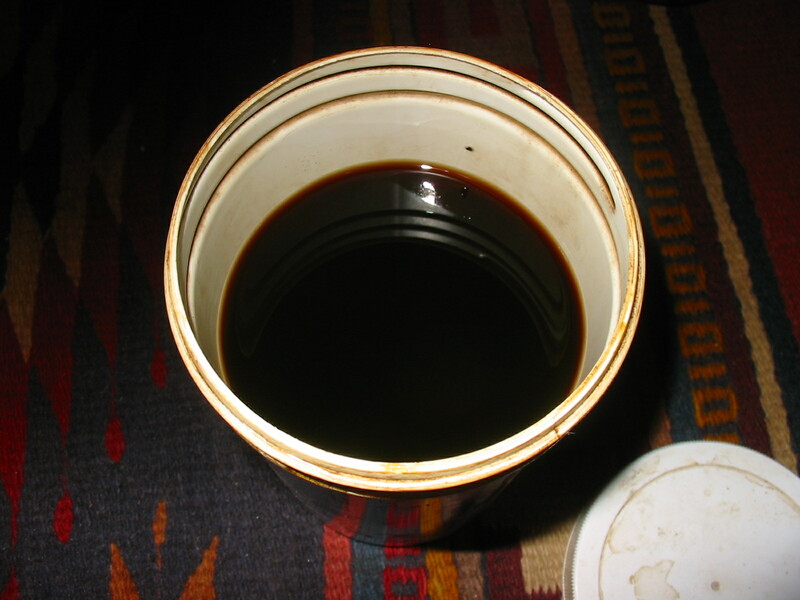 It is generally a very dark amber colour – like nice amber ale! 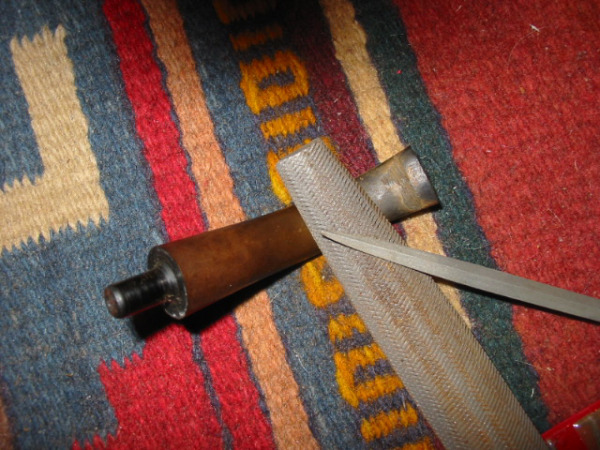 In the first photo below show the tube removed from the flame and the alcohol beginning to refill the tube. The flame is actually behind the stopper not under it – lest anyone wonder about that. I blew out the candle at this point and continued to let the alcohol cool and drain. 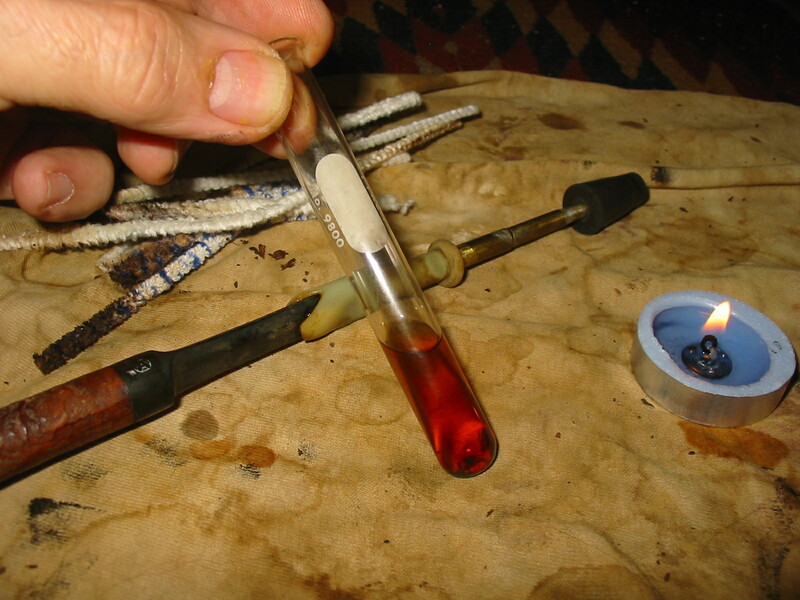 I then poured out the dirty alcohol, rinsed the tube with warm water, dried it out and refilled it. I reattached the apparatus and used the retort a second and third time until the alcohol came out as clean as when I started using it. 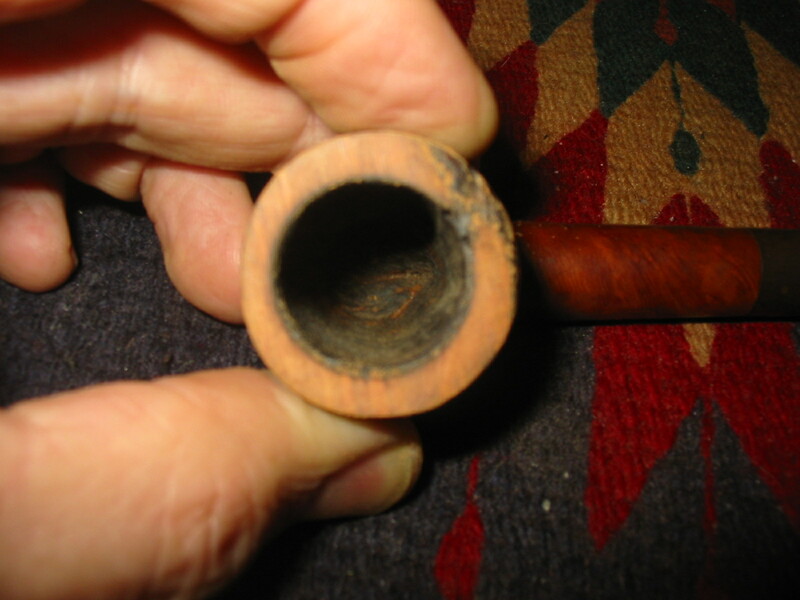 Once the insides were clean I used a soft bristle tooth brush and some isopropyl to scrub down the exterior of the bowl to prepare it for restaining. 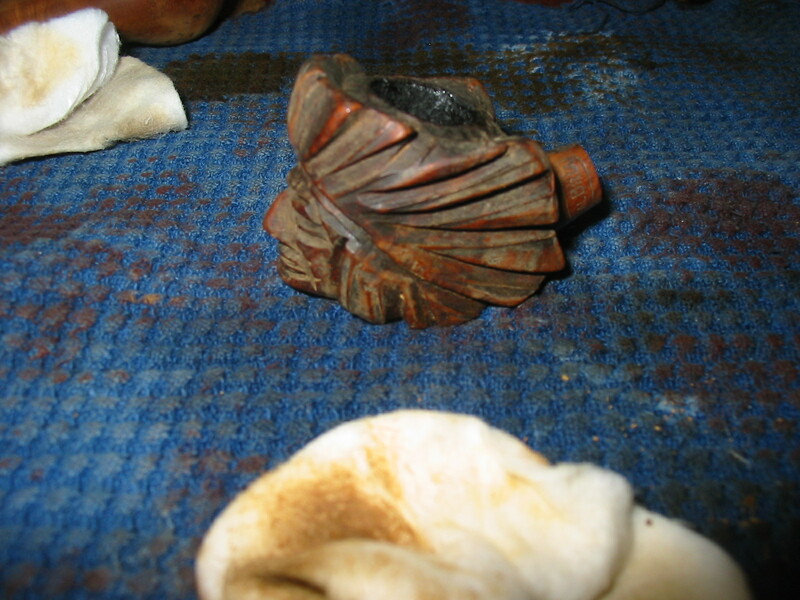 The next four photos show the scrubbed and prepared bowl. 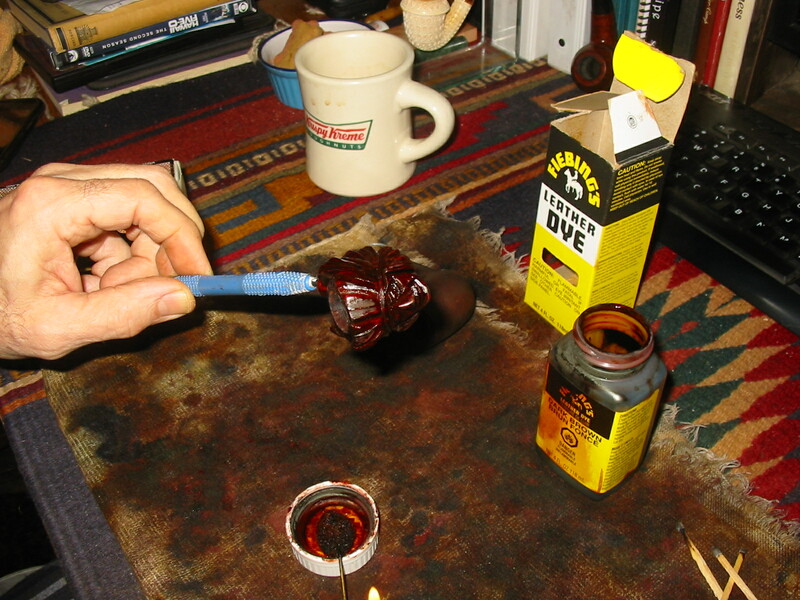 I chose to restain the bowl with a dark brown aniline stain that I thinned 2:1 with isopropyl alcohol. 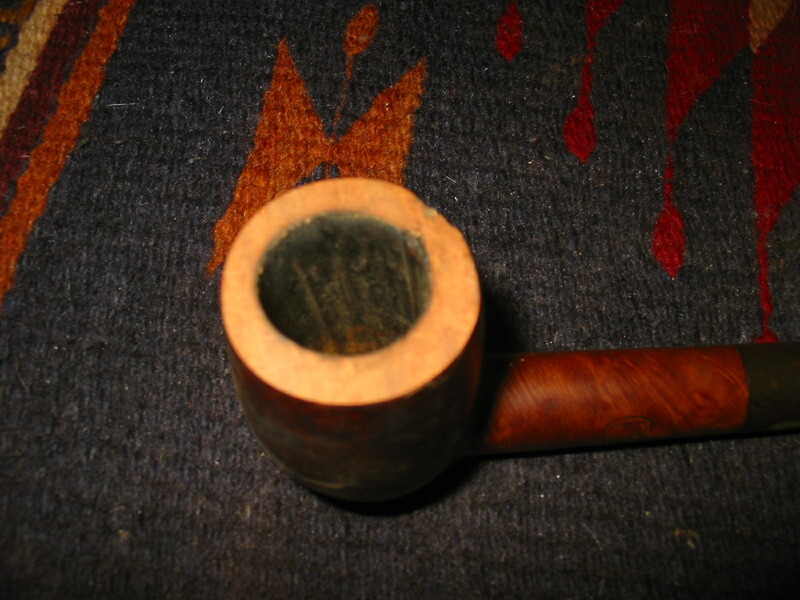 I applied the stain heavily to the pipe with a folded pipe cleaner to make sure I got it into the nooks and crannies of the sandblasted surface. Once it was covered I flamed it with a lighter to set the stain. I gave it a second coat of stain and flamed it a second time. Once it was dry I buffed it with a shoe brush to get a soft shine on it. The next series of four photos show the restained bowl after the buffing with the show brush. 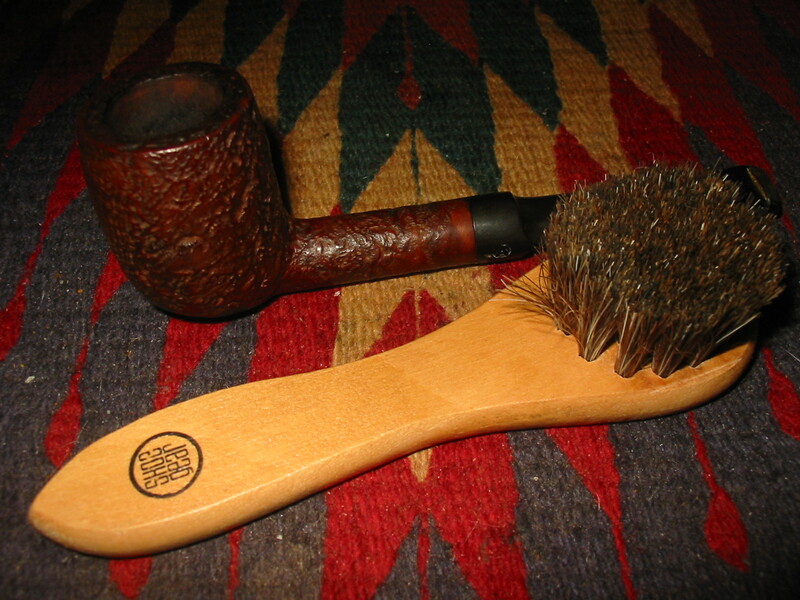 I find that the bristles on the shoe brush work really well to buff sand blasted and rusticated pipes. 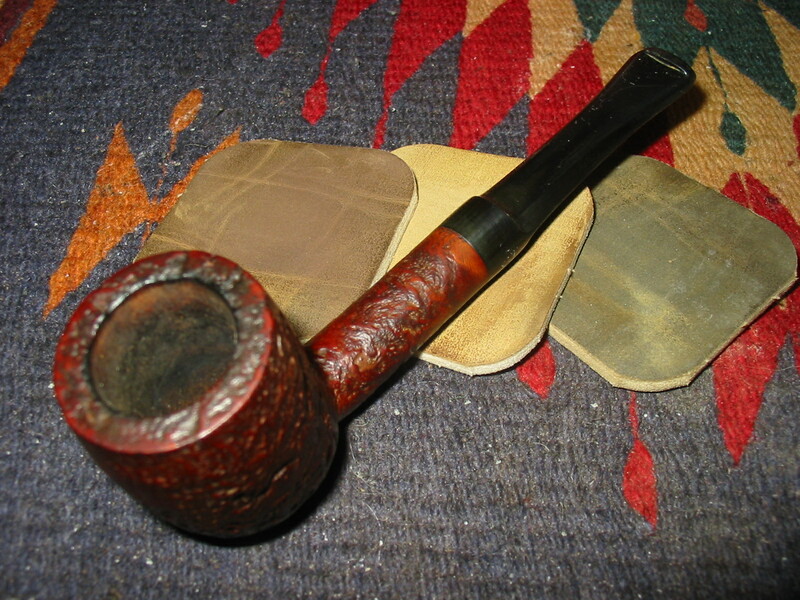 I used to use my buffer and keep a light touch on the wheel because I did not want to soften the ridges of the blast. I have since resorted to using the shoe shine brush instead. 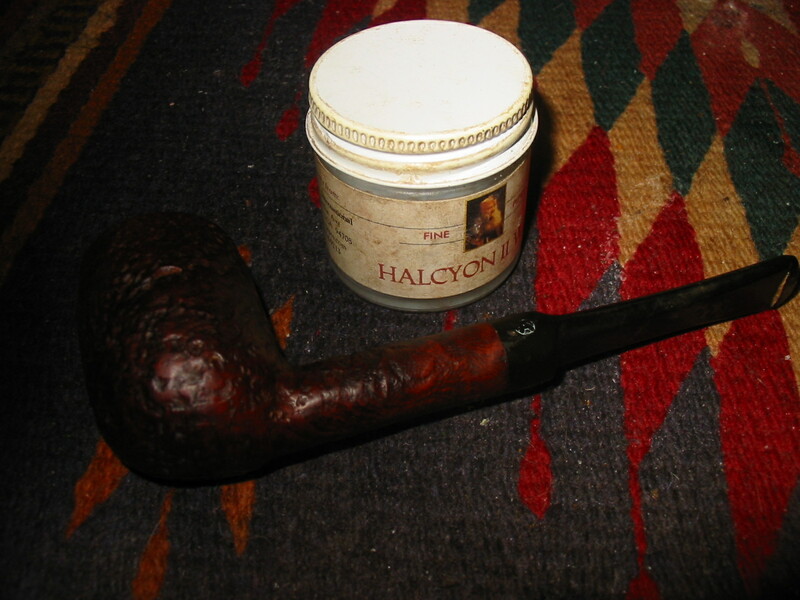 I hand applied some Halcyon II wax to the bowl and shank and buffed it a second time with the shoe brush to give it a shine. 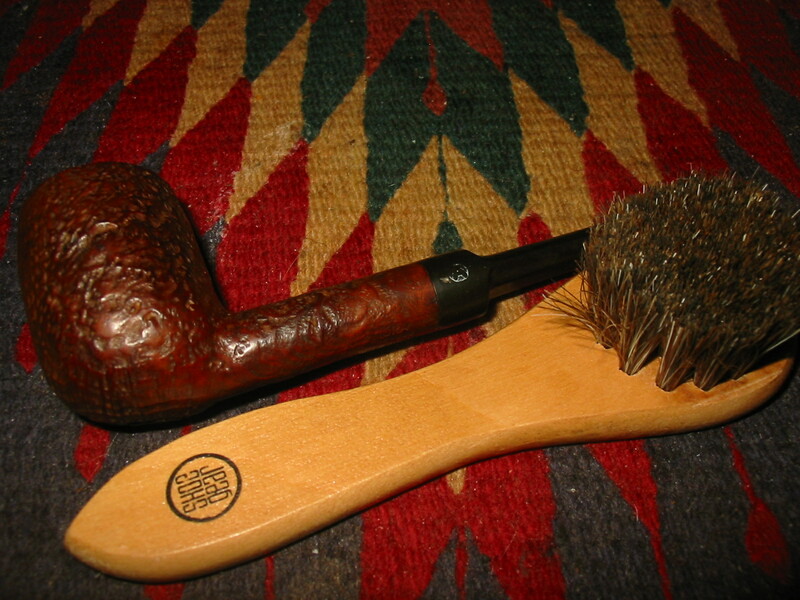 The next series of six photos show the bowl and shank during and after the shine with Halcyon II and the shoe brush buffing. 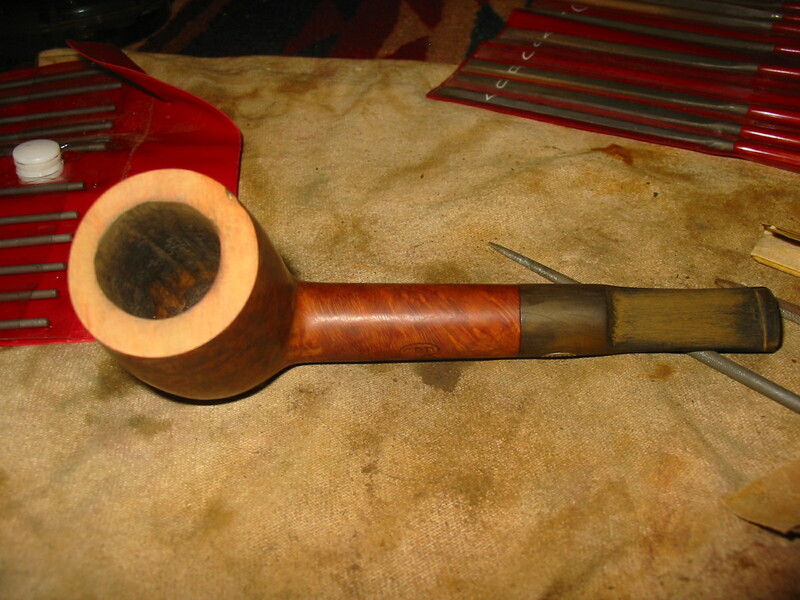 After finishing the bowl it was time to work on the stem. I sanded the blade area where the tooth marks were to cause them to stand out a bit more clearly. I used a fine grit sanding sponge first. I then heated the slight tooth dents with a Bic lighter to lift them. I find that this works very well for light dents in vulcanite. 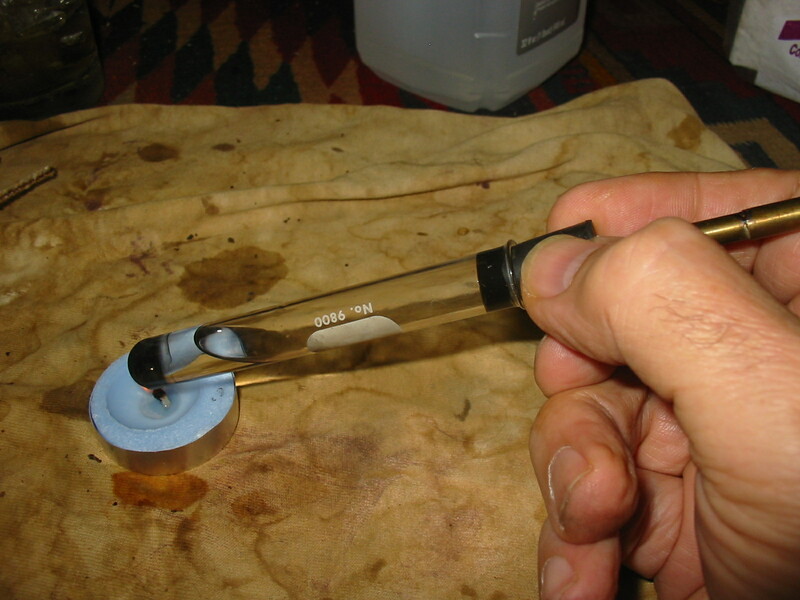 I do not leave the flame in one place but move it quickly across the surface of the dent and it literally lifts with the heat. I then wet sanded the stem with 1500-2400 grit micromesh sanding pads and followed that by dry sanding with 3200 and 3600 grit micromesh pads. The next series of eight photos gives you a look at the progress of the sanding. 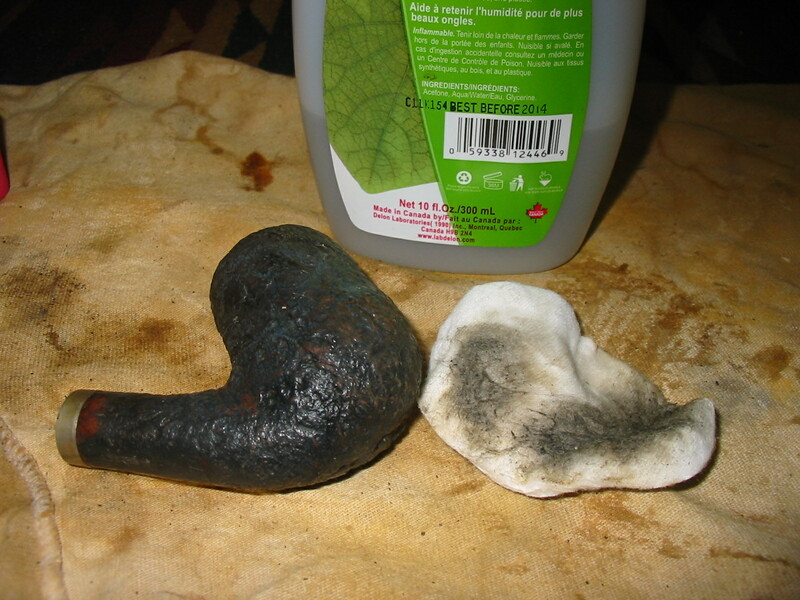 At this point in the process I wiped down the stem with Obsidian Oil and rubbed it into the vulcanite. I wanted to see where the remaining oxidation was so that I could do some more work on those areas. I continued sanding the stem with 4000, 6000, 8000 and 12,000 grit micromesh sanding pads. 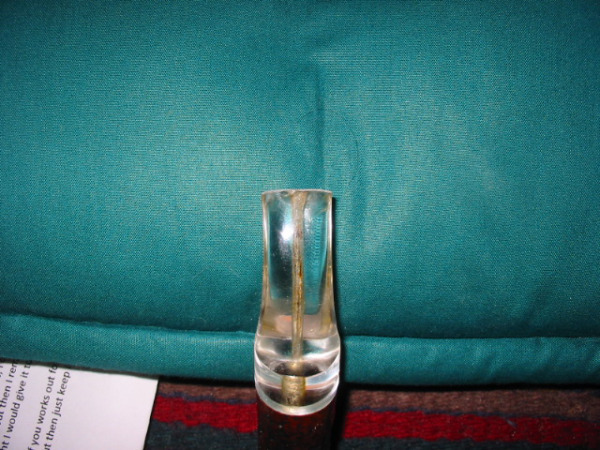 The next three photos show the progress of the shine on the stem. 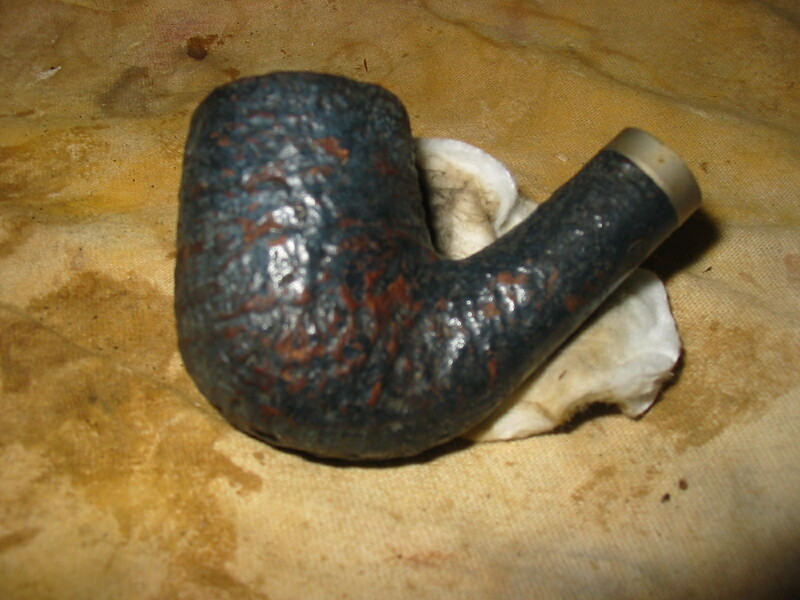 There was still some deep seated oxidation on the stem. I used a Bic lighter and went over the surface of the stem to burn off the oxidation. 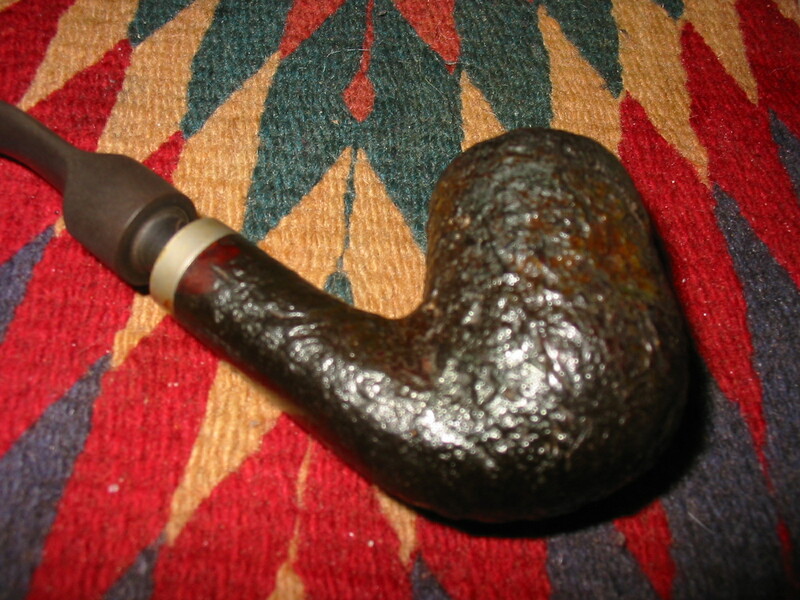 I wiped it down with a soft cloth and repeat the process until the stem was a shiny black and the oxidation was gone. 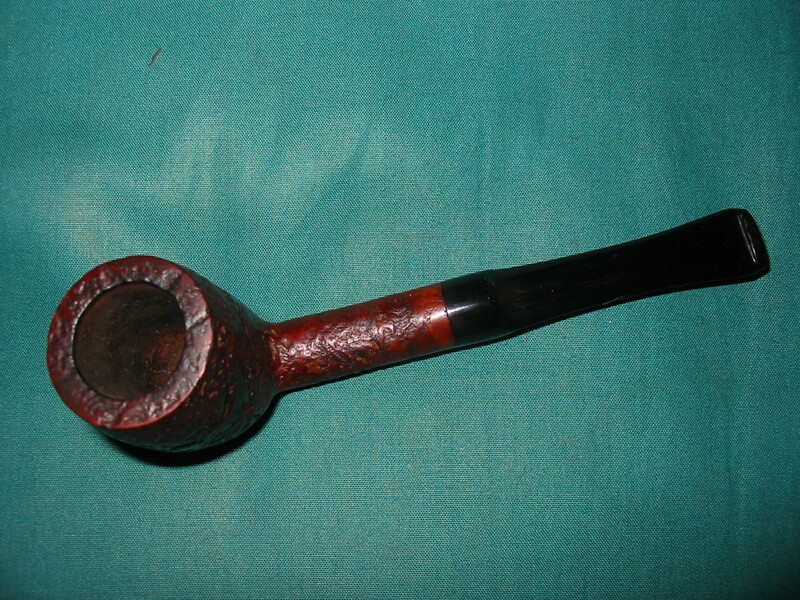 The final series of four photos show the finished pipe. 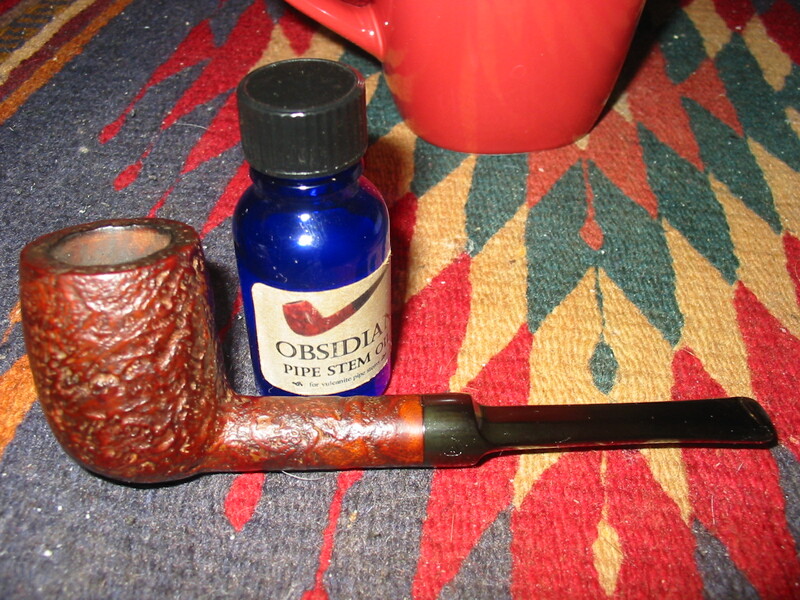 I gave the stem a final rub down with Obsidian Oil and I buffed the stem on my buffing wheel (attached to the bowl) using White Diamond. I did not buff the bowl. 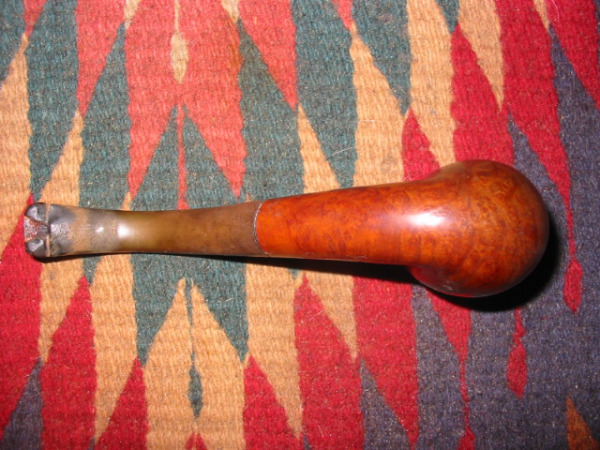 I gave the stem several coats of carnauba wax and then buffed it with soft flannel buffs. 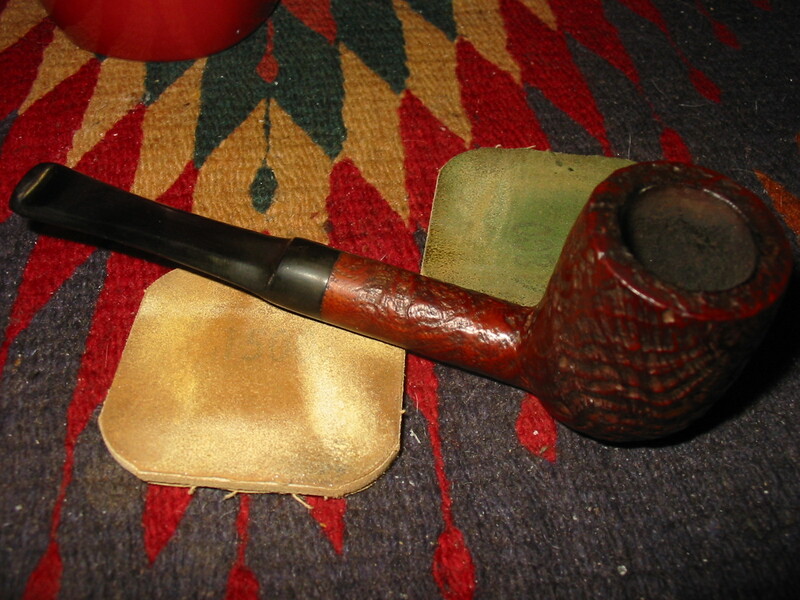 I also rebuffed the bowl by hand with the shoe brush. 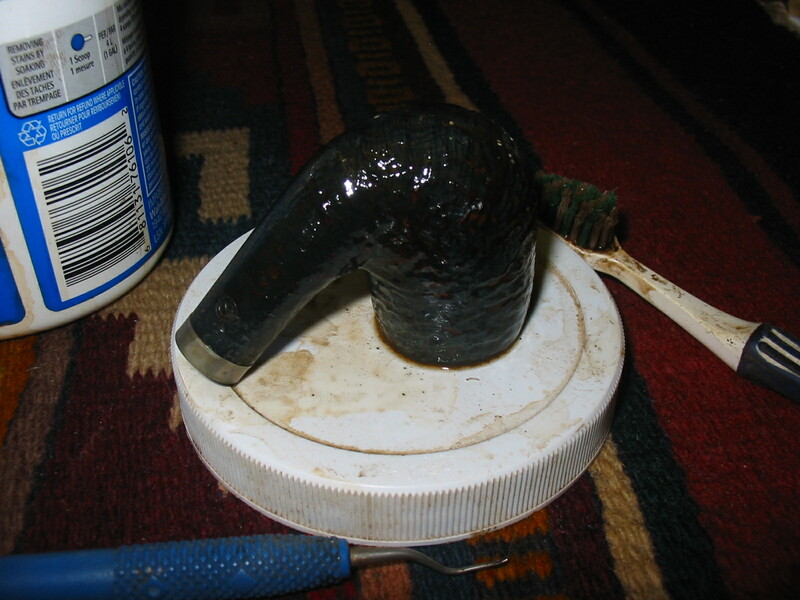 The pipe smells fresh and clean. It is ready to smoke. 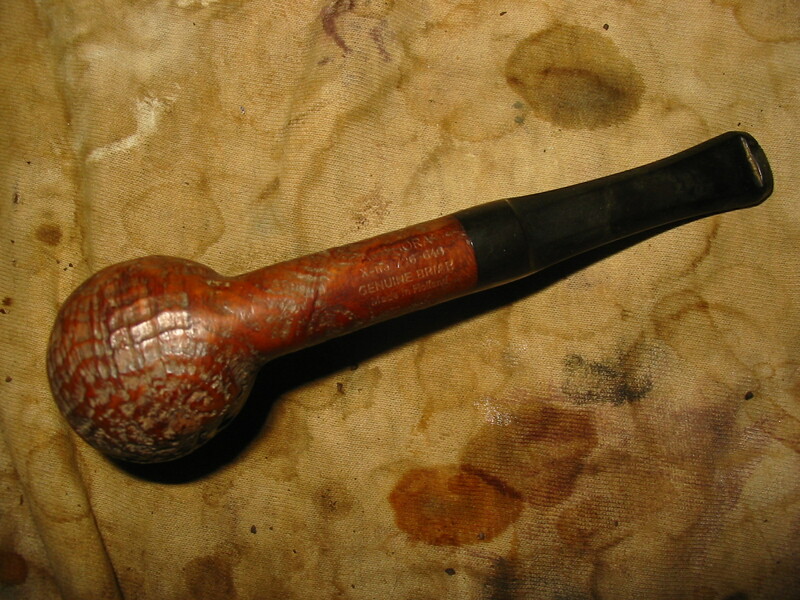 This entry was posted in Pipe Refurbishing Essays and tagged Amphora pipes, Amphora Sandblast pipes, Bowl - refinishing, lifting tooth marks from a vulcanite stem, opening a slot in the button, oxidized stems, refinishing a bowl and rim, repairing bite marks in vulcanite, stem work, using a retort on May 18, 2013 by rebornpipes. 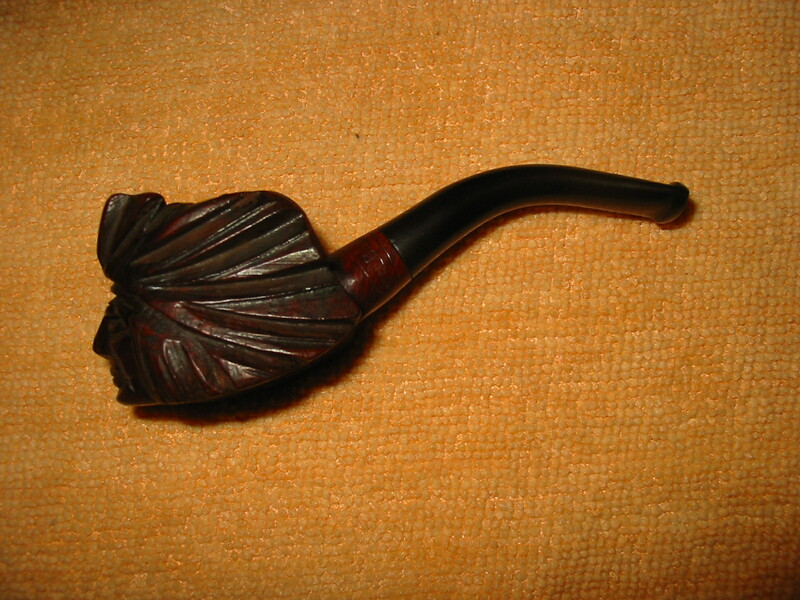 I received this figural pipe in the lot of six that came to me from a friend on Smokers Forums. 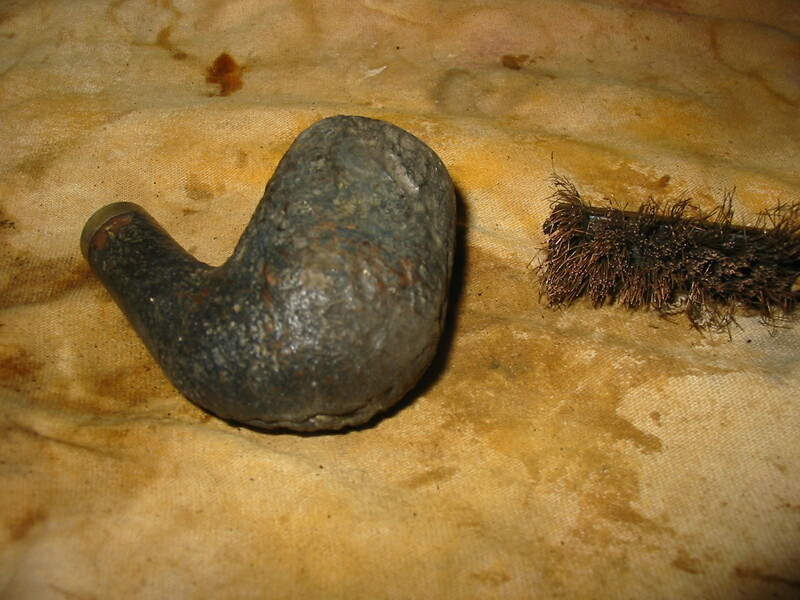 It is a tiny pipe – measuring just over 3 ½ inches in length. 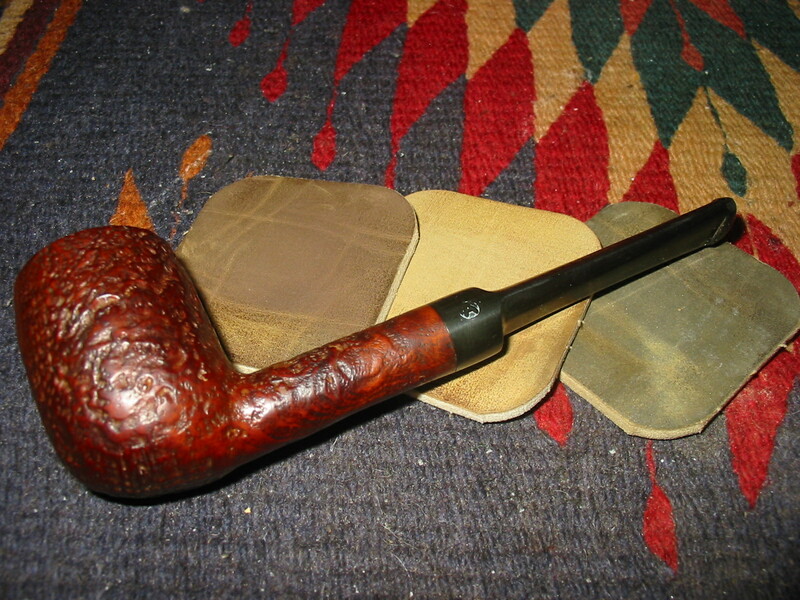 It is stamped only Real Briar in a band around the shank. The carving of a First Nations Leader (as we call them here in Canada) or Native American (US) is nicely done. The bowl was cake with a rough layer of cake. 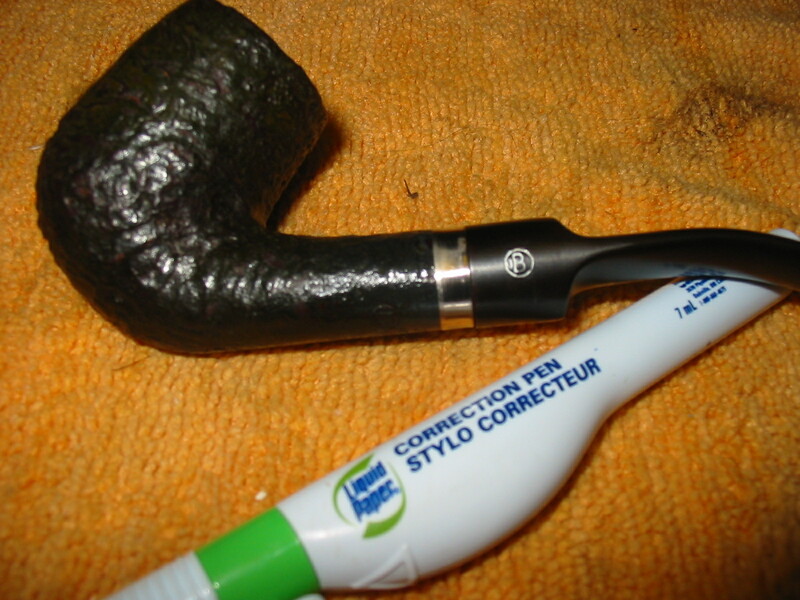 The finish was dirty and some of the top coat was damaged. 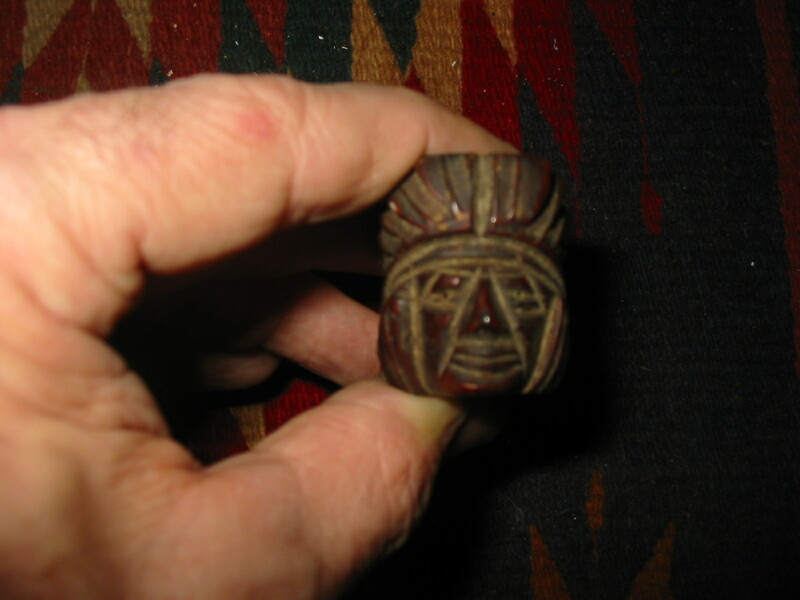 The rustication around the bowl rim inside the head dress was almost smooth with tars. 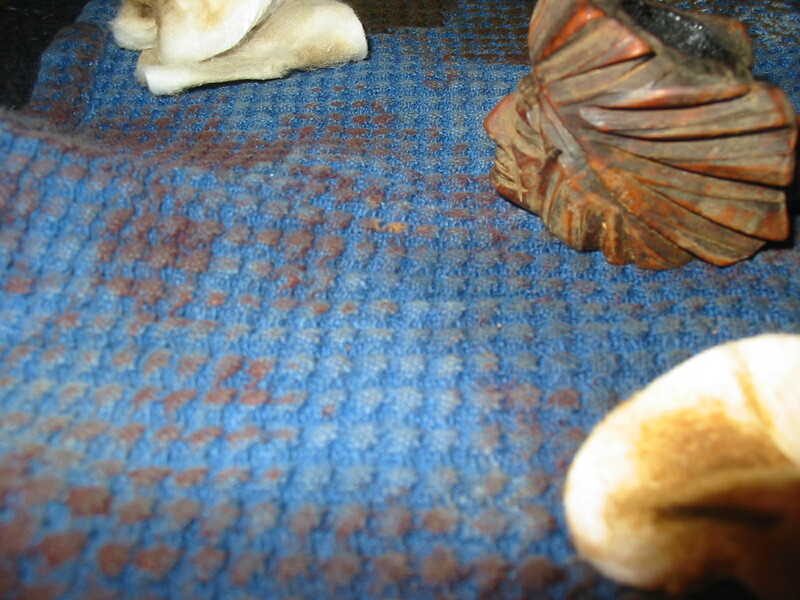 The grooves in the feathers and facial features were dirty as well. 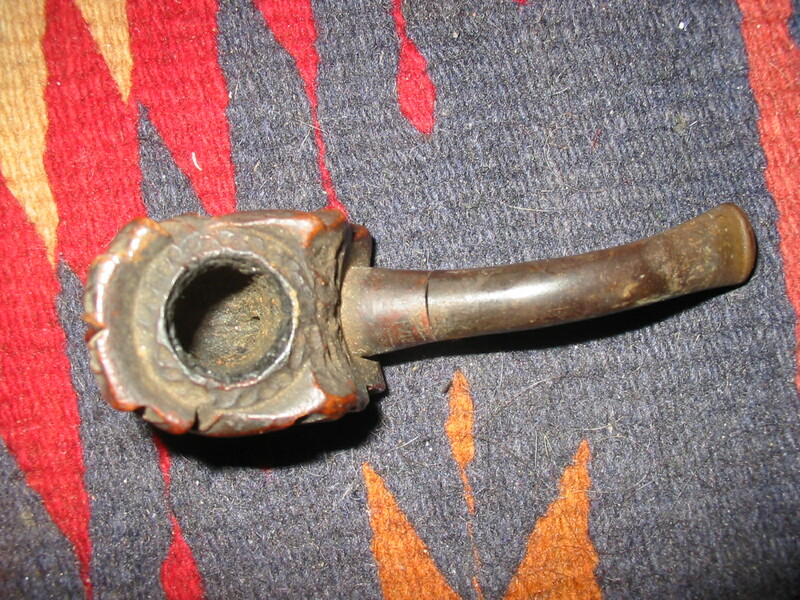 The stem was rough and badly oxidized. There were no tooth marks or chatter on the stem. The button was very tight and I could not put a pipe cleaner through it to clean it out. 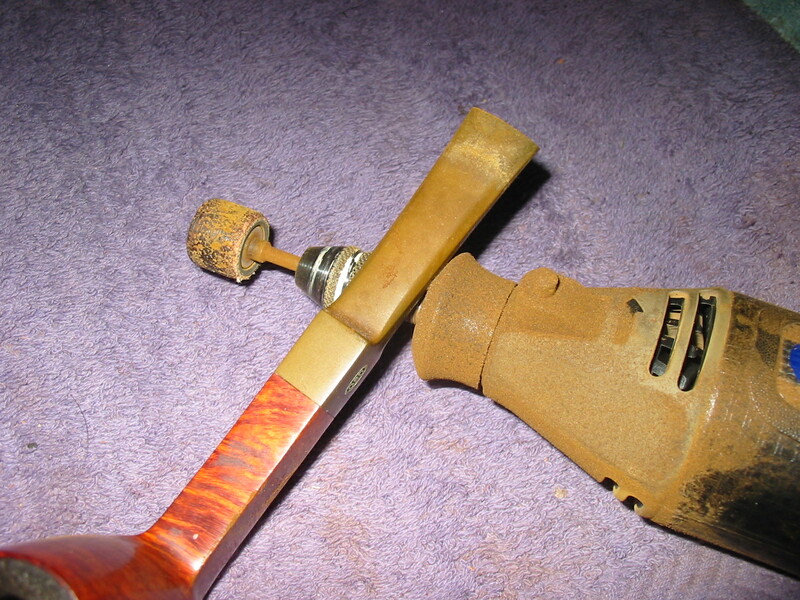 Pushing a cleaner in from the tenon end only let me get about ¾ of the way up the stem. 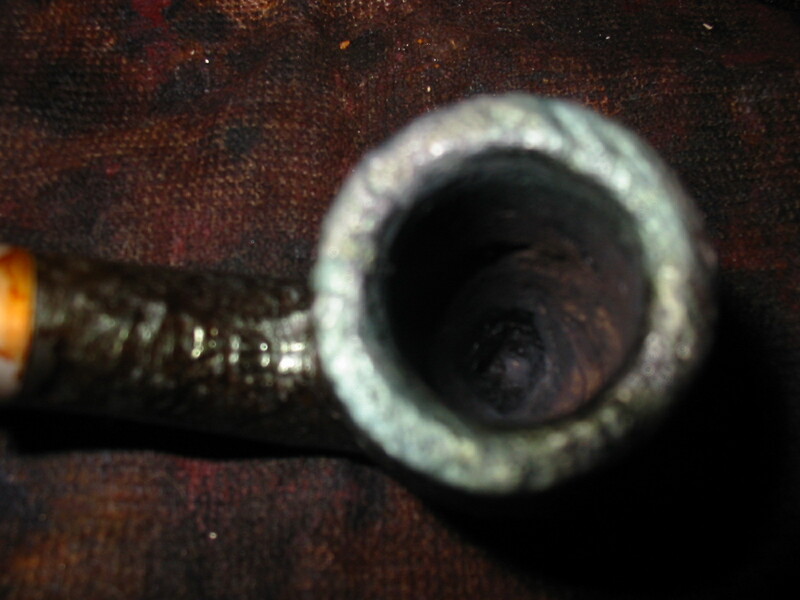 The first series of four pictures show the pipe as it arrived to my work table. I removed the stem and put the bowl in an alcohol bath overnight and the stem in a bath of Oxyclean for the same duration. 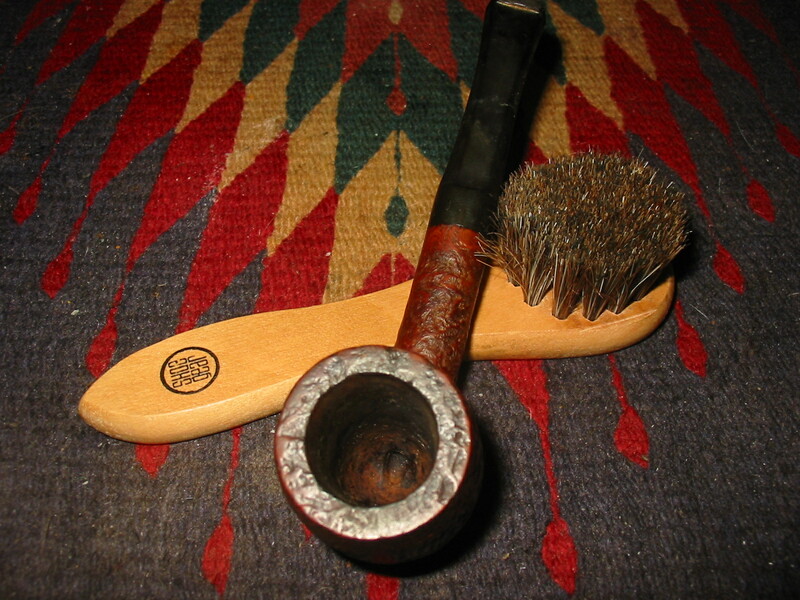 When I took the bowl out the next morning it was definitely cleaner however I needed to scrub it with a soft bristle toothbrush to remove the grime from deep in the grooves in the face and feathers. 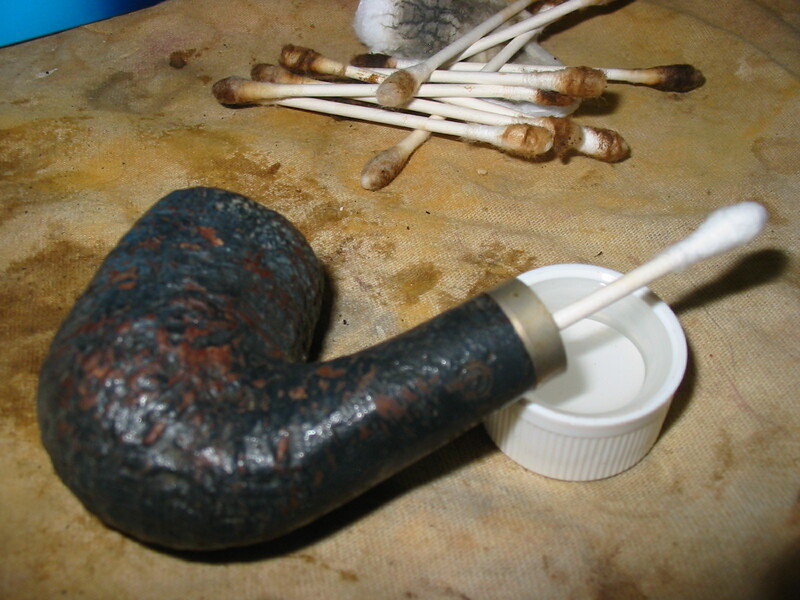 I also wiped the bowl down with acetone on a cotton pad to remove the remaining finish on the bowl. 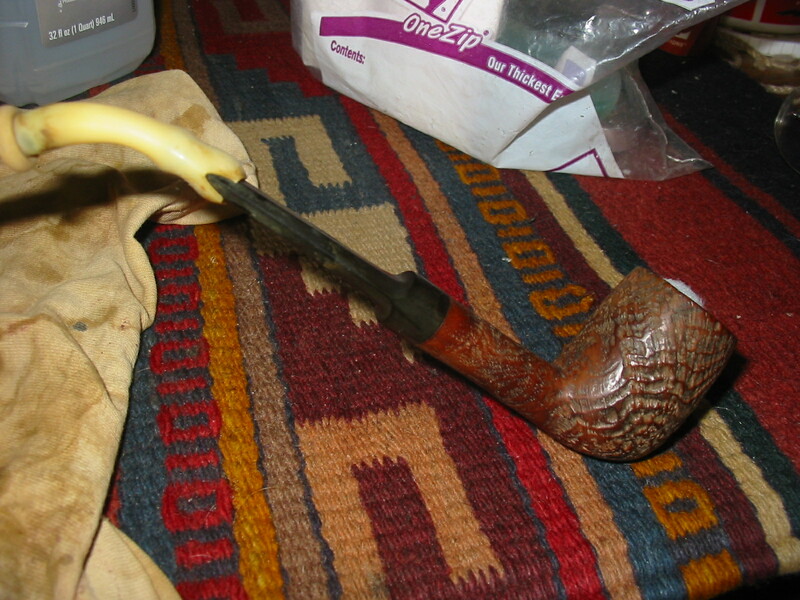 I reamed the bowl with my T handle PipNet reamer to get the bowl cleaned out. 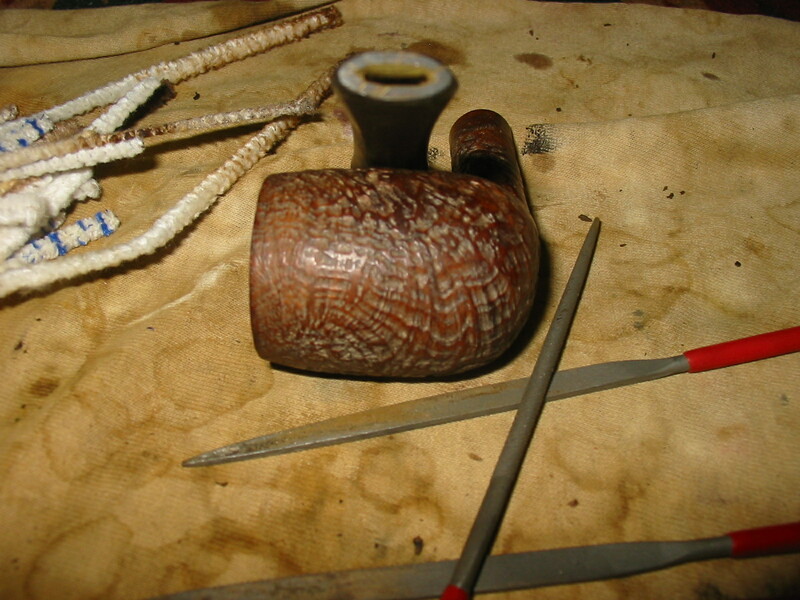 I also cleaned the shank with cotton swabs and Everclear and then pipe cleaners as well. 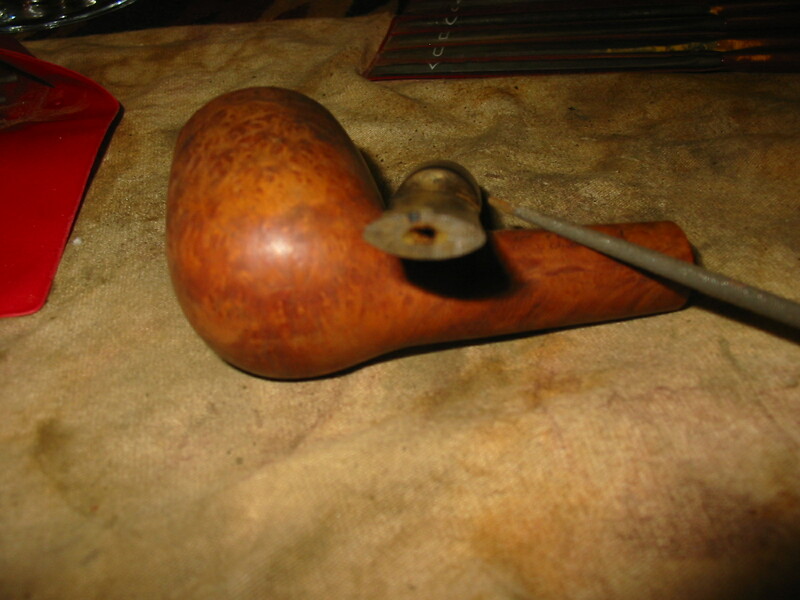 I used the drill bit on the handle of my KleenReem reamer to remove the build up from the airway between the mortise and the bowl. 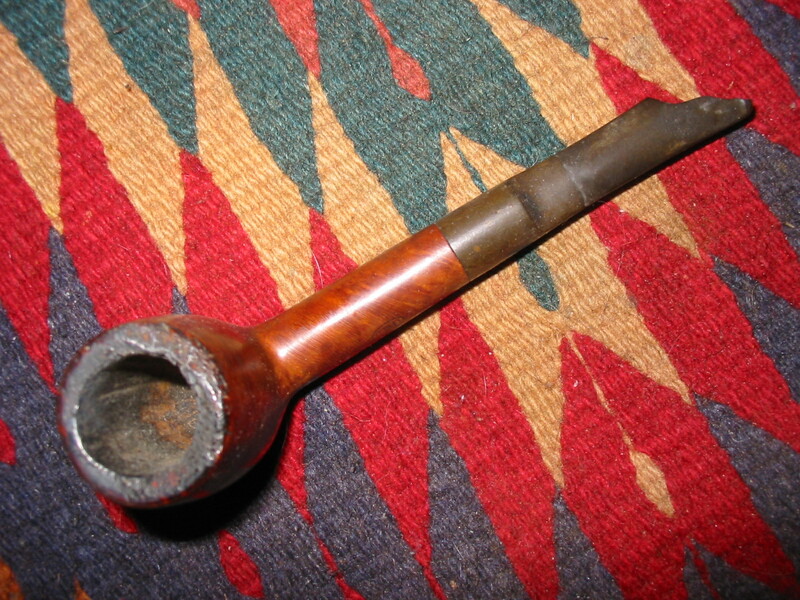 Once the pipe was cleaned inside and out it was ready to be stained. 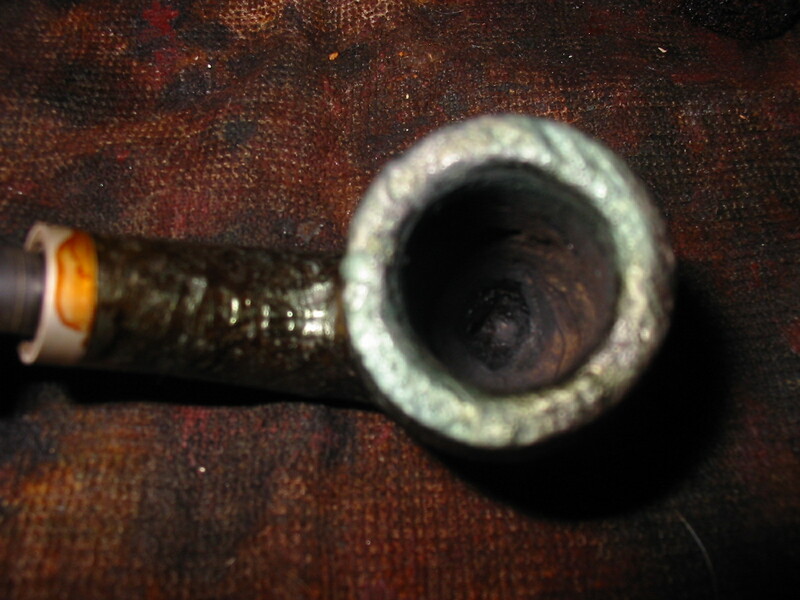 The next series of three photos show the pipe ready to be restained. 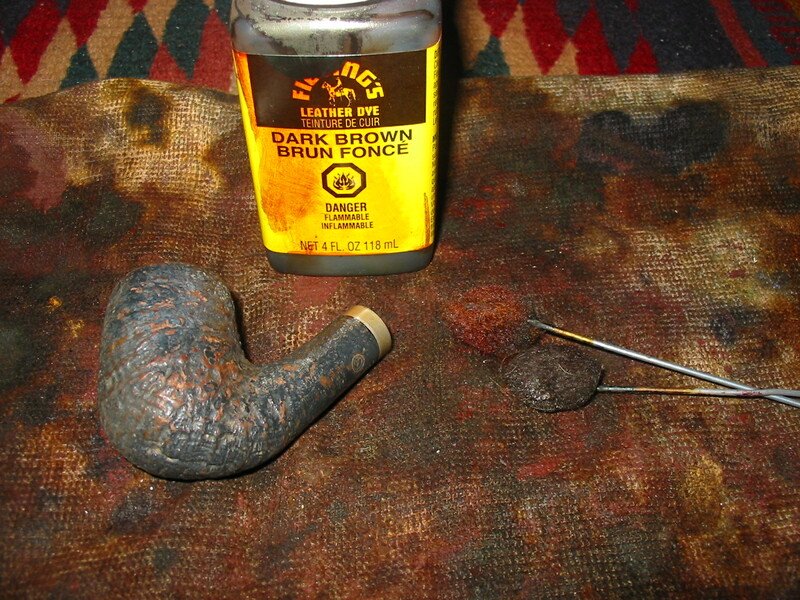 I restained the bowl with a dark brown aniline stain that I thinned down 2:1 with isopropyl alcohol. I used the dauber that comes with the stain. I applied it heavily, flamed it and then restained it until the coverage was the way I wanted it. 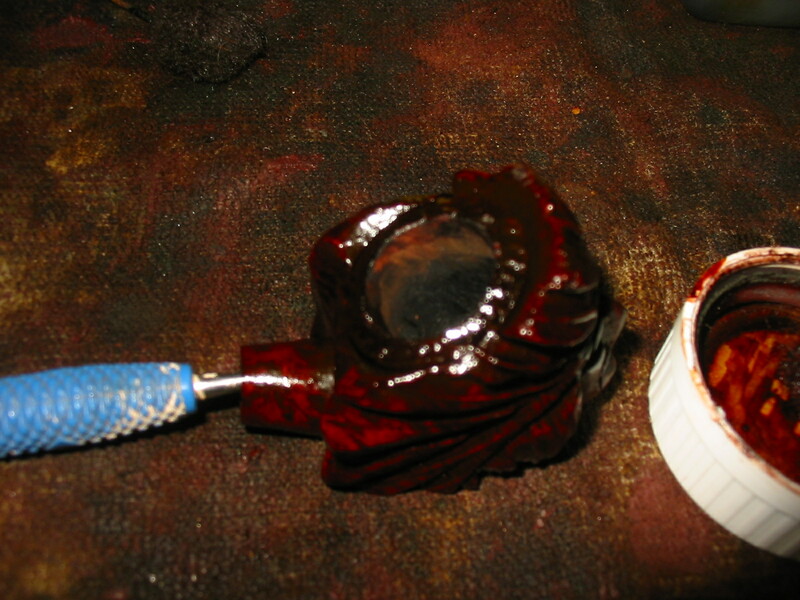 The next three photos show the bowl during the staining process. 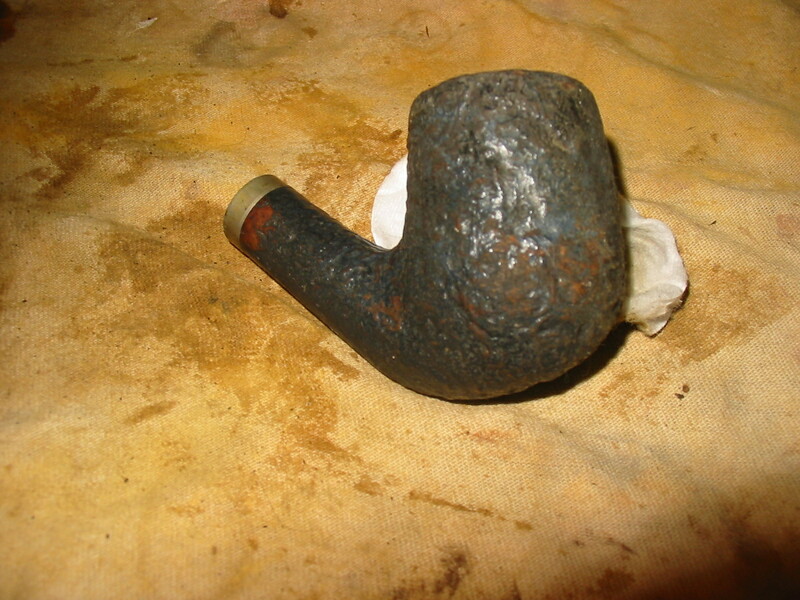 The stem needed a lot of work to get the roughened surface smooth again and the oxidation off of it. I began by working on the slot in the button. 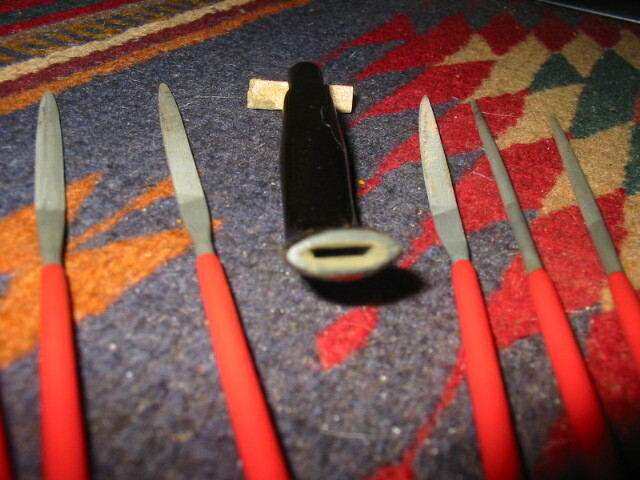 I could not get a pipe cleaner through it so it would need to be opened with my needle files before I could really clean the inside of the airway. The next four photos show the progress of the slot reshaping and opening from start to finish. Once the slot was the right openness and took a pipe cleaner easily I sanded it out inside with a folded piece of 320 grit sandpaper to smooth out the file marks. 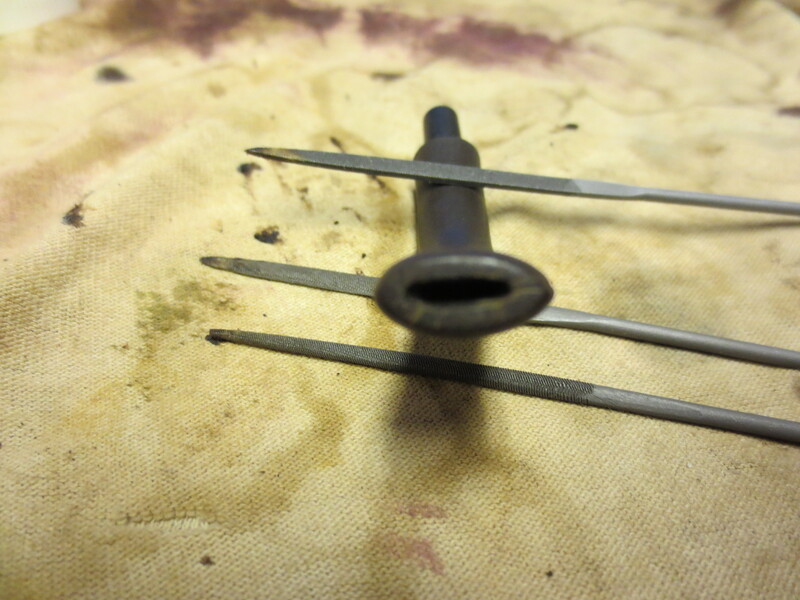 Once the slot was open I cleaned out the inside of the stem with Everclear and pipe cleaners and a shank brush. 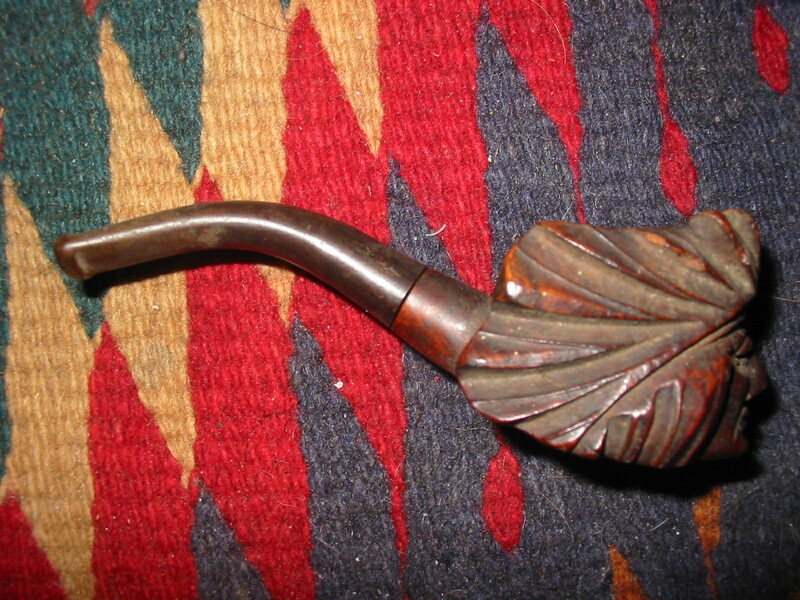 It took a lot of pipe cleaners as I don’t think the stem had ever been cleaned since it was first smoked. 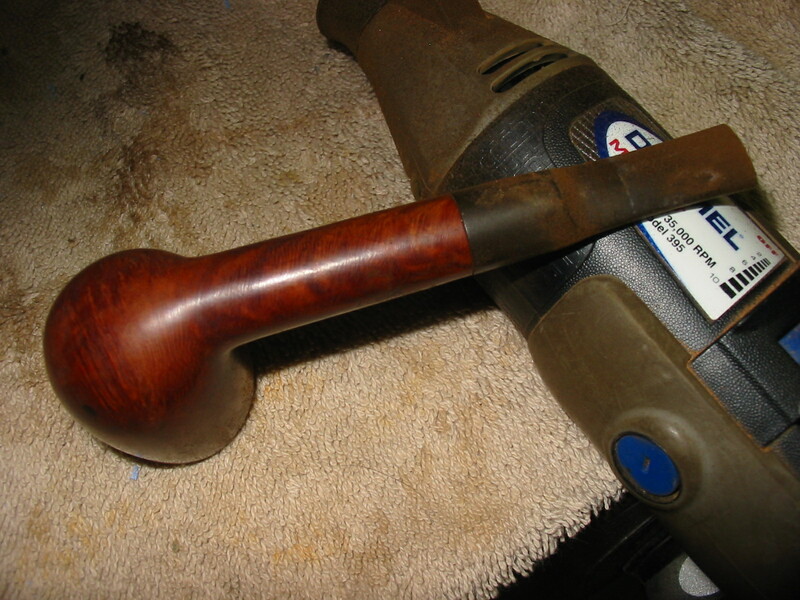 I then sanded the surface of the stem with 220 grit sandpaper to loosen the remaining oxidation and smooth out the rough surface. 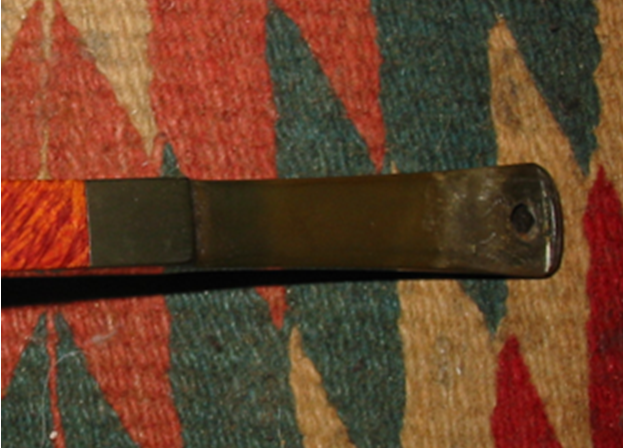 I then used a medium grit sponge backed sandpaper to remove the scratches left behind by the sandpaper. I used the Bic lighter technique on the stem and then sanded it with micromesh sanding pads 1500-2400 grit and then polished it with Maguiar’s Scratch X2.0 applied and rubbed off with a cotton pad. 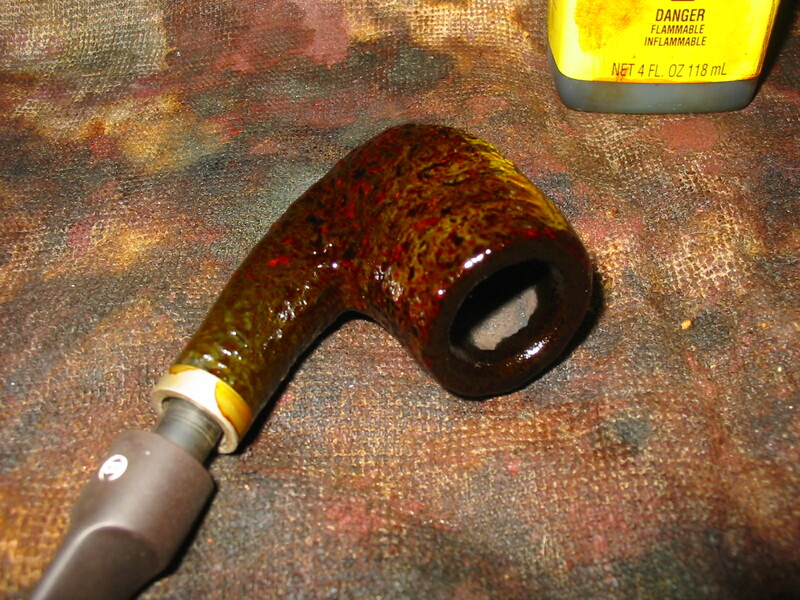 I finished sanding the stem with the remaining micromesh pads from 3200-12,000 grit, buffed it with White Diamond on my buffer and then coated it with Obsidian Oil and then multiple coats of carnauba. I also gave the bowl a buff with carnauba. 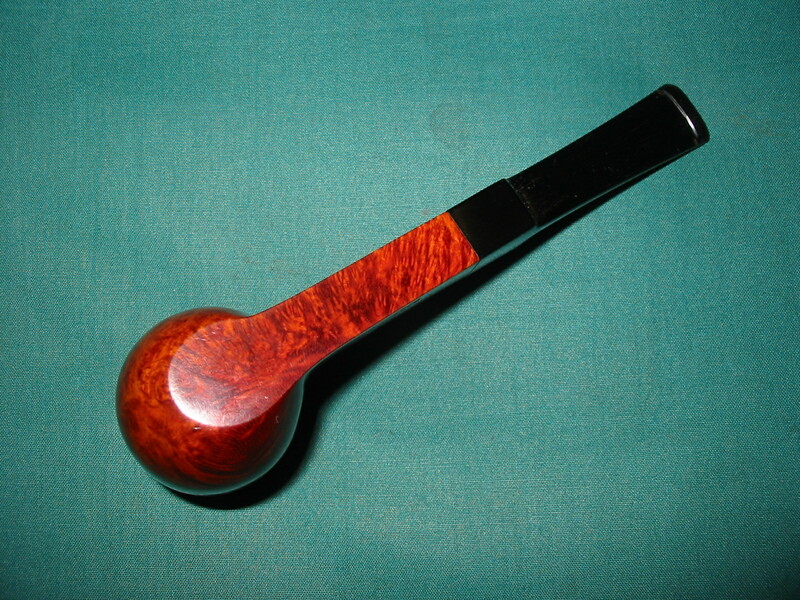 The finished pipe is pictured in its new finish in the next five photos. 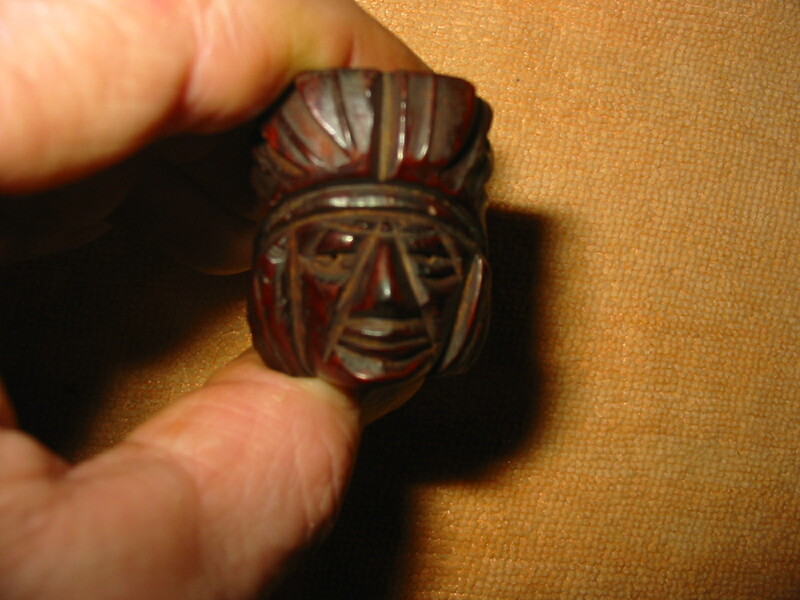 It is a proud figural that has interesting carving and a great feel in the hand. 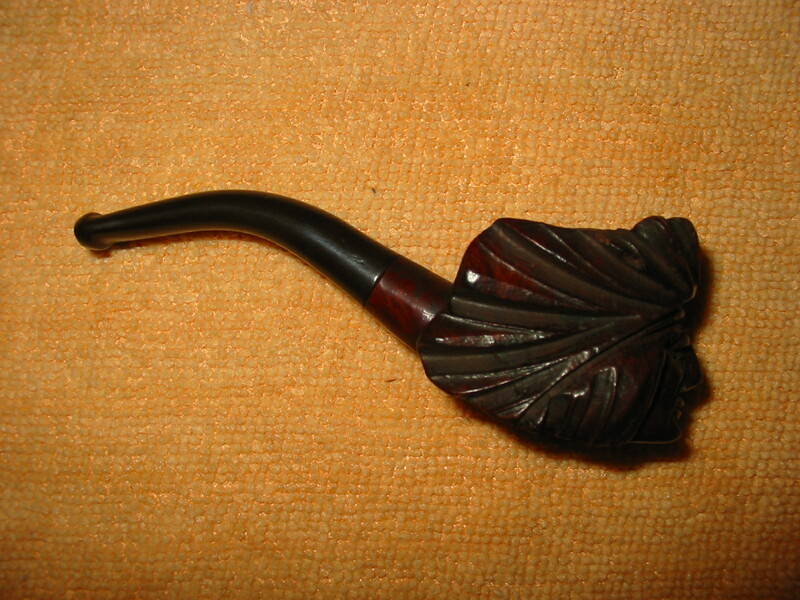 I am not much for figural pipes but this one has some endearing features for me. Thanks Bill for the gift and the opportunity to try my hand on this one. 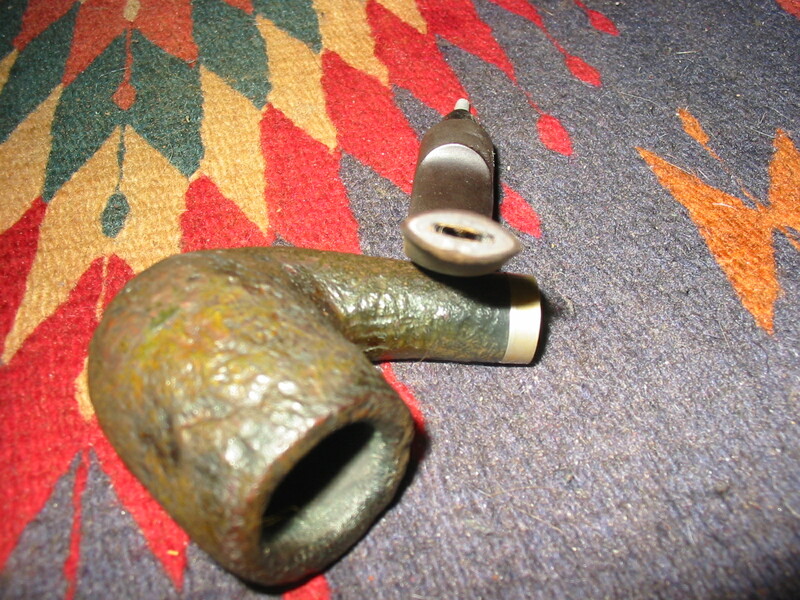 This entry was posted in Pipe Refurbishing Essays and tagged Bic lighter and oxidation, Figural pipes, opening a slot in the button, Oxidation, Real Briar Carved pipes, restaining a pipe on January 27, 2013 by rebornpipes. 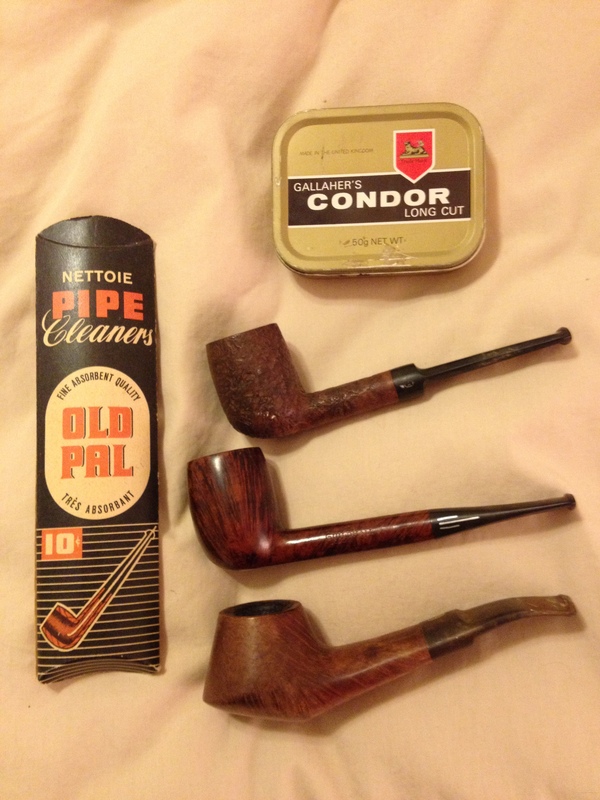 I was gifted six pipes that were in need for refurbishment be a friend on Smokers Forums. 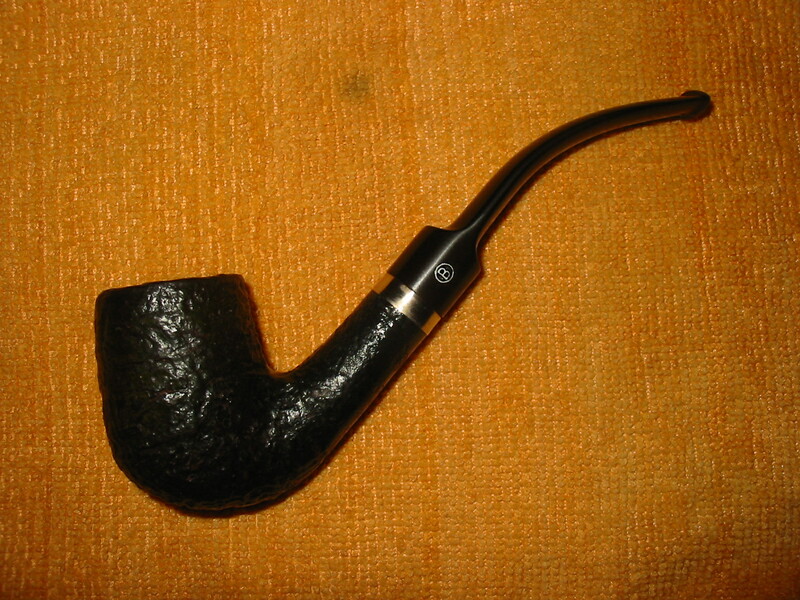 The first one that caught my fancy was this nice sandblasted Big Ben Bent Billiard. It had a silver band and a nice looking blast. 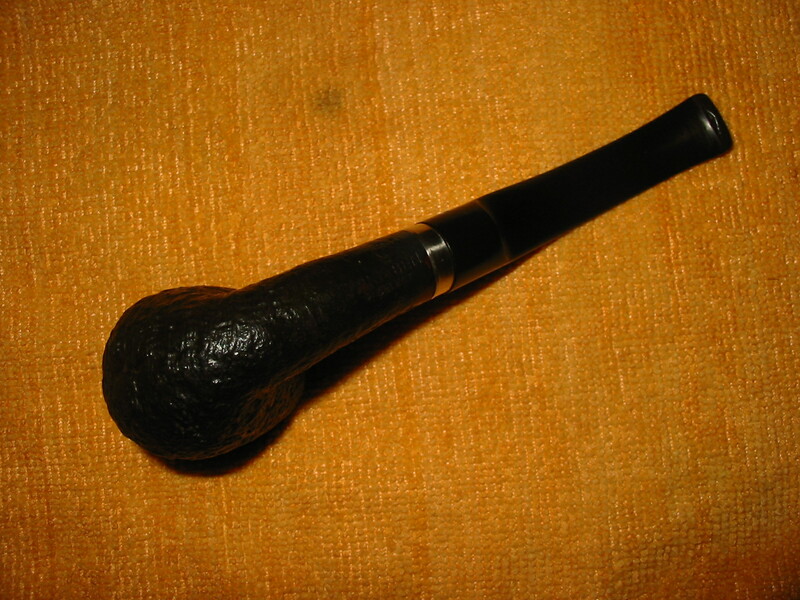 The finish was rough but shape is classic. 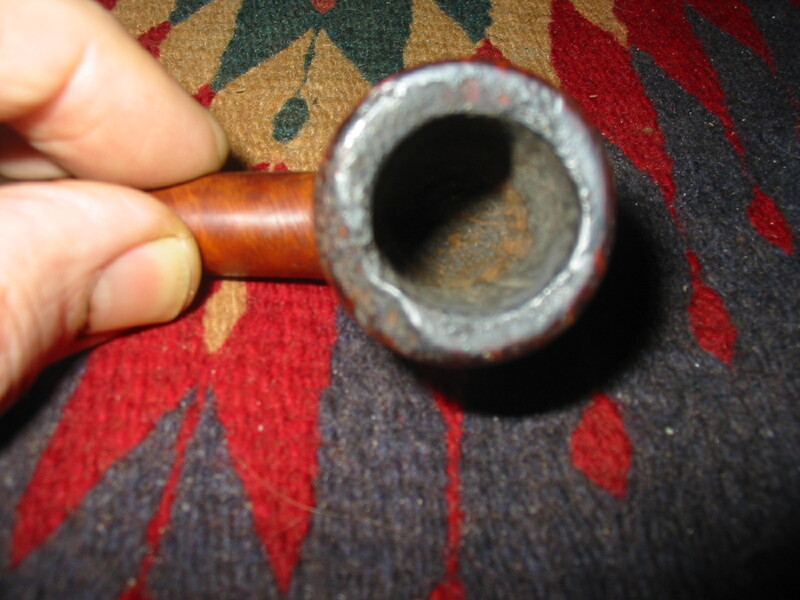 The bowl was dirty and the shank and stem were filled with tars and grime. 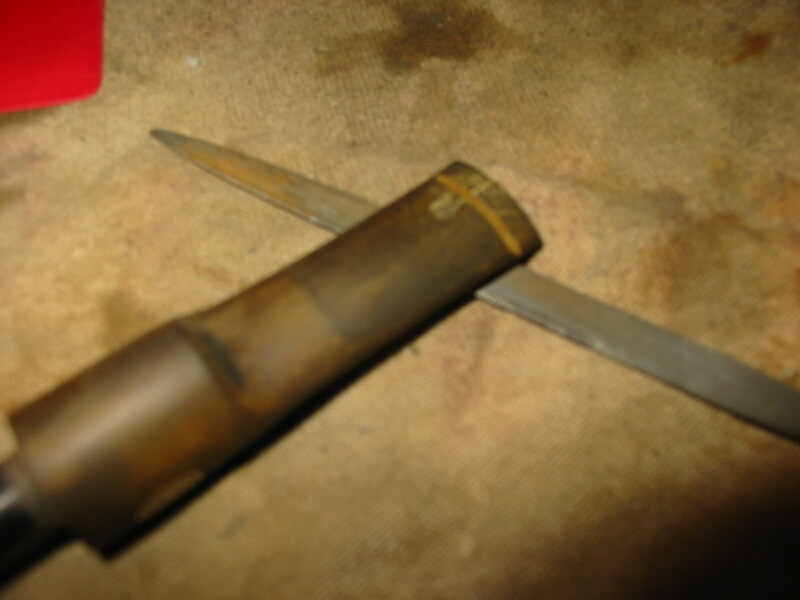 The bowl is stamped on the underside of the shank – Big Ben Select under a B in a circle. 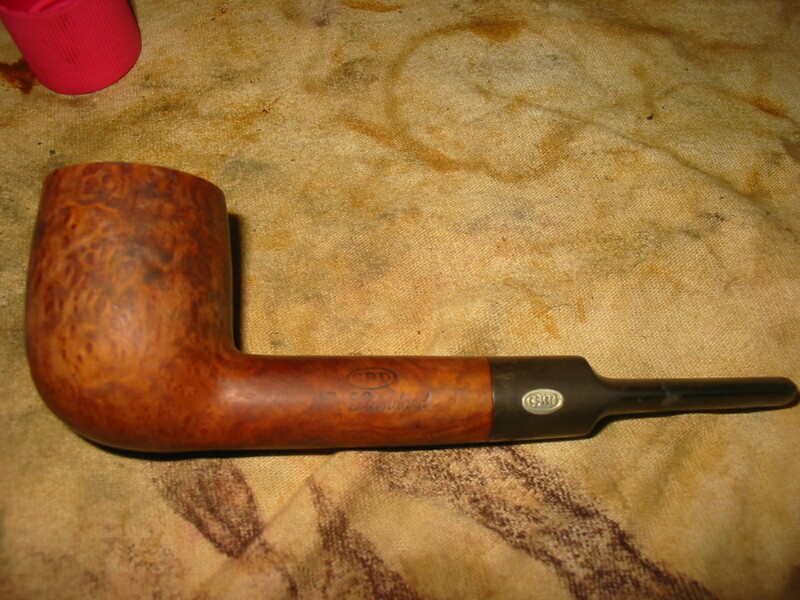 The outside of the stem was oxidized but the B logo was still deeply stamped. There was also a slight tooth mark on the underside of the stem near the button. 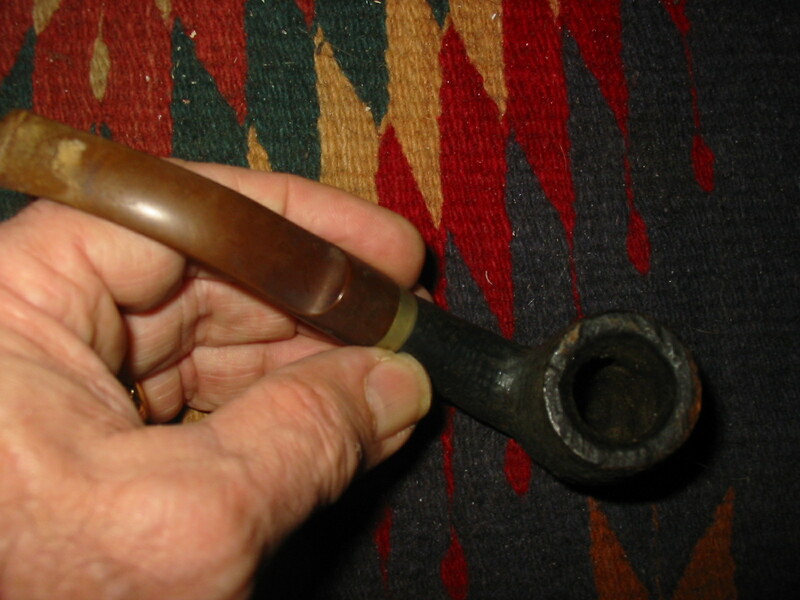 The button was very tight and small – so much so that a thin pipe cleaner was work to get through the slot. 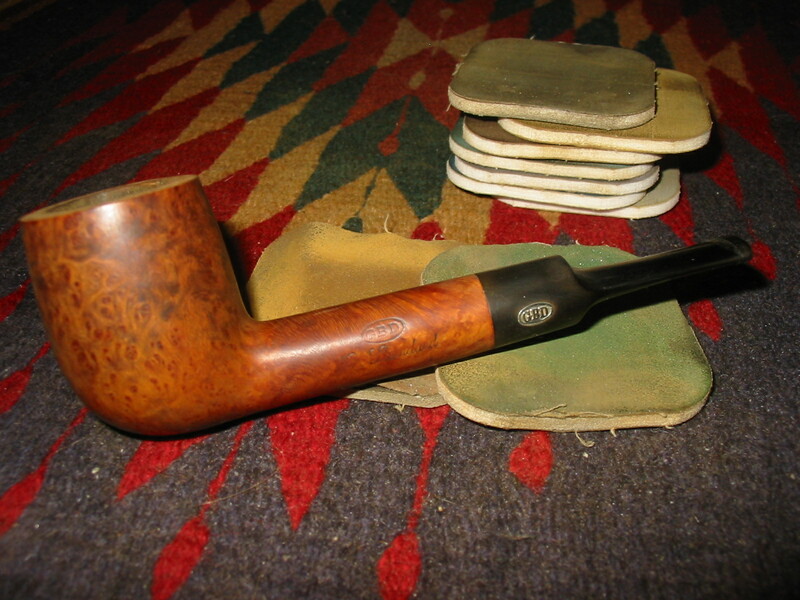 The rim edges were worn and rough but as it was a blast this would not be a problem to clean up. 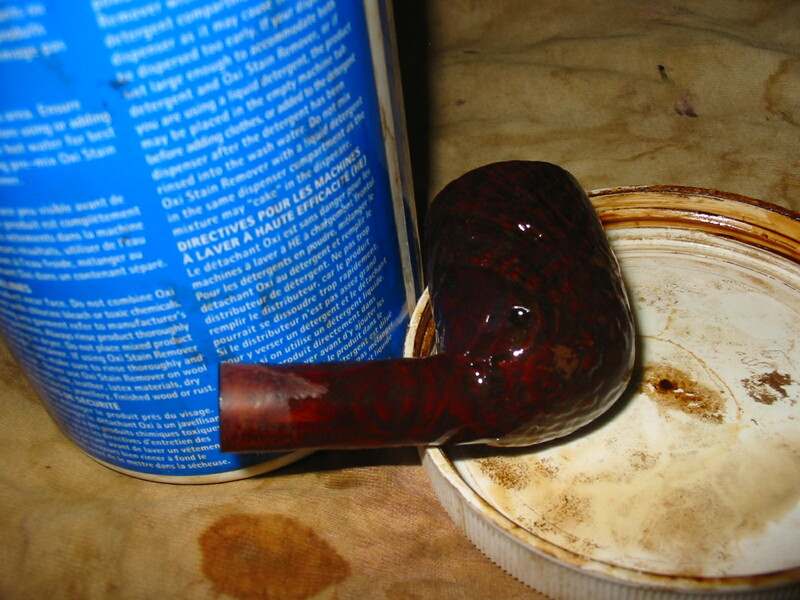 Over the stain coat was also a shiny varnish or lacquer coat that I always find to be a pain to remove and deal with in a pipe that is worn like this one. It was just the challenge I wanted to have a go at this weekend. 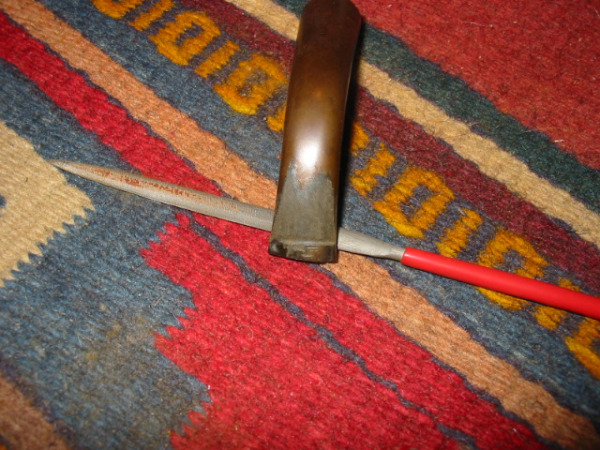 The next series of three photos show the pipe as it appeared when I opened the box and took it out for the first time. 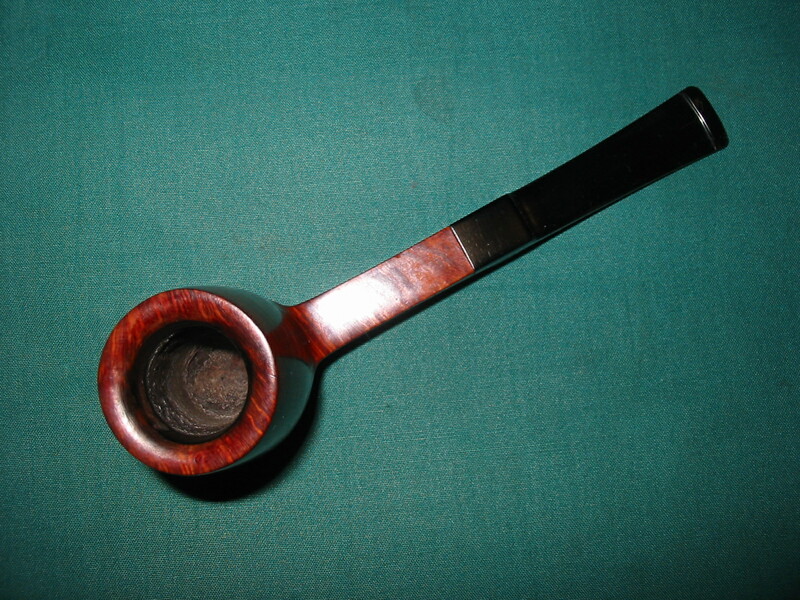 I decided to begin by reaming the bowl so I removed the stem so that I could hold the bowl solidly and used my T handle Pipnet reamer. 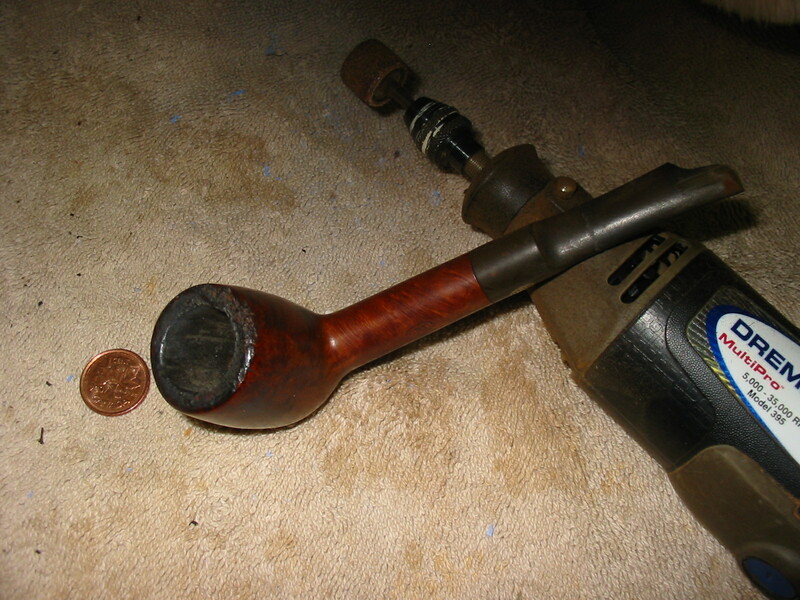 The next series of three photos show the reamer and the pipe bowl as I worked on it. Once I was finished I dropped it my alcohol bath to soak. 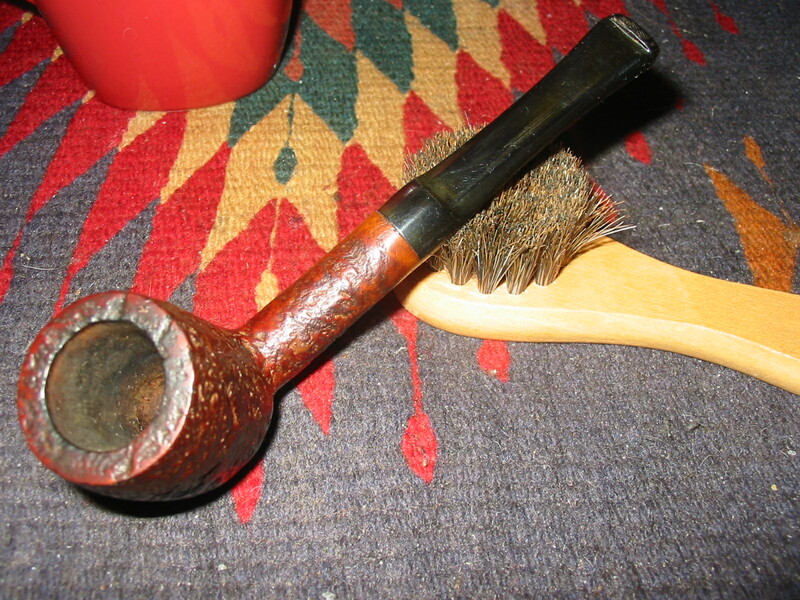 The fourth photo below shows the bath after I had dropped the pipe bowl in the soak. The alcohol appears dirty but it is darkened from earlier stains that I have removed. I have filtered the alcohol several times over the past months to remove sediment and particulates that were in the mix. 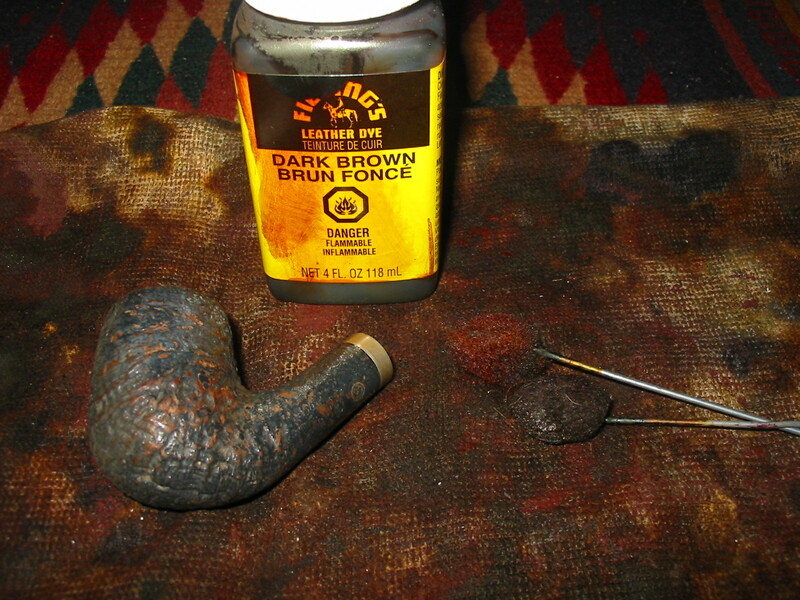 The alcohol works exceptionally well and I have found that the darkened stain in it adds a nice aged patina to the briar. 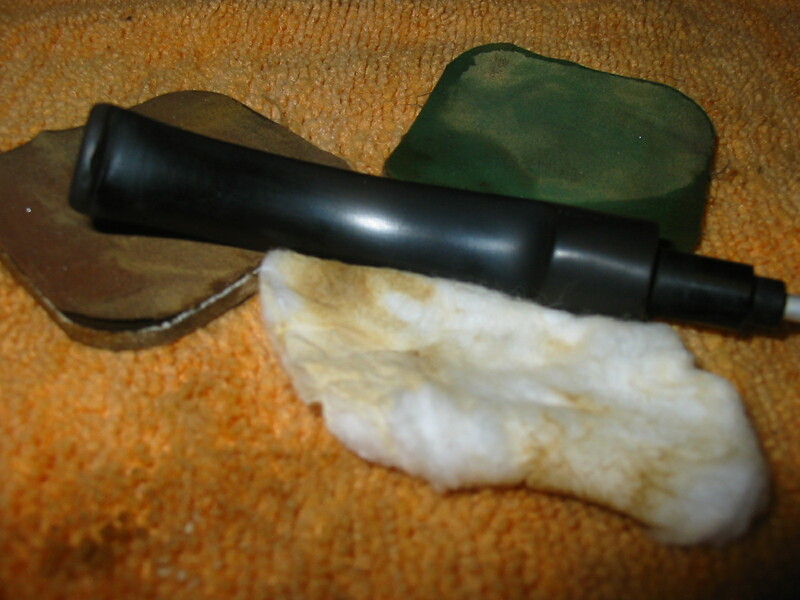 The fifth photo shows the stem ready to go into the OxyClean bath. I dropped it in the bath and it immediately darkened the wash. 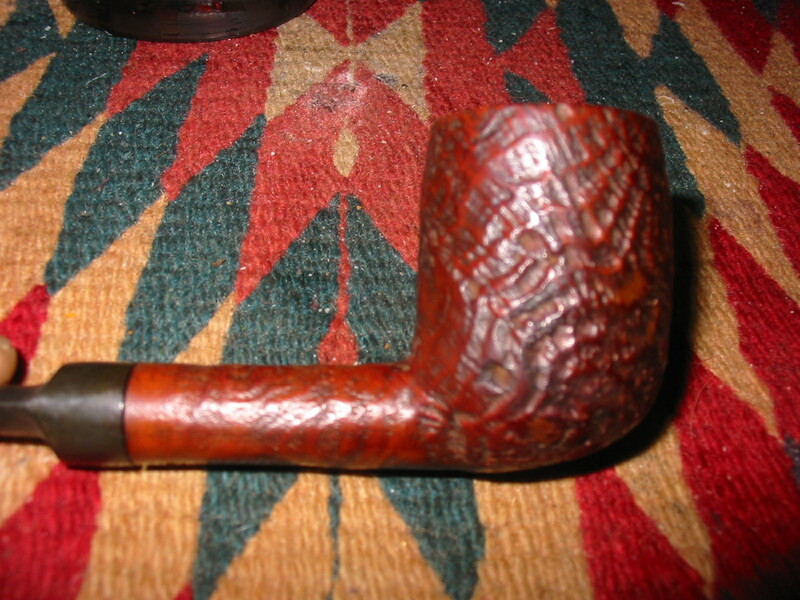 I took it out and took a photo to show the before soaking look of the stem. I left the bowl in the alcohol bath overnight and then this morning took it out and scrubbed it with a soft bristle tooth brush. 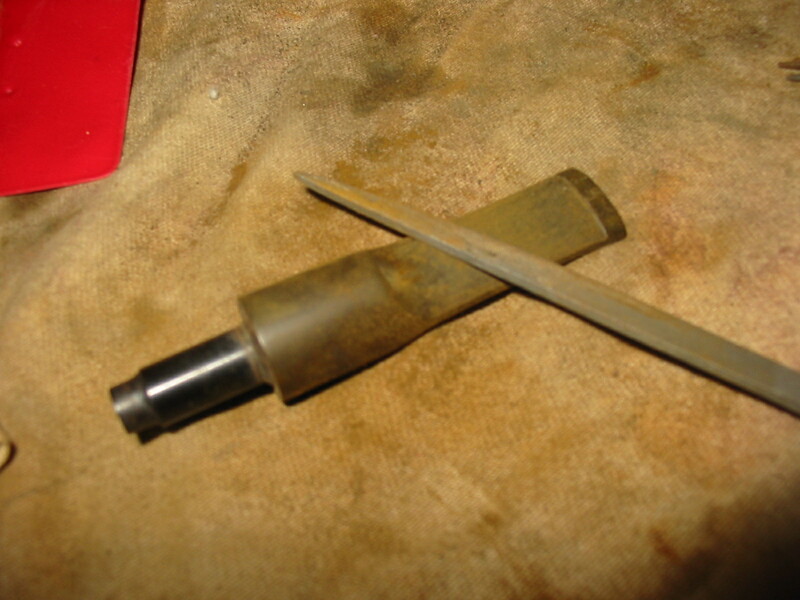 I also picked out the paint that seemed to be in the grooves of the blast with my dental pick. 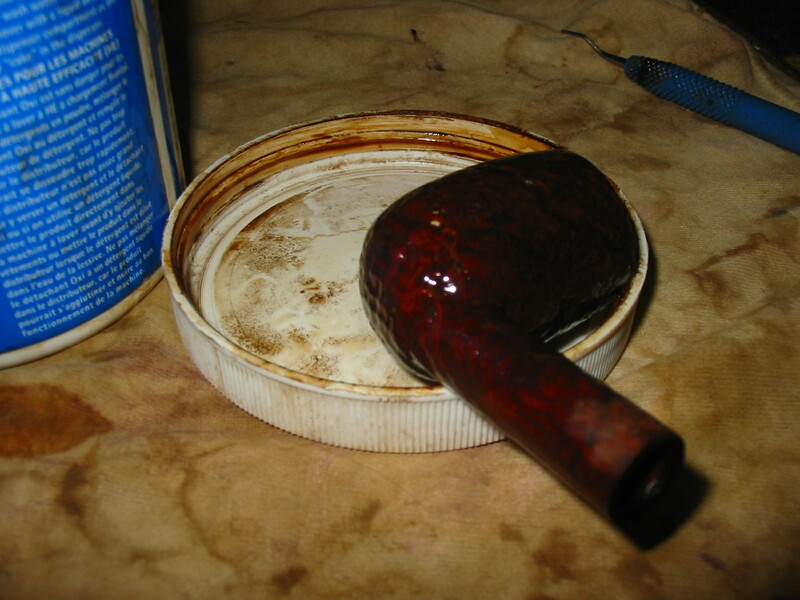 I decided to also scrub the bowl with a brass bristle tire brush to get the paint flecks out of the briar. The next series of twelve photos shows the process I have described above. The first three photos show the bowl wet from the bath and the tooth brush off to the side that I use to scrub the sandblast. I rinsed the bowl off with alcohol from the bath and then dried it with a cotton cloth. 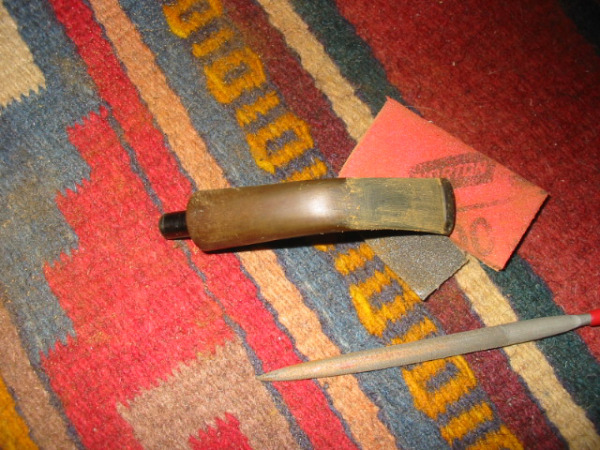 The next two photos show the bowl with the brass tire brush. 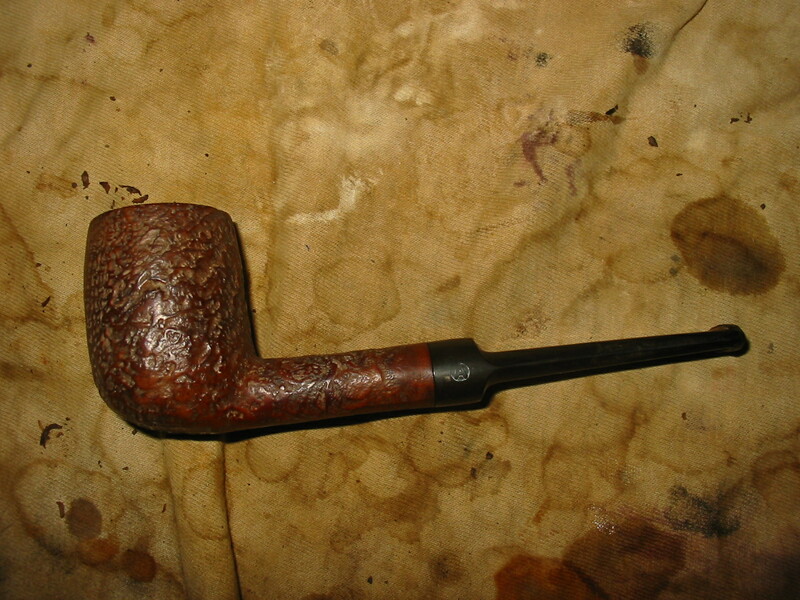 Once the surface had dried I scrubbed with the tire brush to remove the grime from the grooves in the briar. The final seven photos show the bowl as I wiped it down with acetone on a cotton pad to remove the remaining finish and top coat of varnish or lacquer. 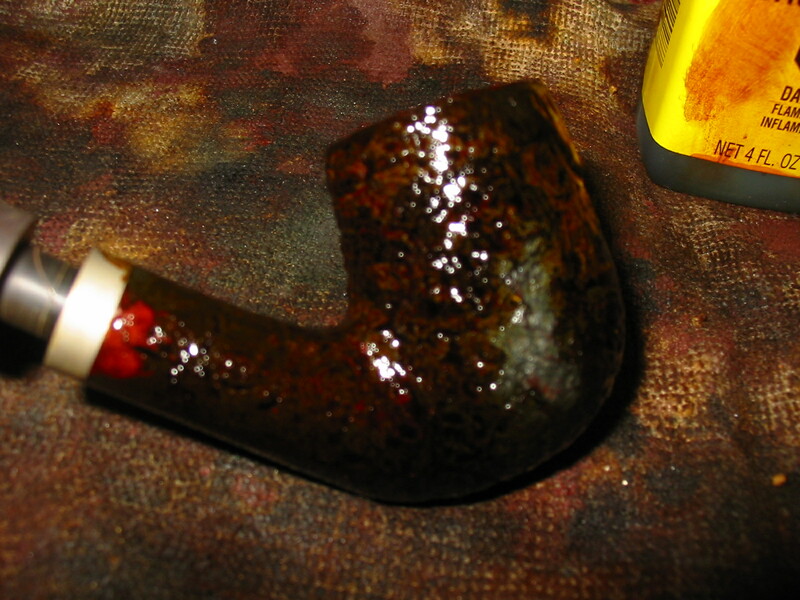 I wanted the briar very clean before I restained it. 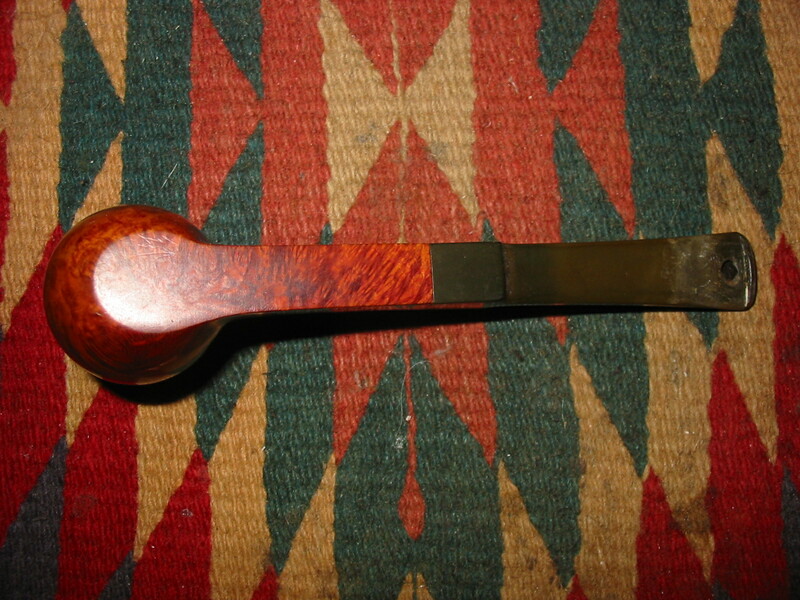 After getting the outside of the bowl cleaned and ready to stain I worked on the inside of the bowl and the shank. The shank was interesting in that it had two stepped down portions. 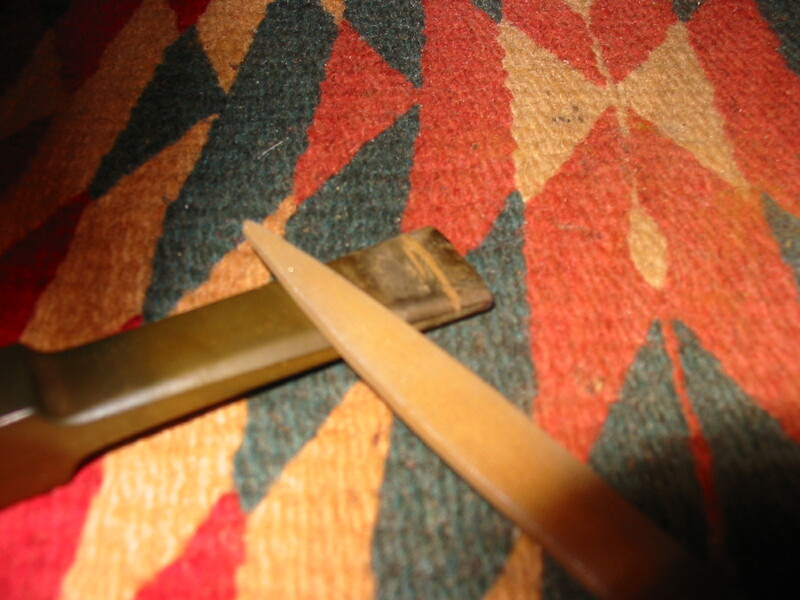 First there was the mortise area where the tenon rested. 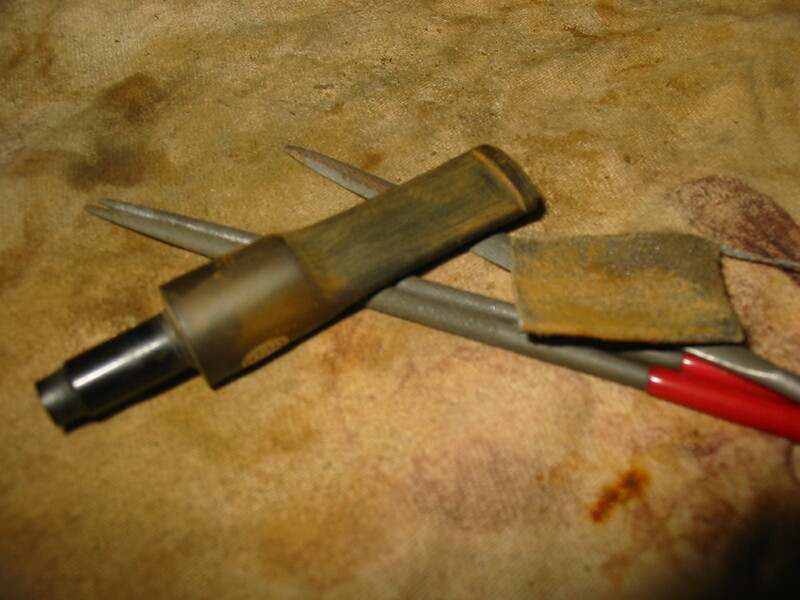 This was followed by an area that further stepped down to receive the inner tube style stinger in the end of the tenon. 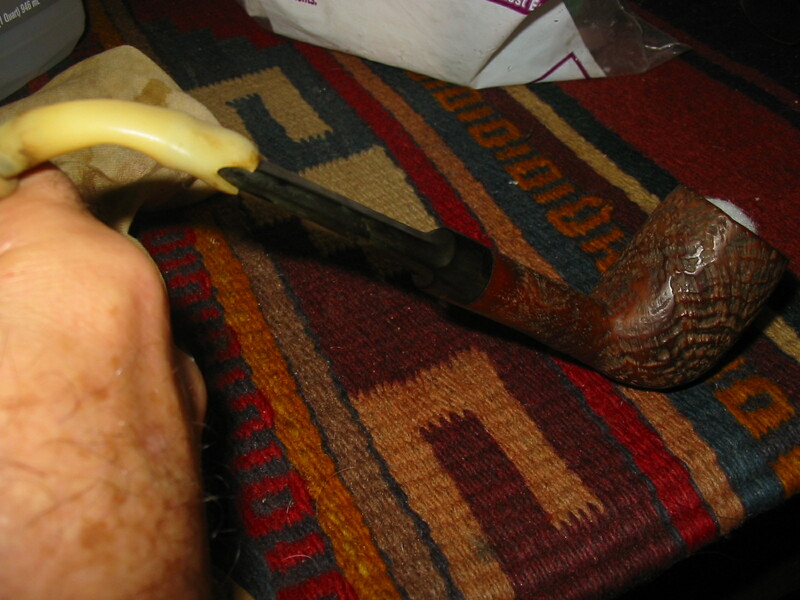 Finally there was the area of the airway into the bowl bottom. 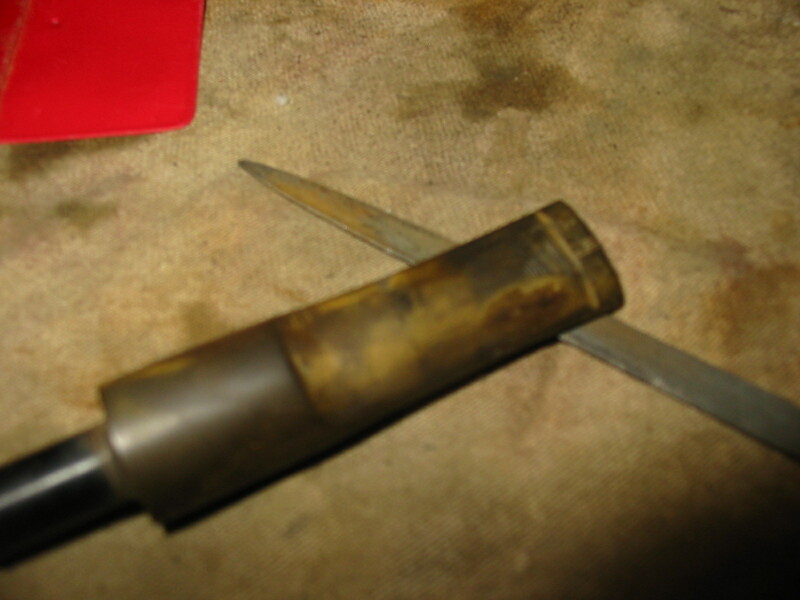 The step down drilling of the shank made this an interesting airway to clean out. I used isopropyl alcohol and some Everclear to scrub out each step down successively. I began with the mortise area that held the tenon. To clean this I used qtips or cotton swabs dipped in alcohol. I scrubbed that area until the swabs came out clean. I then proceeded to clean the next stepped down area where the inner tube sat. 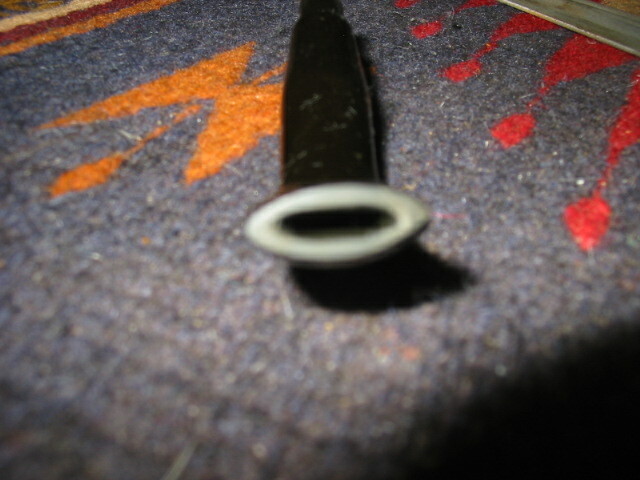 I used cotton swabs on this as well and pressed them against the opening and twisted them into that part of the airway. Again I used the alcohol and kept working on it until the swabs were clean. The final part of the airway I used a shank brush and alcohol followed by fluffy pipe cleaners until that area was also clean. The next series of three photos show the process and the dirty cotton swabs at the top of the photos. 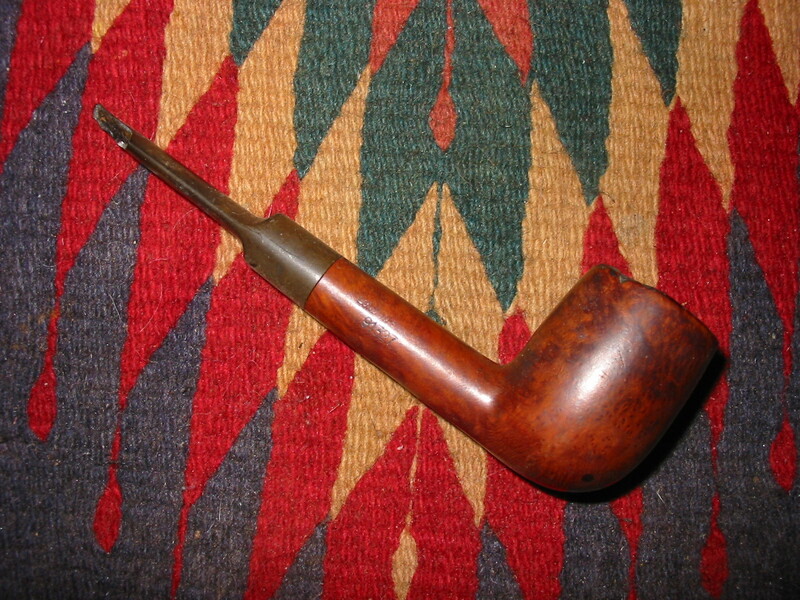 After cleaning out the shank and wiping down the inside of the bowl I cleaned the stem. This was more of a pain than normal due to the constriction of the button and slot. 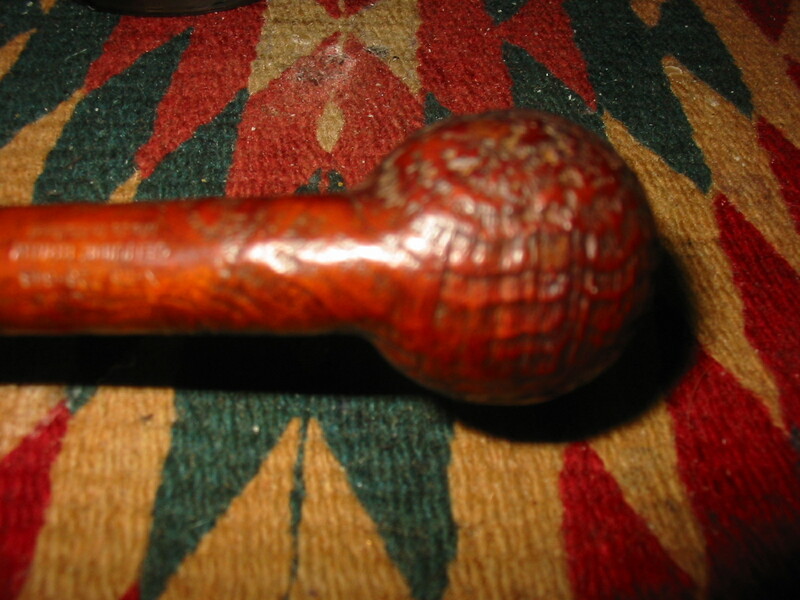 A thin pipe cleaner would not fit into the stem from the button end. So I had to slowly move it into the stem from the inner tube end. 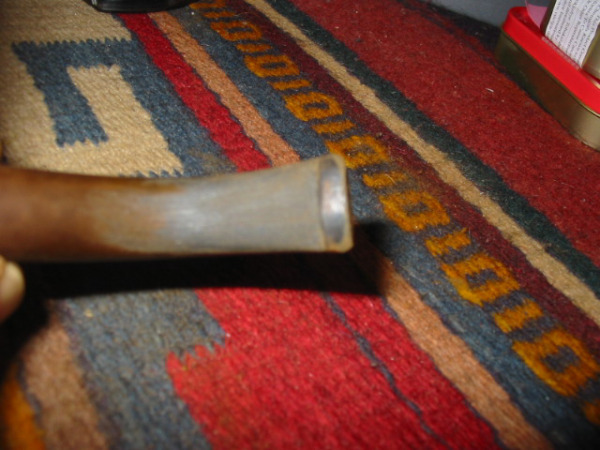 I also was able to flatten the pipe clean and work it into the stem. 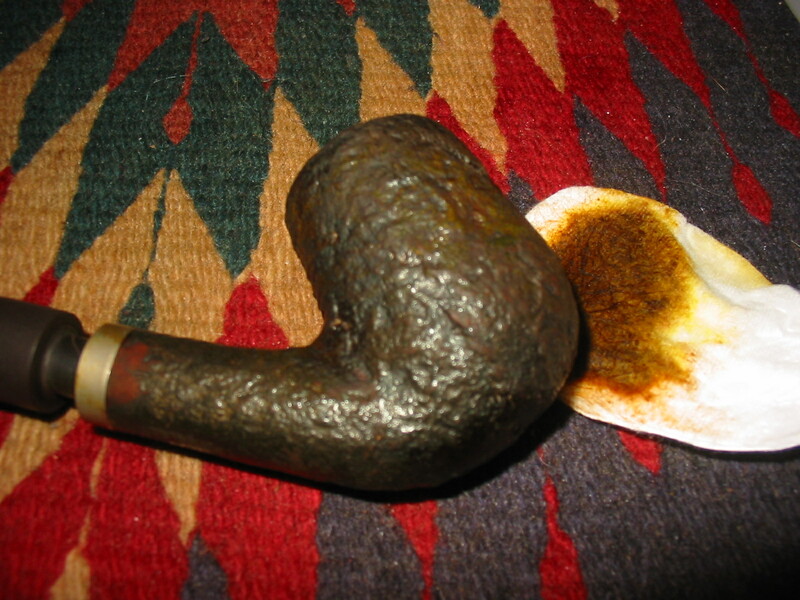 It got most of the gunk out of the stem. 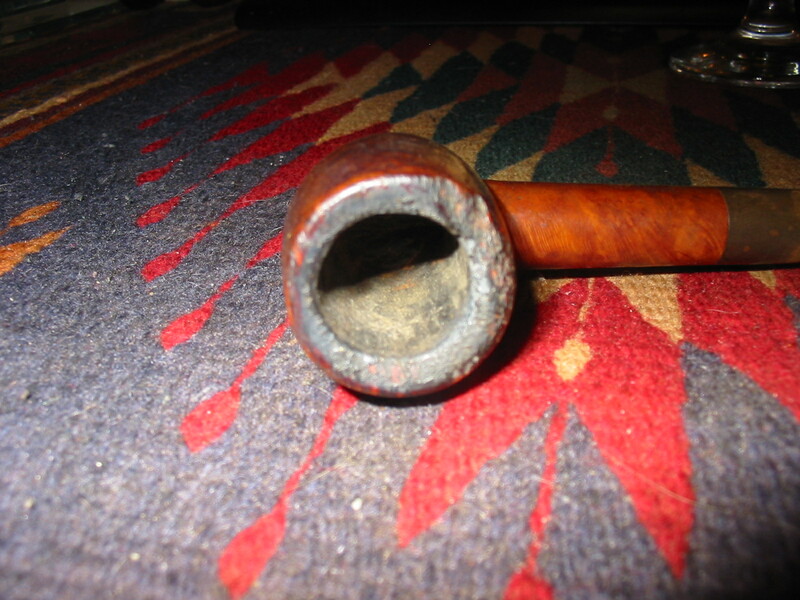 The next two photos show the pipe after this cleaning. 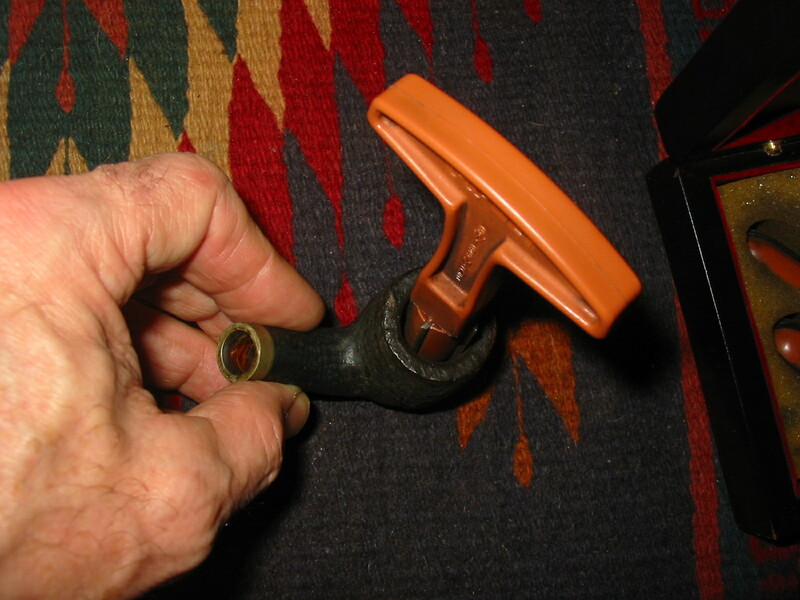 The stem button would need to be opened in order to give it a more thorough cleaning. 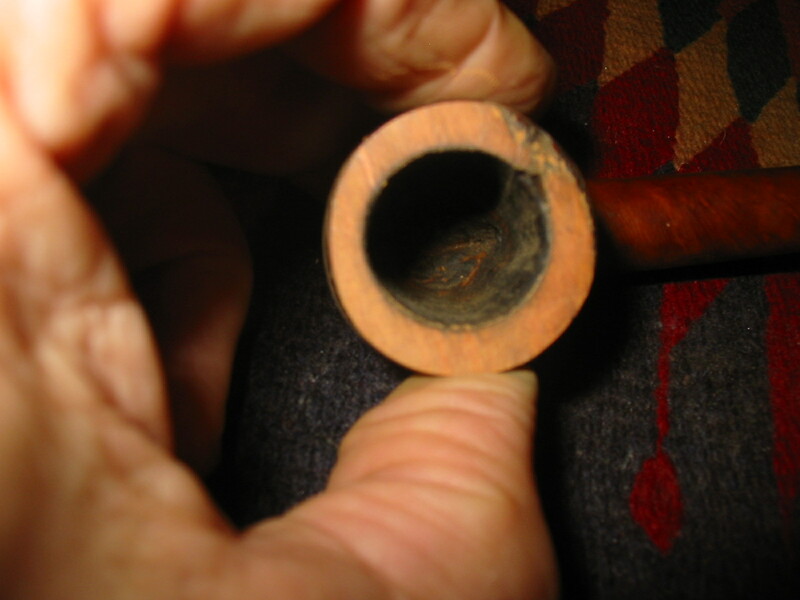 The next series of nine photos show the restaining of the pipe. 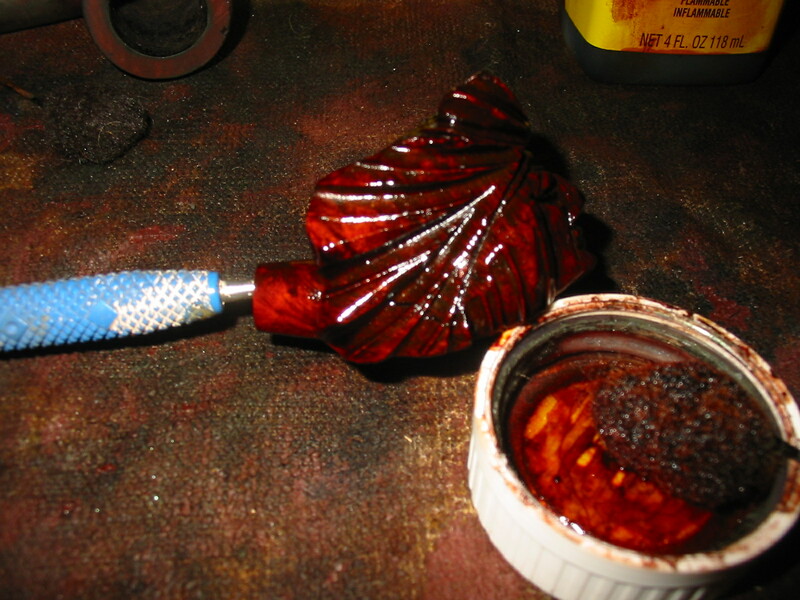 I used a dark brown aniline stain that I have thinned down 2:1 with isopropyl alcohol. 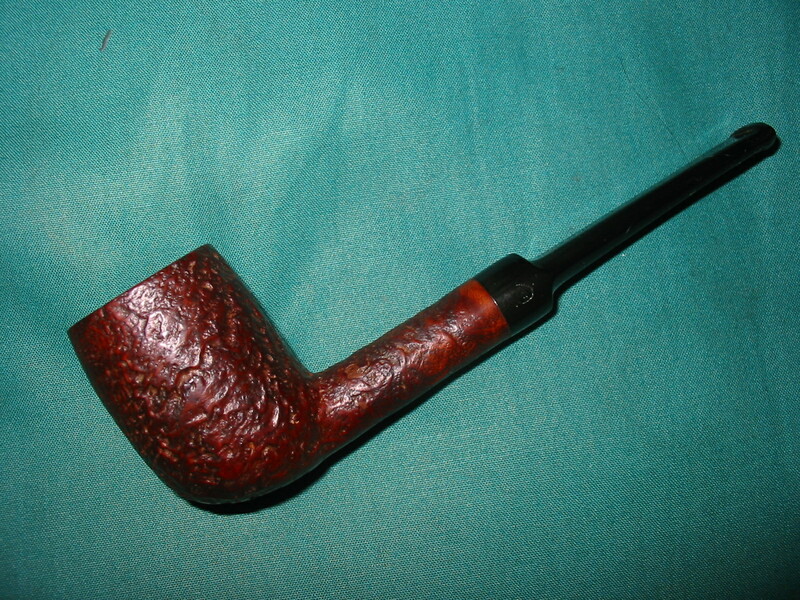 It does a good job of coverage on the briar but also allows some depth the staining. 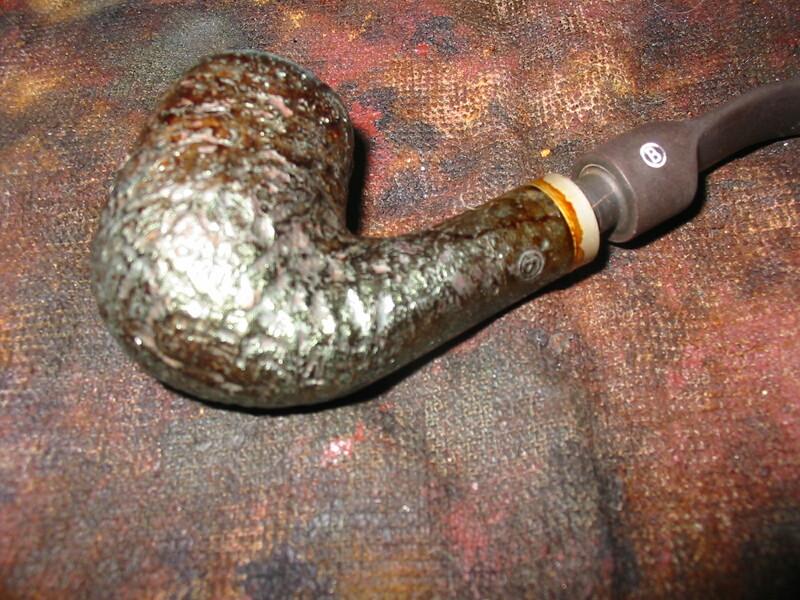 I like the look and effect of it on sandblasted briar. I applied the stain with a dauber and then flamed it with a lit match. 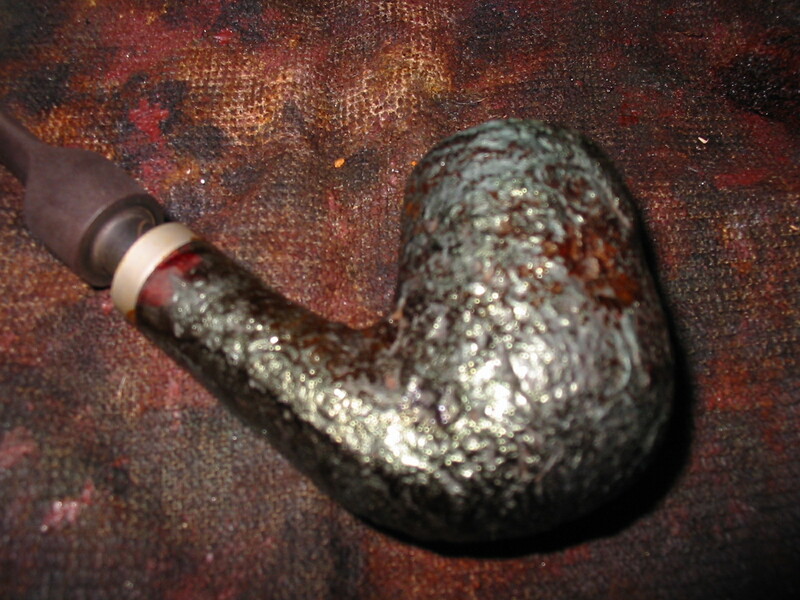 I reapplied and reflamed the pipe several times to get a good solid coverage of stain. 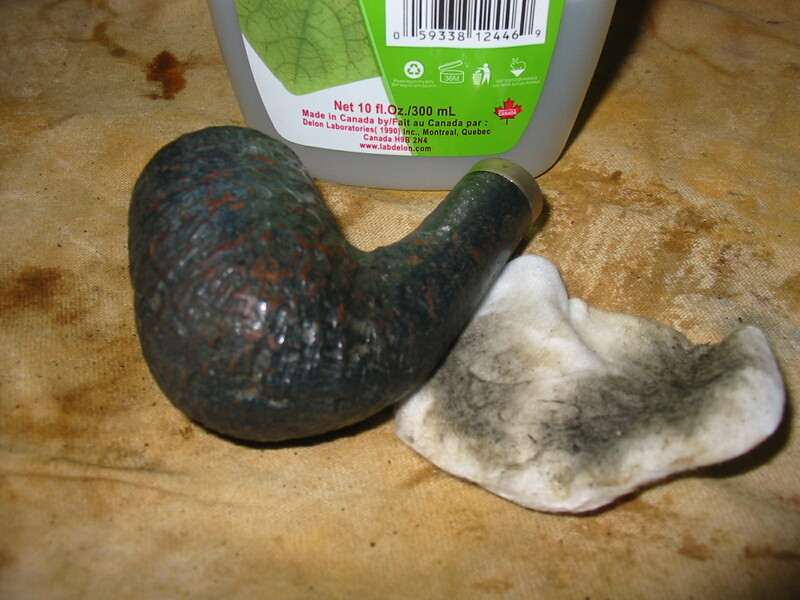 Once the stain was flamed and dry I took it to my buffer and buffed it with Tripoli and White Diamond to remove some of the high spots and give it a shine. 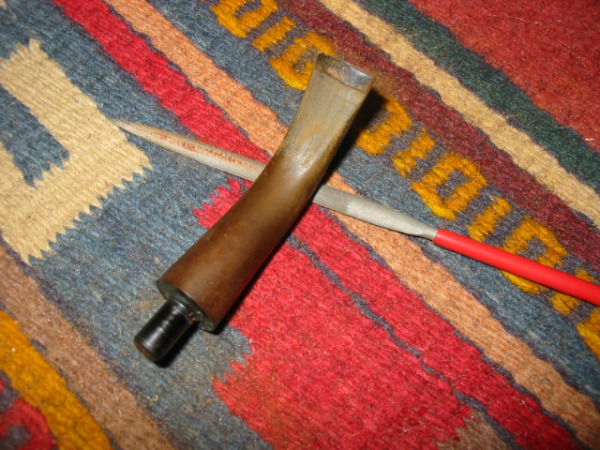 The first three photos below show the polished and buffed pipe. It was still a bit dark to my liking so I took it back to my work table and wiped it down with some isopropyl alcohol on a cotton pad to remove some of the top stain and give me a bit brighter and lighter finish. 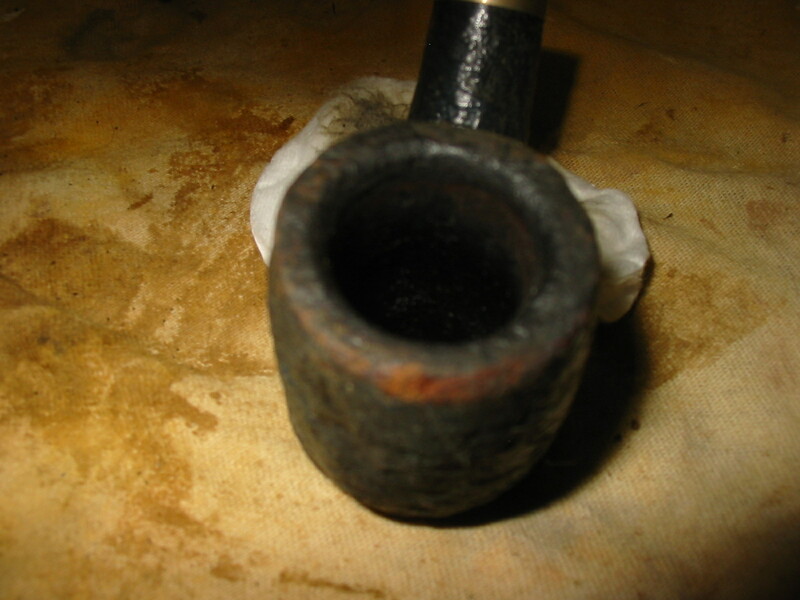 The next three photos show the bowl after it had been wiped down with the alcohol. It was exactly the colour I was aiming for so I set it aside to work on the stem. I decided to open up the slot in the button to make it easier to clean the stem. The first photo below shows the slot before I started working on it. It was very tight and hard to get a pipe cleaner down the stem. 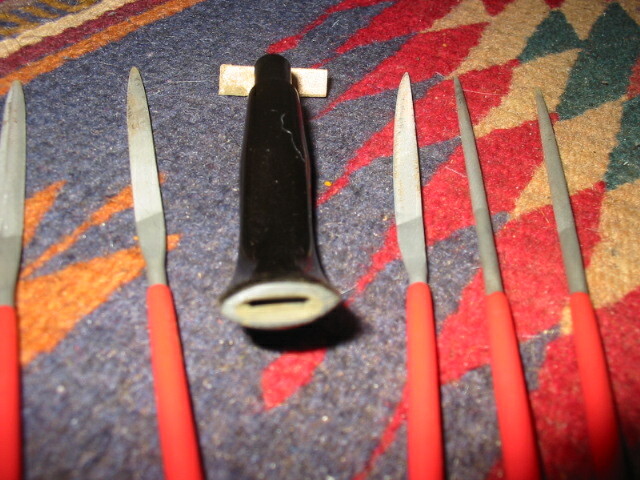 I used several different needle files to open the slot. I took material off the top and bottom of the slot with the needle files and also cut the slot into more of a Y shape as I worked on it. The next four photos show the progress of the opening of the slot with the files. The final photo of the four shows the set of files that I use for the work. I took the photo with the stem on top of the package to give a bit of an idea of the size of the files. I finished the slot with a folded piece of sandpaper and worked it until it was smooth. I then recleaned the stem with pipe cleaners and alcohol until they came out clean. 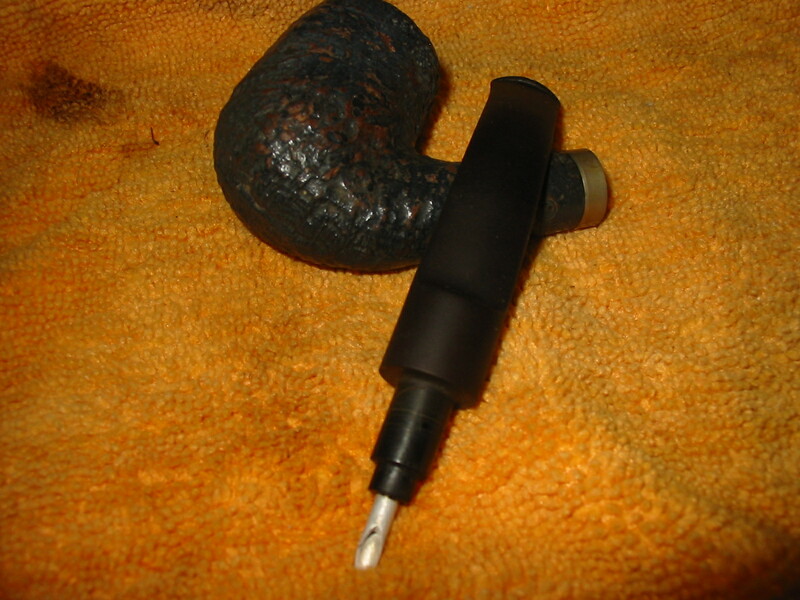 After reworking the slot in the button I worked on removing the oxidation from the stem. 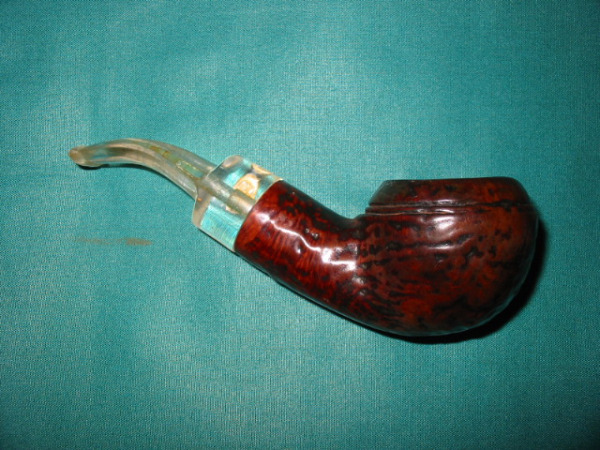 I sanded the stem with 320 grit sandpaper to remove the tooth marks from the underside of the stem and also remove the softened oxidation. 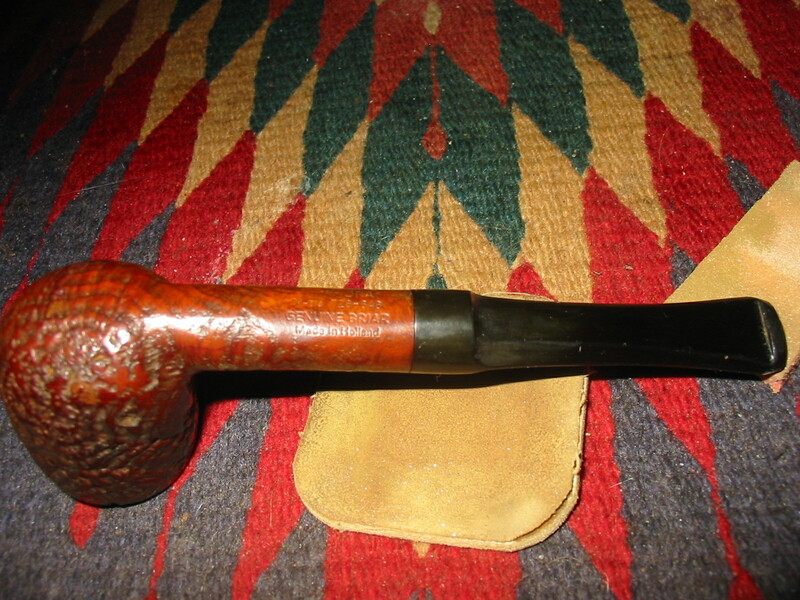 I also used a fine grit sanding sponge to remove scratches and marks to the stem. 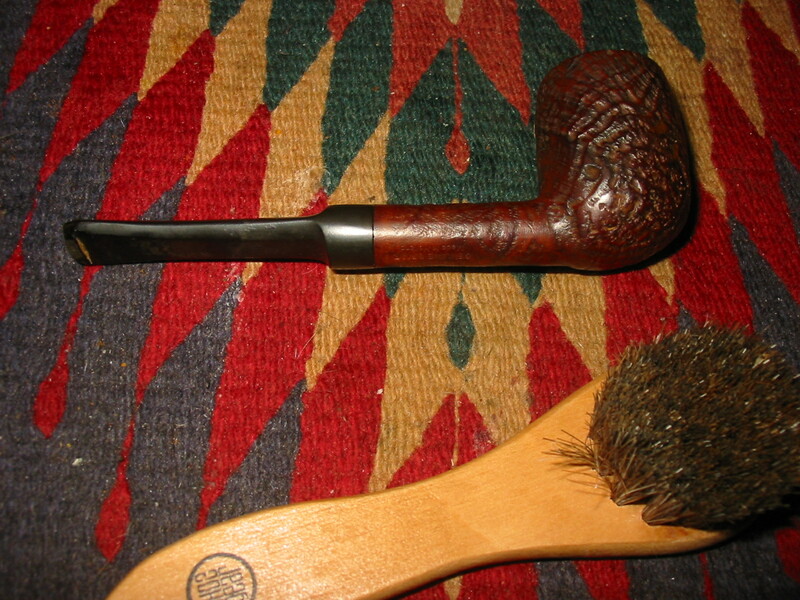 The two photos below show the stem after I had wet sanded the stem with 1500 and 1800 grit micromesh pads. 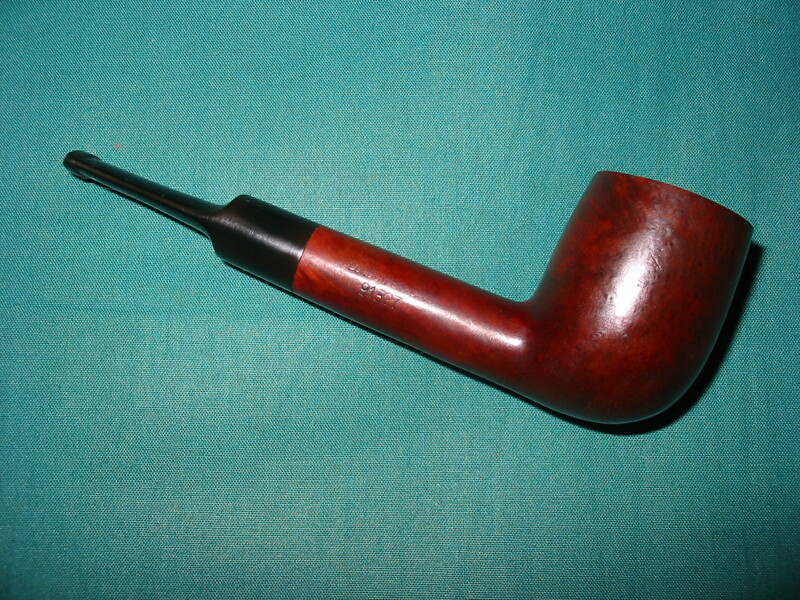 I then used some Maguiar’s Scratch X2.0 polish and scrubbed the stem with a cotton pad. In the photos below the pad is in the lower part of the photos. 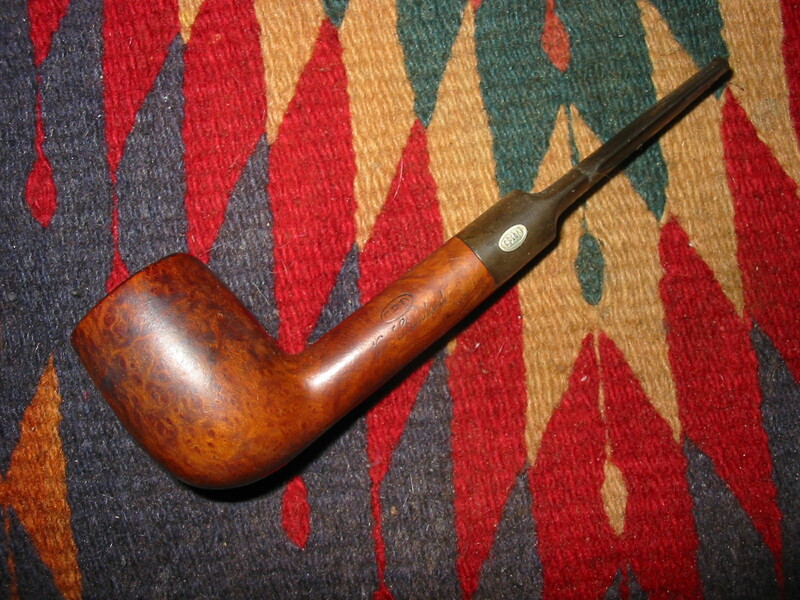 I progressively sanded the stem with the remaining grits of micromesh – 2400-12,000 grit. 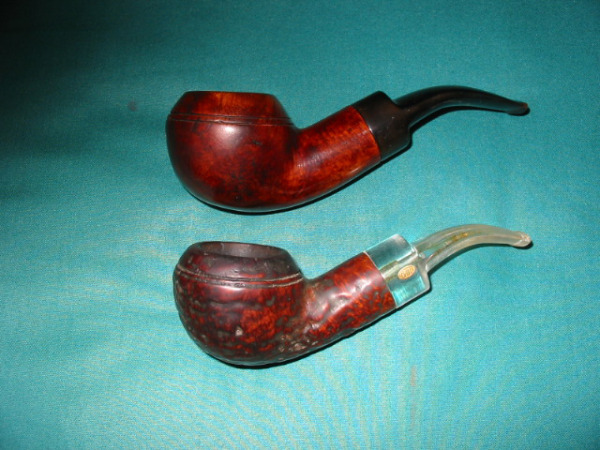 I dry sanded with these until the stem shone. 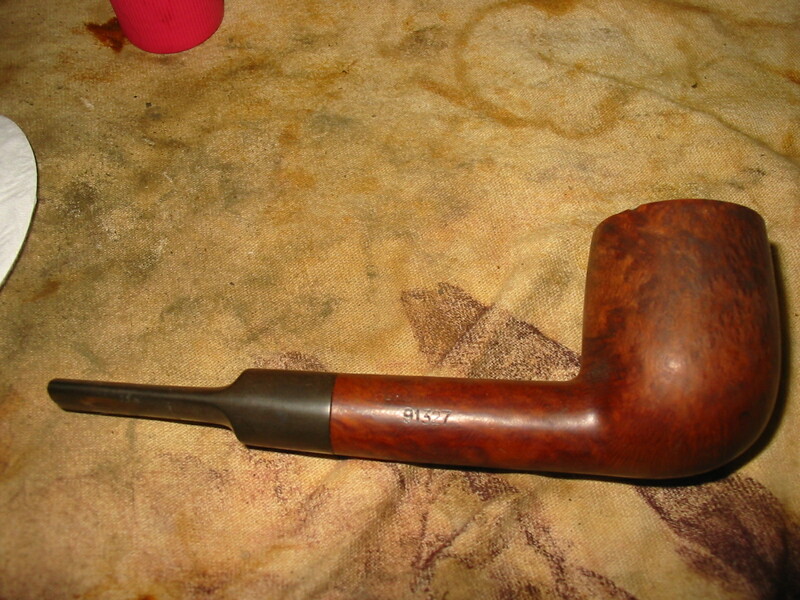 I wiped it down with Obsidian Oil and rubbed it in and then reworked the logo on the stem. I used some liquid paper in a correcting pen. I applied it heavily to the stamped area and then rubbed it off and sanded it with 4000 grit micromesh sanding pads to remove the excess. I repeated the process until I had good coverage on the stamping. 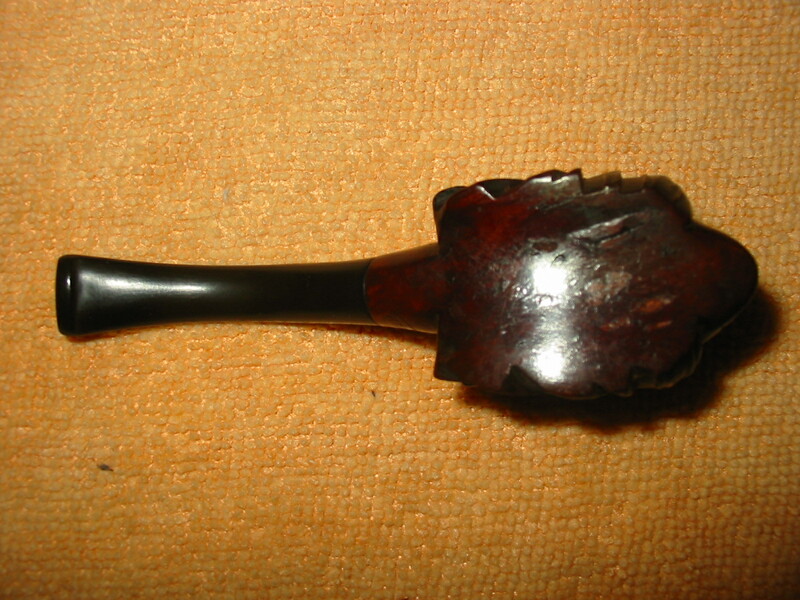 The third and fourth pictures below show the refinished stamping on the stem. 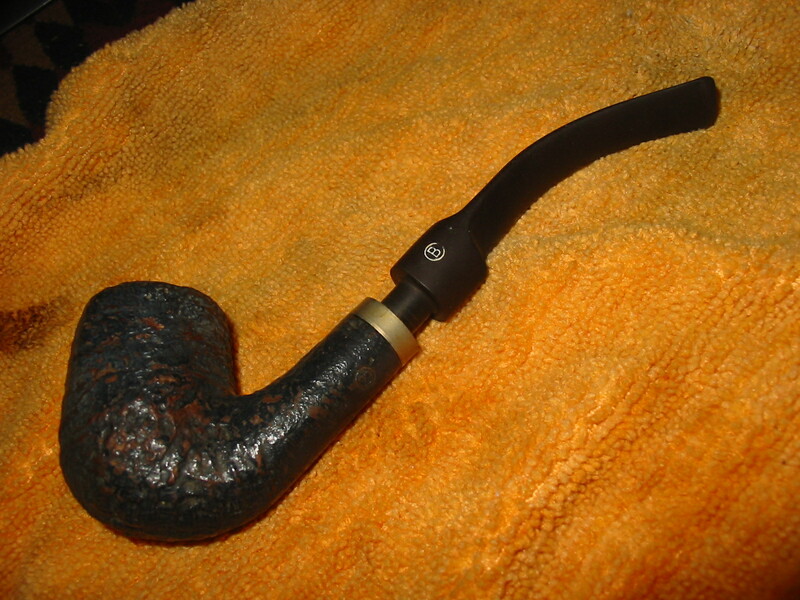 I finished working on the stem by giving it another coat of Obsidian Oil followed by multiple coats of carnauba wax. 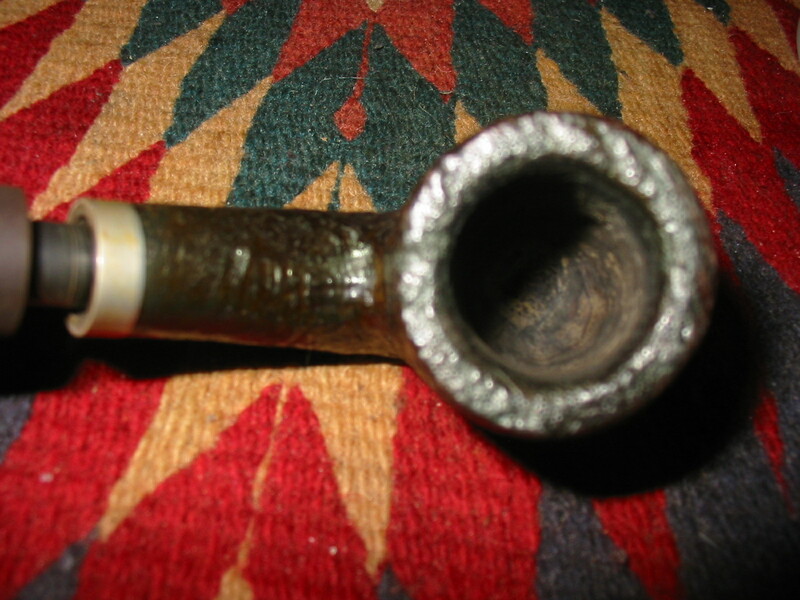 I used a jeweler’s cloth to polish the silver band and then took the pipe to my buffer and gave the bowl a buff with White Diamond. 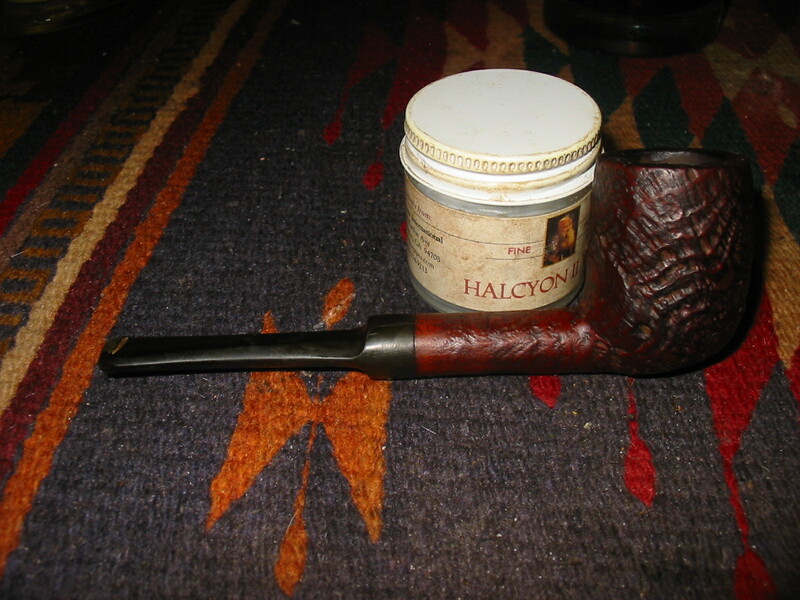 I took it back to the work table and gave it a coat of Halcyon II wax and hand buffed it with a shoe brush. 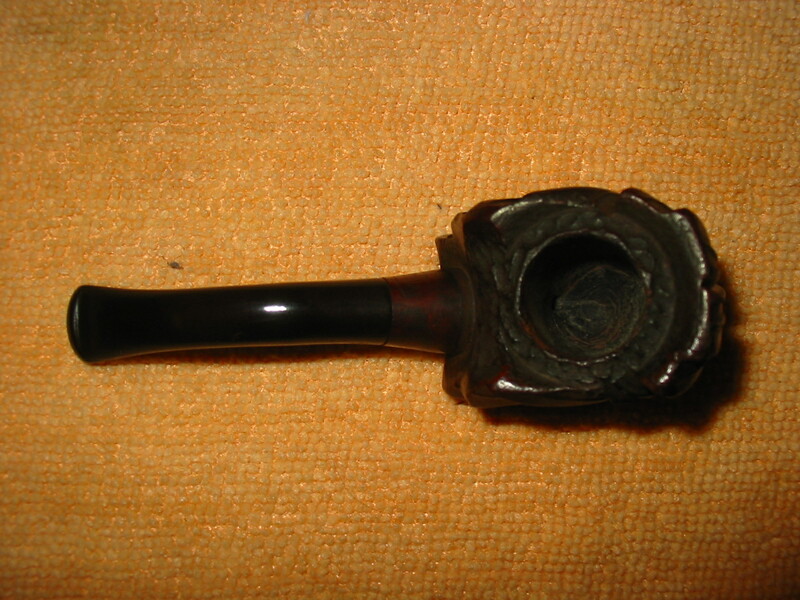 The final series of four photos show the finished pipe. 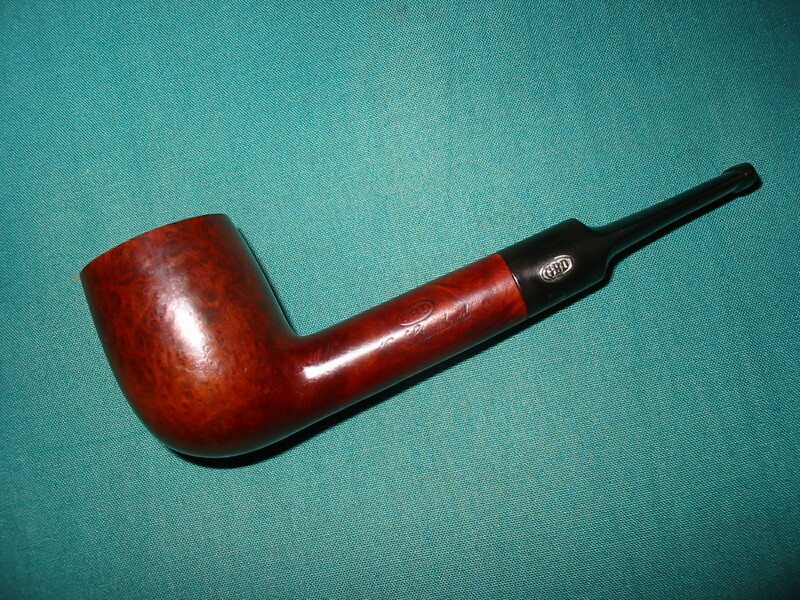 This entry was posted in Pipe Refurbishing Essays and tagged Big Ben Pipes, Big Ben Select Pipes, cleaning a sandblast, opening a slot in the button, Oxidation, pipe refurbishing, recolouring stamped logos on the stem, restaining a pipe, white out on stem logo stamps on January 20, 2013 by rebornpipes. 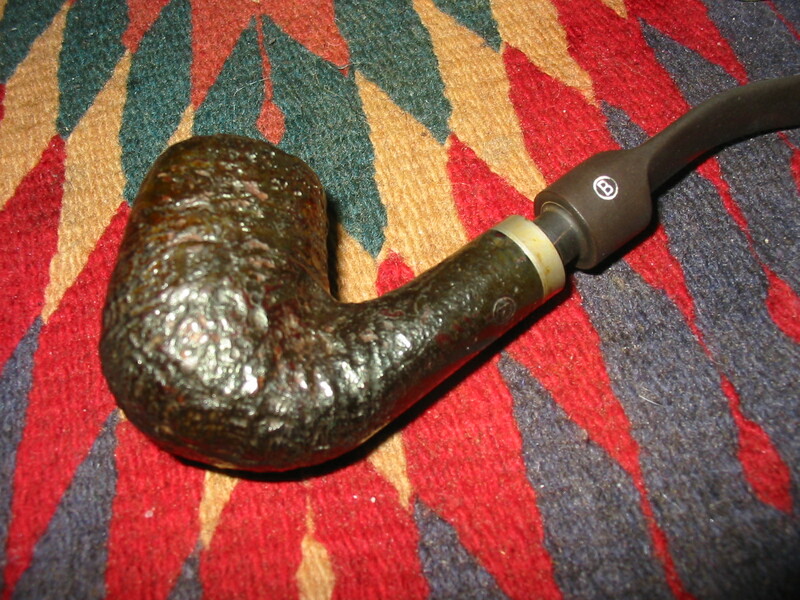 I picked up this little GBD New Era Billiard while traveling awhile back. 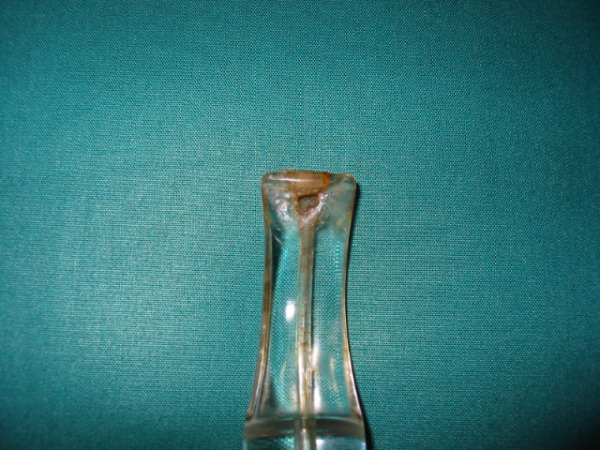 It had a cracked and broken stem. 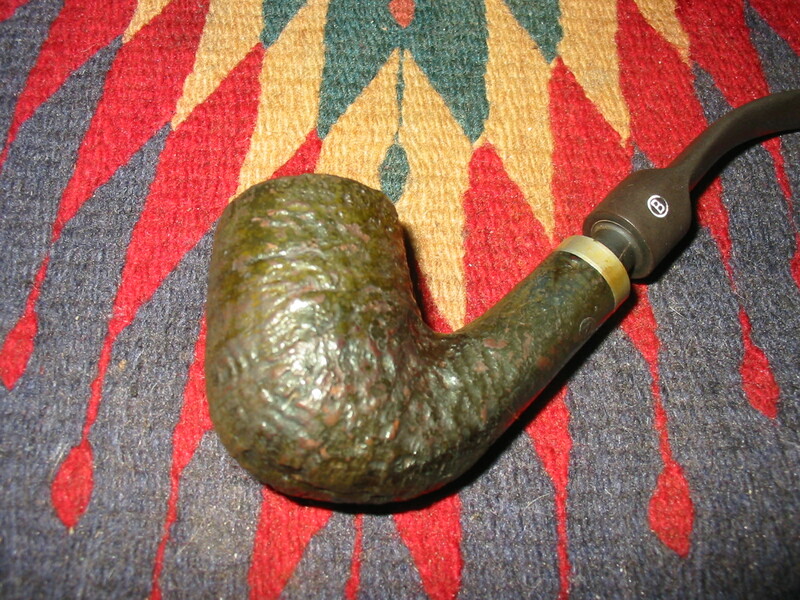 The GBD roundel was still intact and in good shape. The bowl was a mess in that the rim was hammered. The top of the rim was chipped and rough. It was also out of round from over reaming. 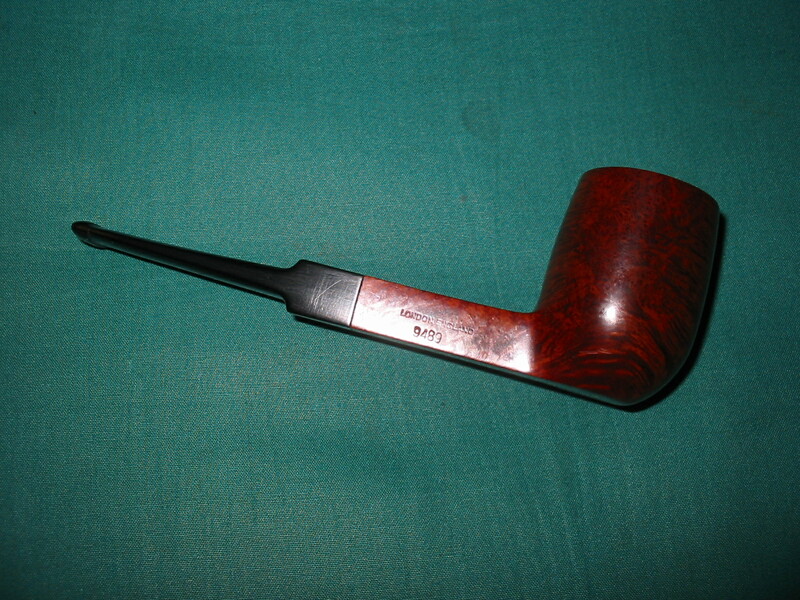 Since I had found it I had been looking for a new stem for a replacement. 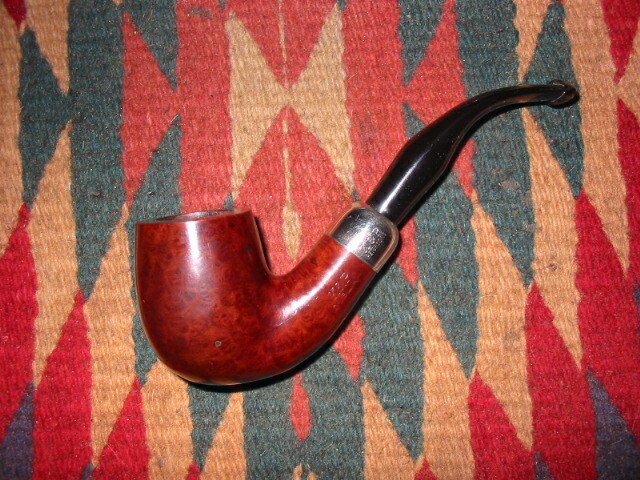 I had searched EBay and some of my other usual spots to see if I could pick up a GBD stem or even broken pipe that would work for me. 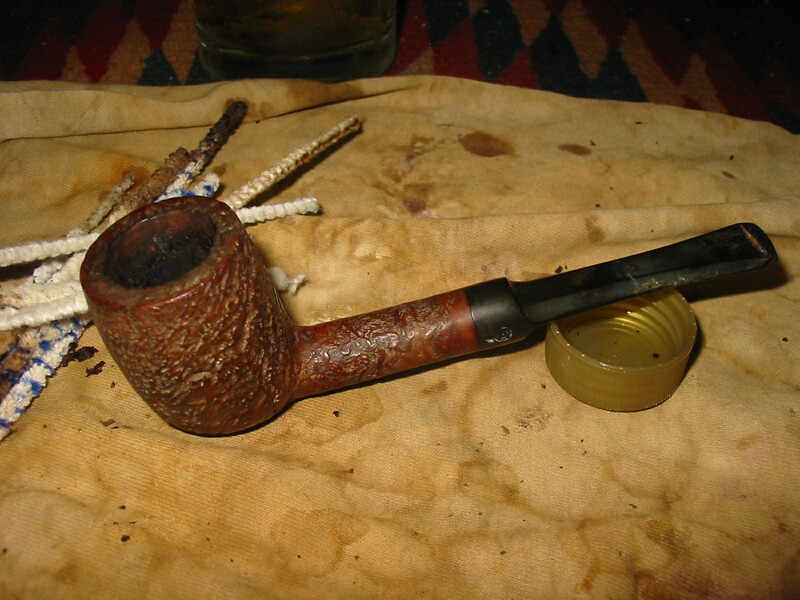 This evening I gave up on the hunt and decided to see what I could do with the existing stem. 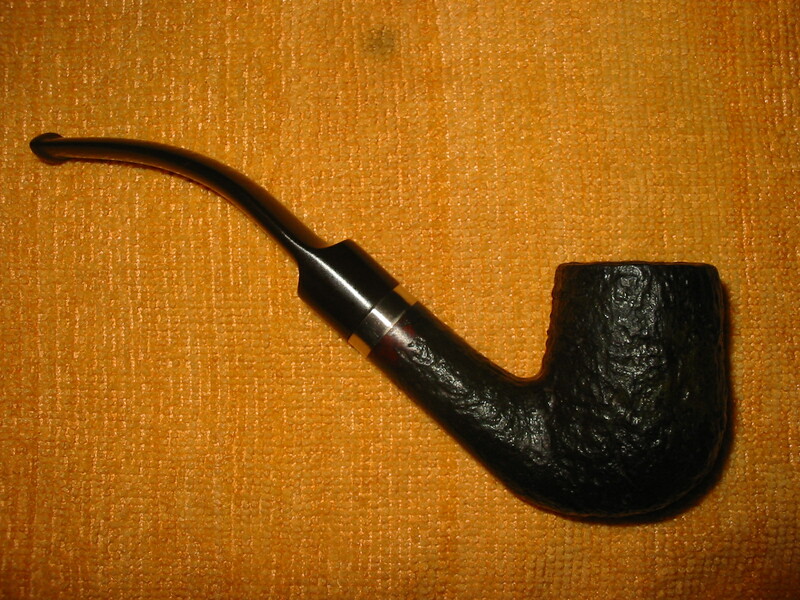 I set out to transform the pipe from a billiard to a lovat by shortening the stem. 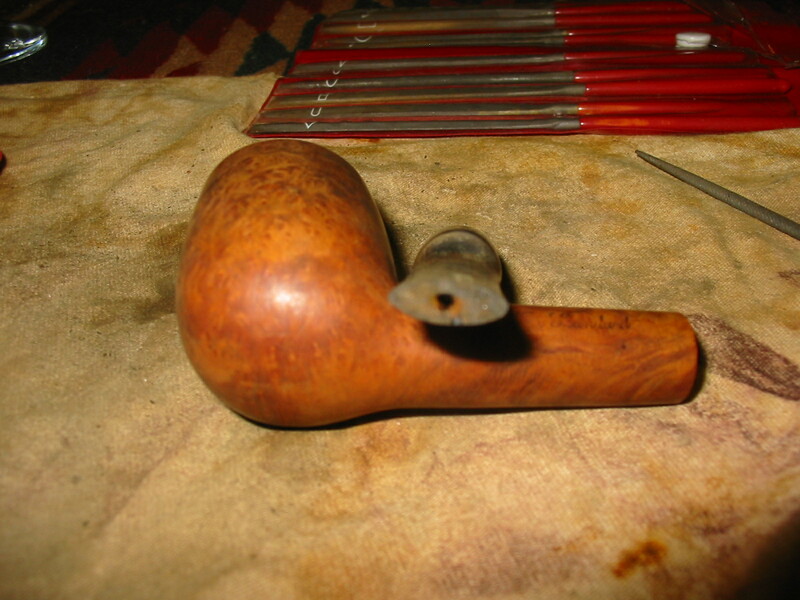 The first step in that process was the shortening of the stem – the removal of the damaged portion of the stem would have to go. 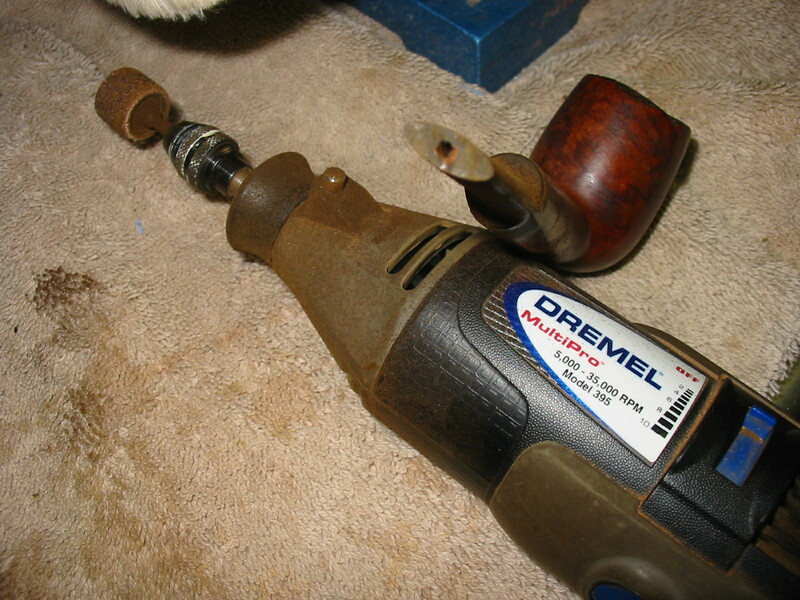 I used my Dremel with the sanding drum to remove the broken part of the stem and cut a straight line across it. The next three photos show the stem before the cutting and after. 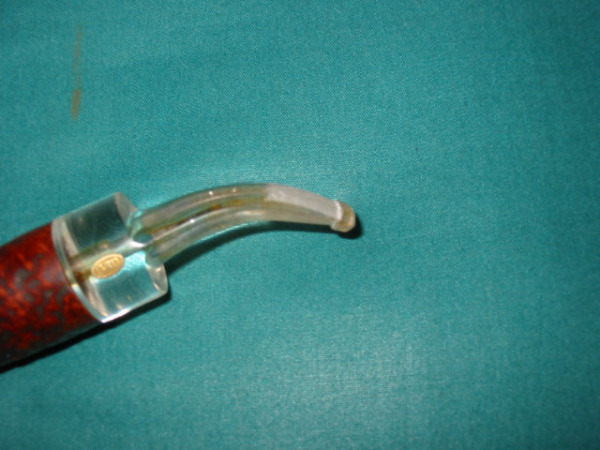 The fourth photo in the series shows the airway in the stem. 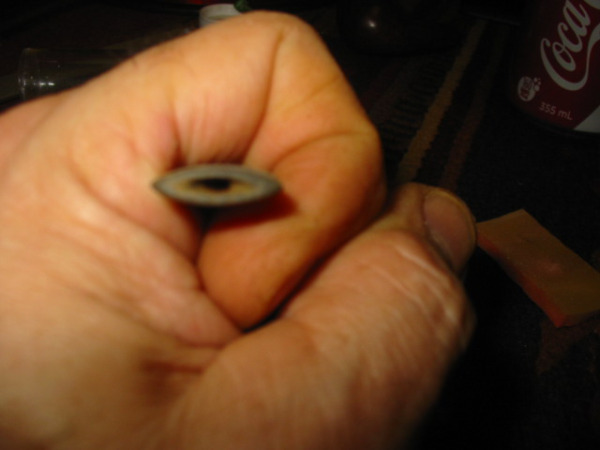 There was plenty of vulcanite for me to cut a new button on the stem and to open a slot in the button. 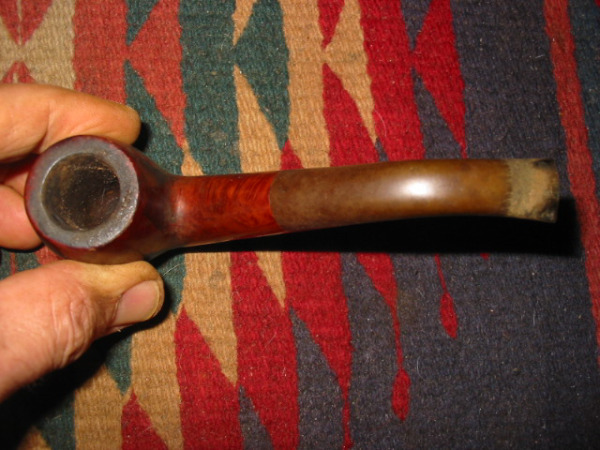 The next series of six photos show the process and results of topping the bowl. 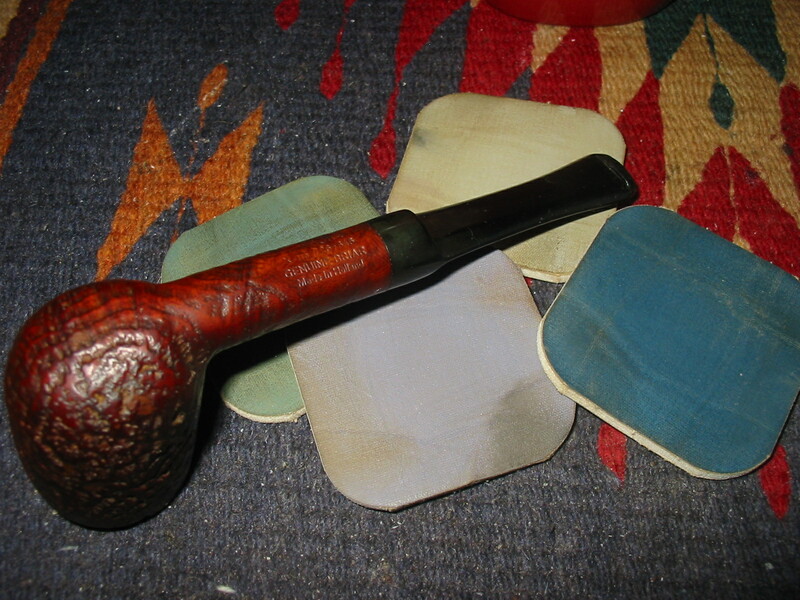 I used emery cloth on a solid board to sand away the damage to the rim. 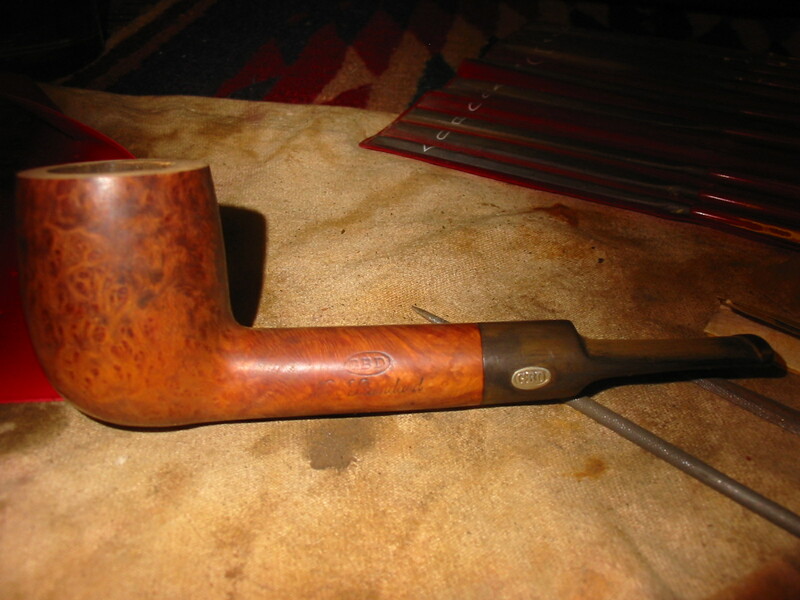 I chose the emery cloth because the damage was quite deep and extensive and I wanted to be able to remove the rough briar before sanding the rim with higher grit sandpaper. 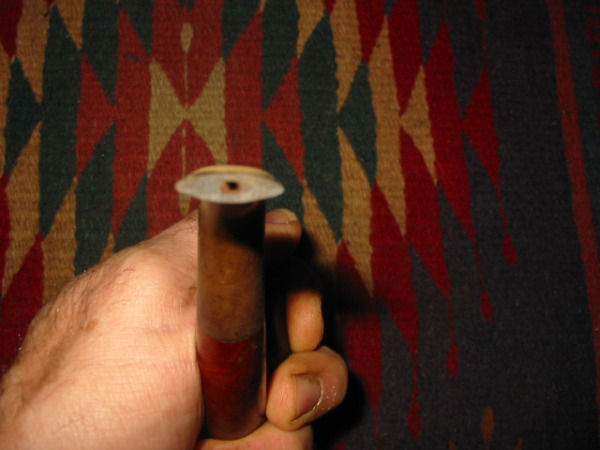 I hold the pipe with the rim flat against the sandpaper and work the pipe over the surface of the sandpaper in a clockwise motion. 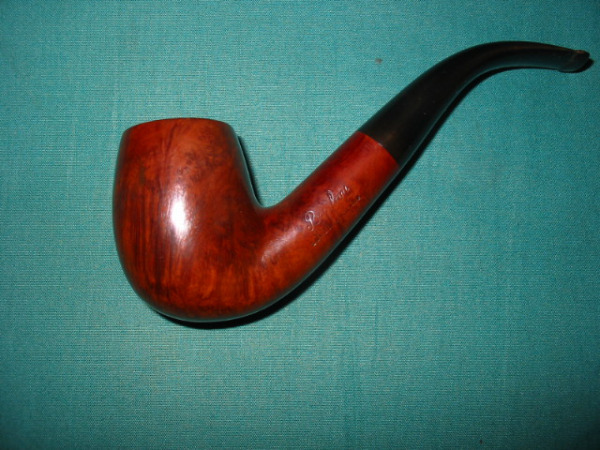 I find that this works better than using a horizontal or vertical motion and minimizes the scratches on the surface of the briar. I sanded the top until all of the damage was removed on the rim. 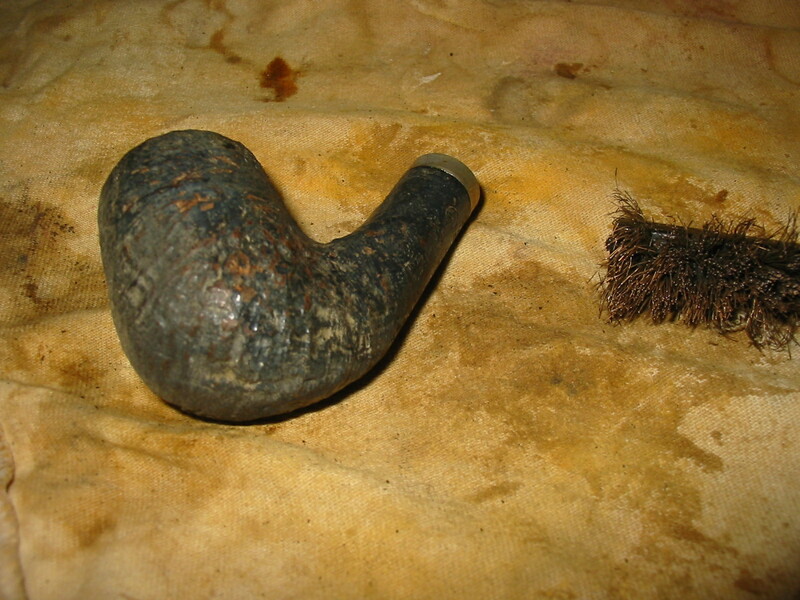 There was one spot at about 5 o’clock on the rim where there was a large chunk taken out of the briar. 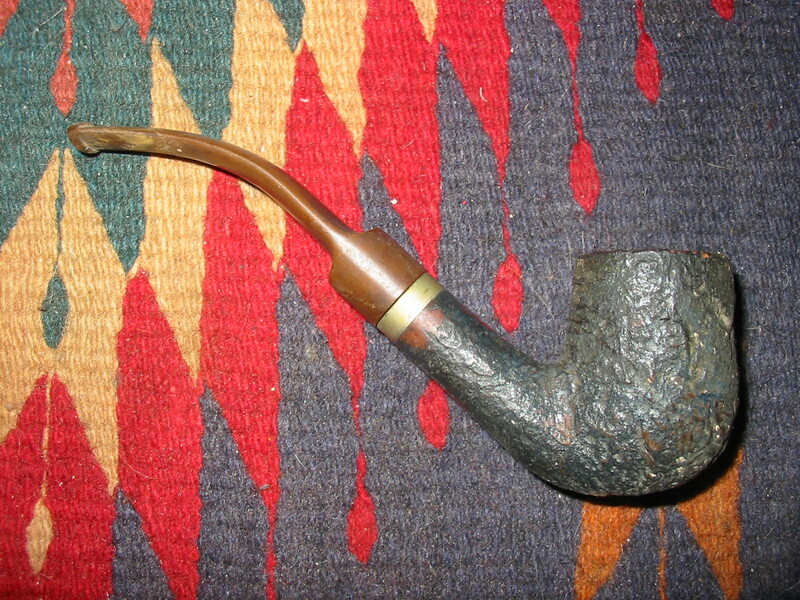 I minimized that as best as I could but could not remove it all without damaging the profile of the pipe. 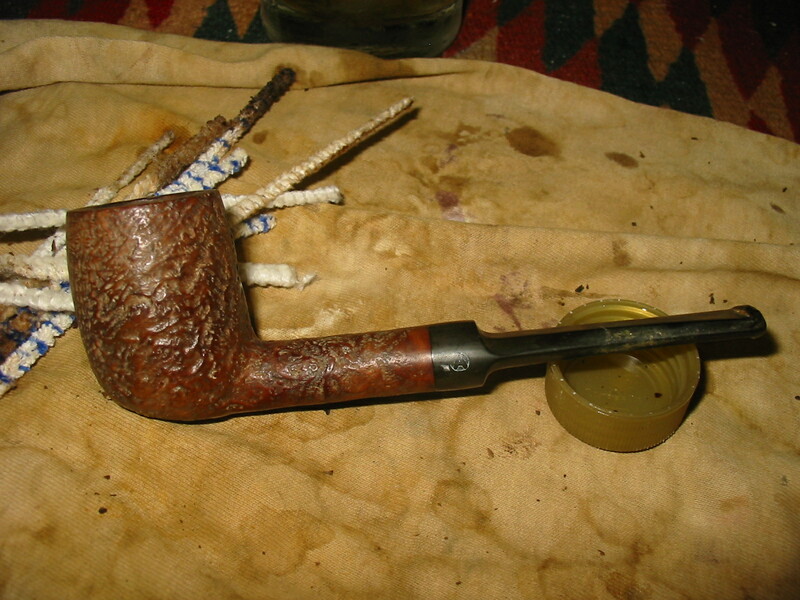 Once the rim was finished I decided to clean the pipe inside and out. 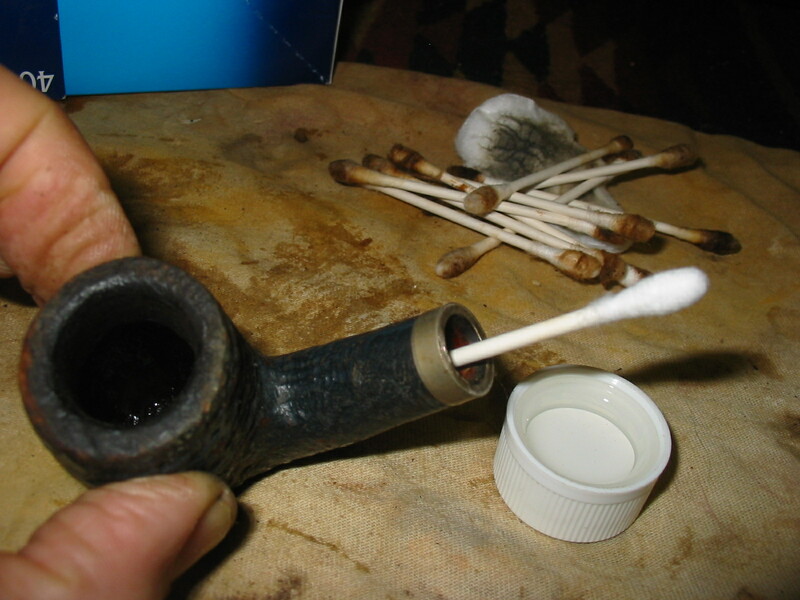 I used Everclear and pipe cleaners and cotton swabs to clean out the interior of the pipe and stem and then some acetone on a cotton pad to wipe down the bowl surface. I also sanded the rim with 320 grit sandpaper and went on to use 400 and 600 grit wet dry sandpaper to wet sand the rim. 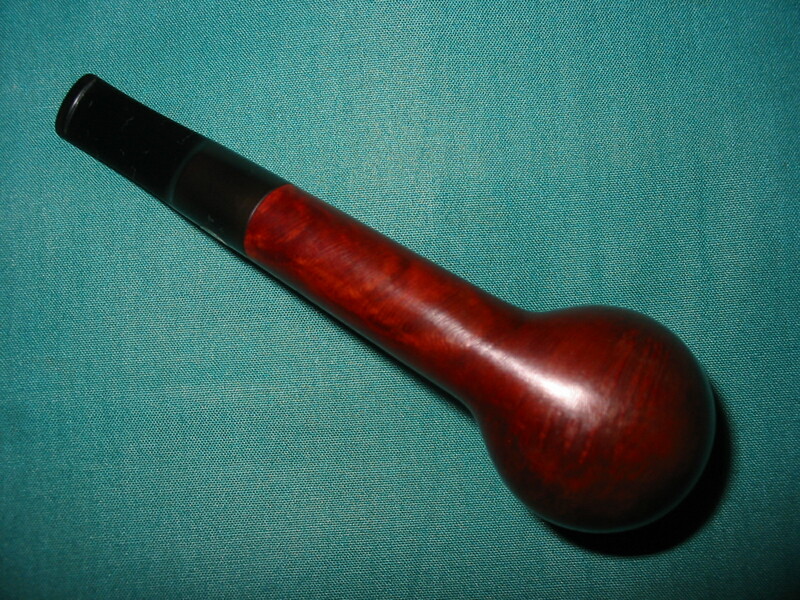 In the four photos below you can see the little lovat being born. 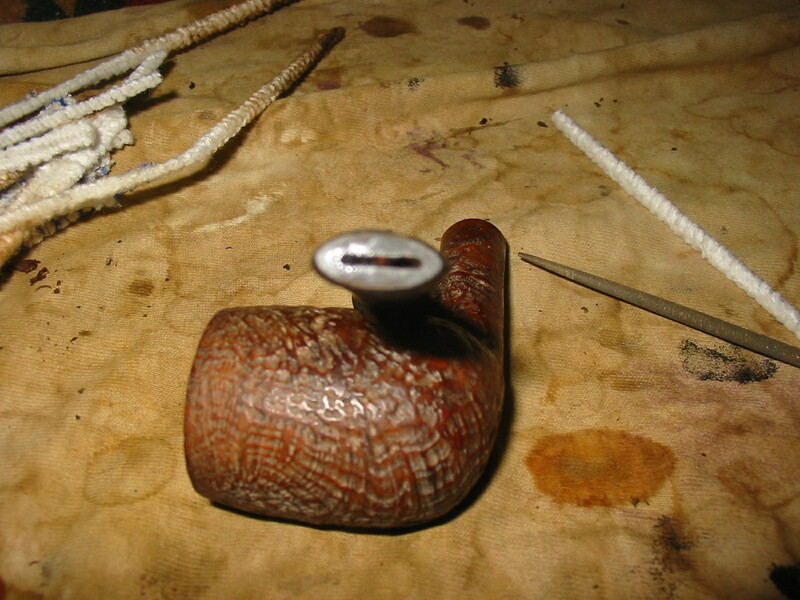 Once the pipe was clean I decided to work on the slot in the end of the stem before cutting the button. There is no logical order to what I worked on next; it was more a matter of whatever I wanted to look at first. 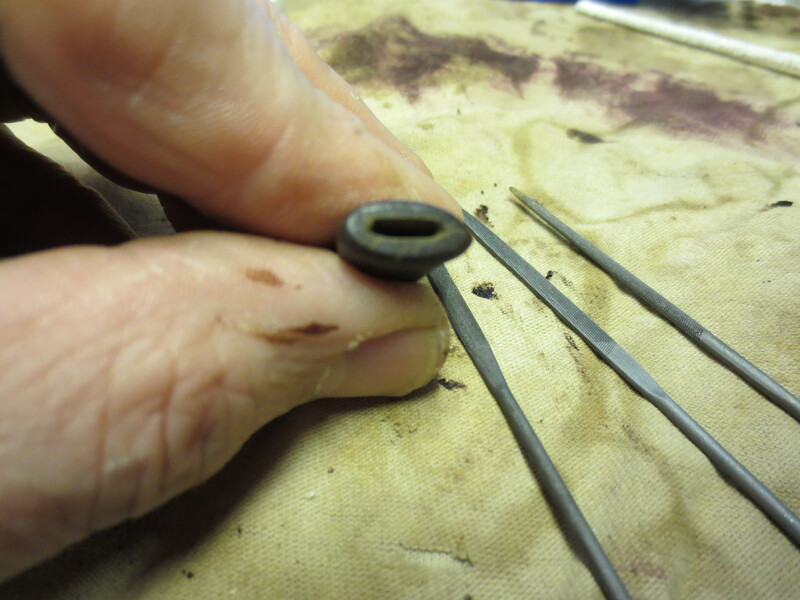 I opened the slot with needle files and started to shape the slot into the oval opening I was aiming for. 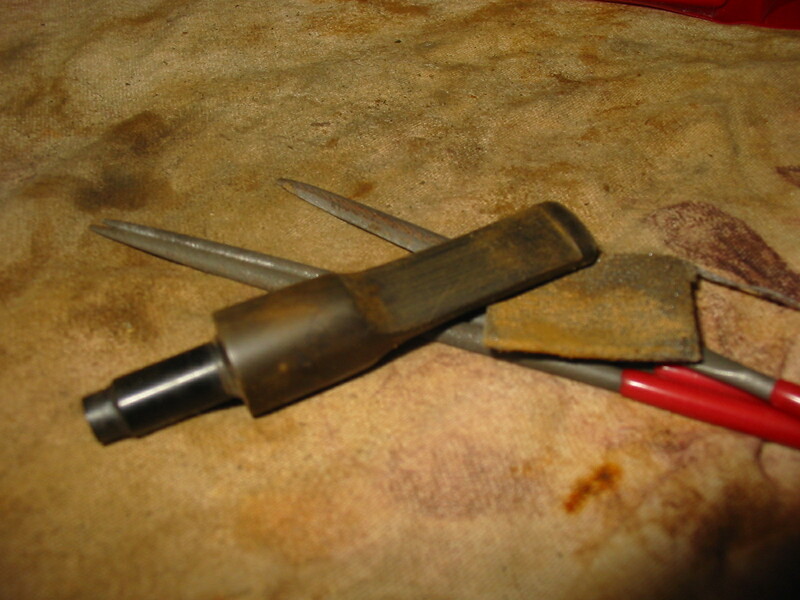 Once it was roughed in I cut the button on the surface of the stem with needle files. The first two photos show the slot taking shape. The next seven photos show the progress of the button and the adjustments to the slope of the stem. 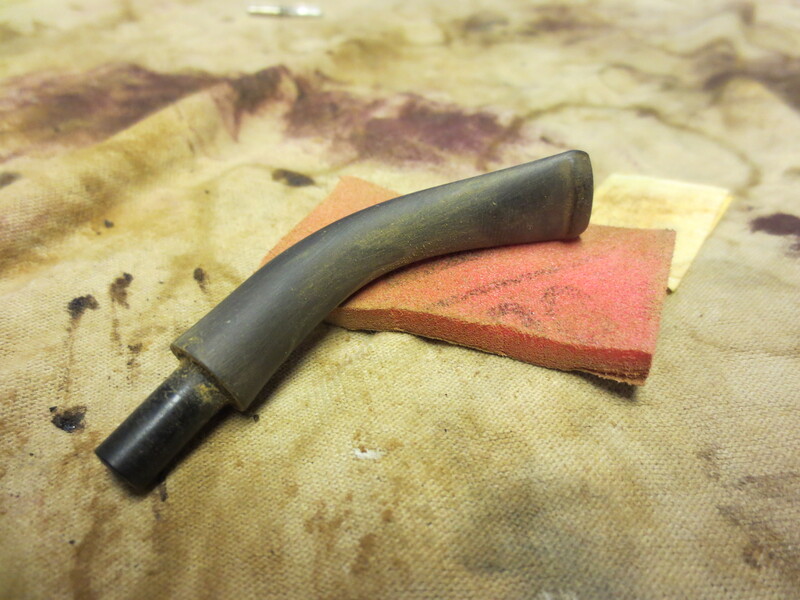 I carved the stem with my files removing vulcanite on the top to flatten the profile of the rounded stem. 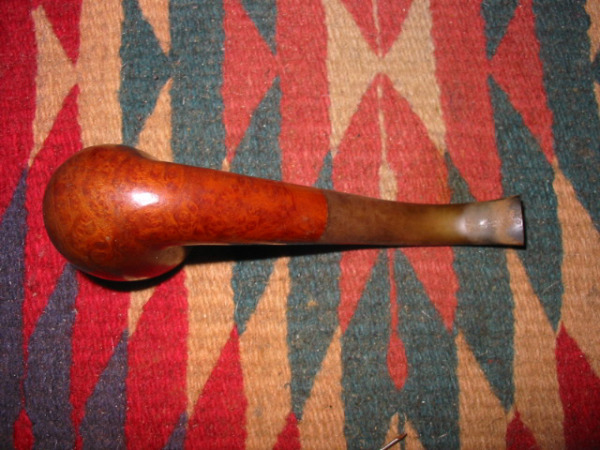 It took quite a bit of sanding to the top and bottom of the stem to achieve the right angles. 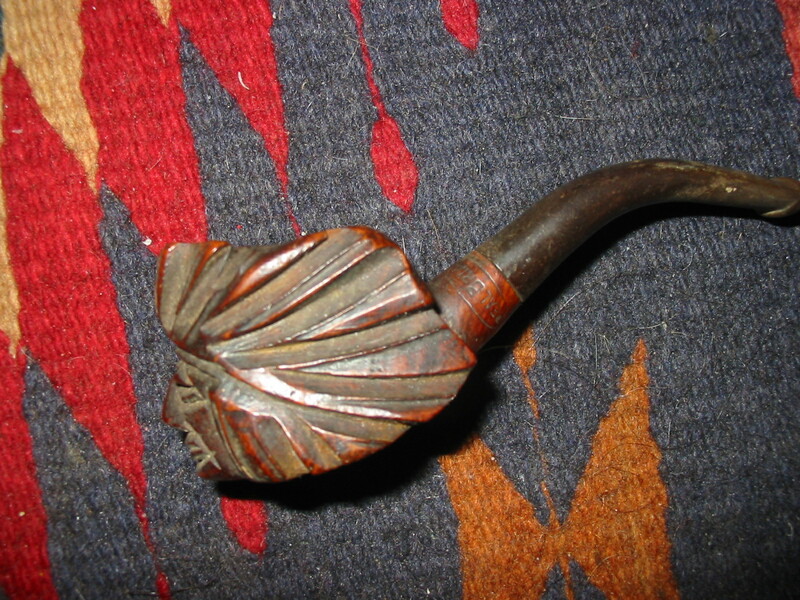 I also used folded emery cloth to smooth out the flow and remove the file marks from the surface of the stem. By the seventh photo you can see the progress of the button and the slope quite clearly. 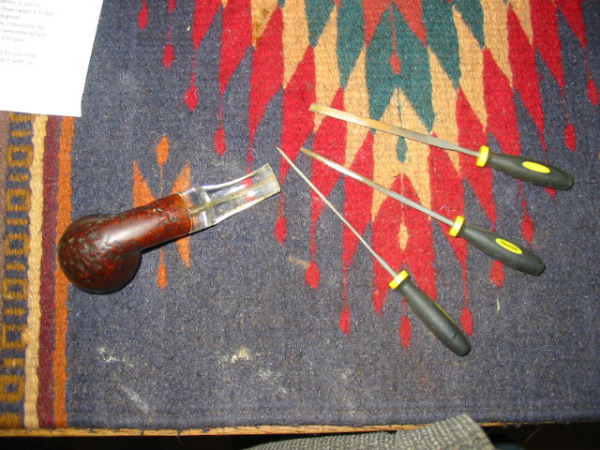 The next series of six photos show my next steps in shaping the stem. 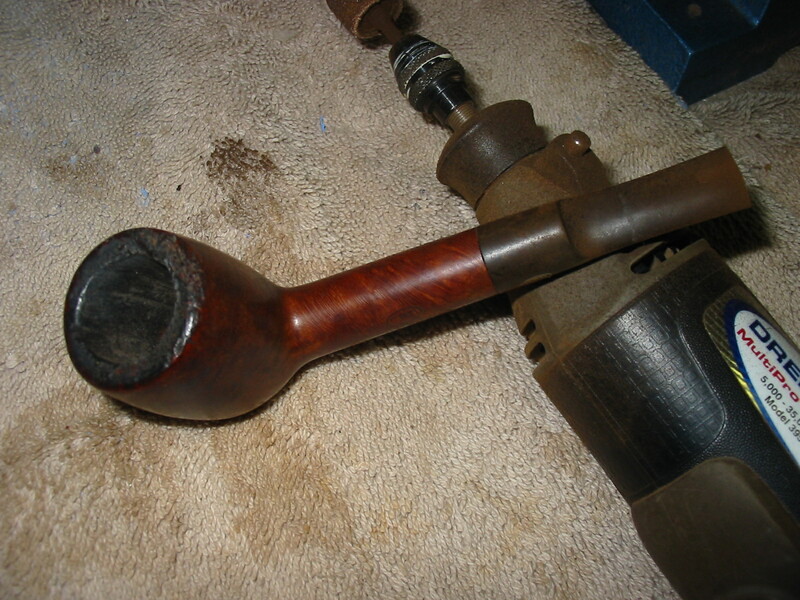 I put it back on the pipe and continued to work on the slope of the stem surface and the definition of the button. 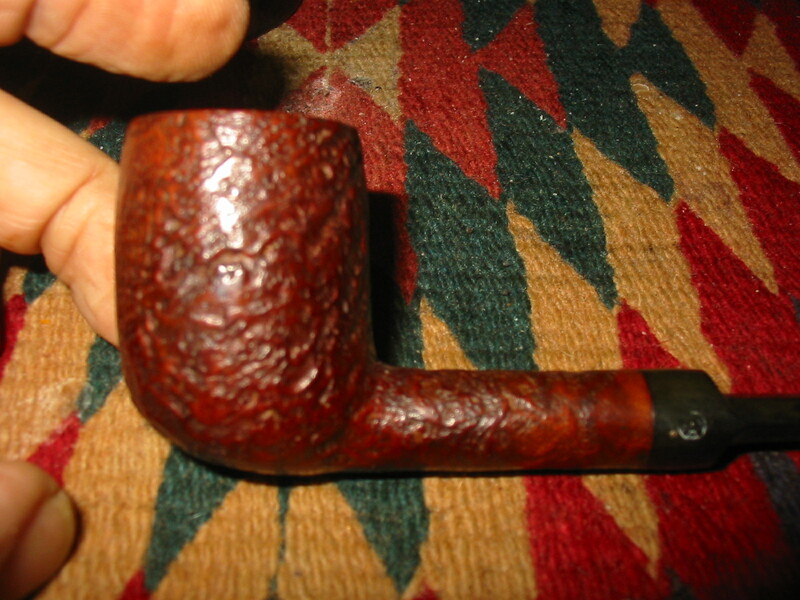 By the sixth photo the stem is virtually done in terms of shaping. 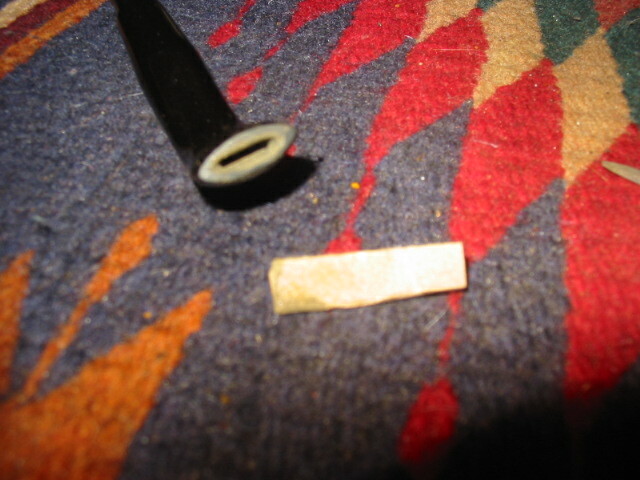 I finished cutting the slot and smoothing it out by a folded piece of sandpaper. I also sanded the remaining parts of the stem on the saddle to remove the oxidation that was prevalent on that stem as a whole. 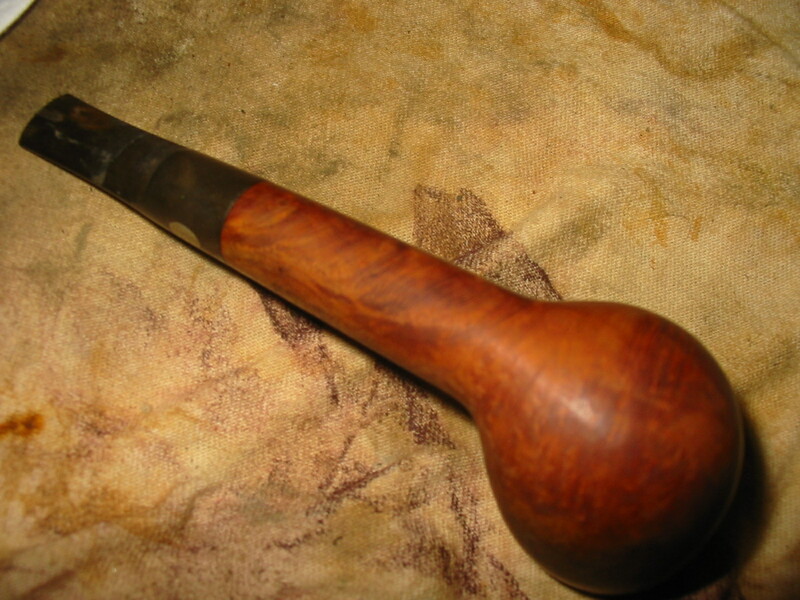 Once the shaping was finished and the rough sanding done to the surface of the stem I progressed through 320 grit sandpaper and 400 and 600 wet dry sandpaper used wet to remove the scratches left behind by the emery paper. It took quite a bit of fine sanding to work around the roundel and not damage the stamping of the brass. 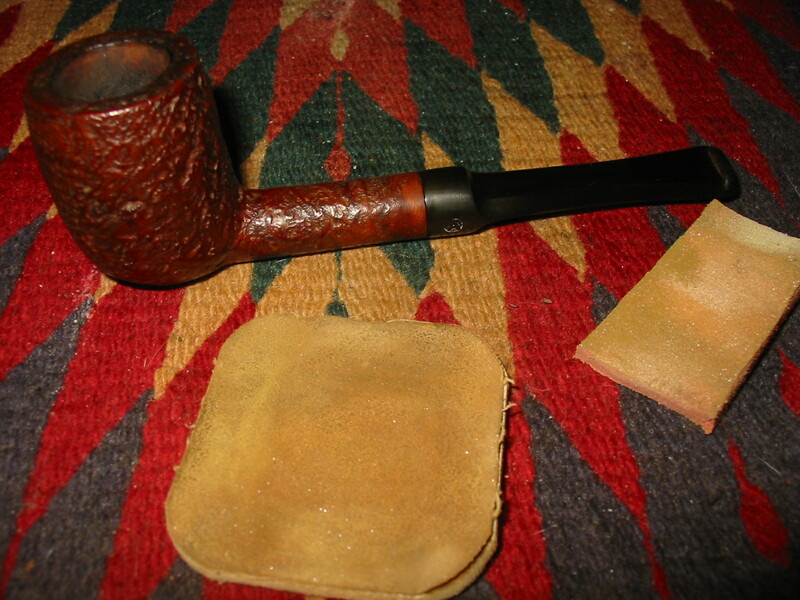 When I finished with the sandpapers I worked with micromesh sanding pads. 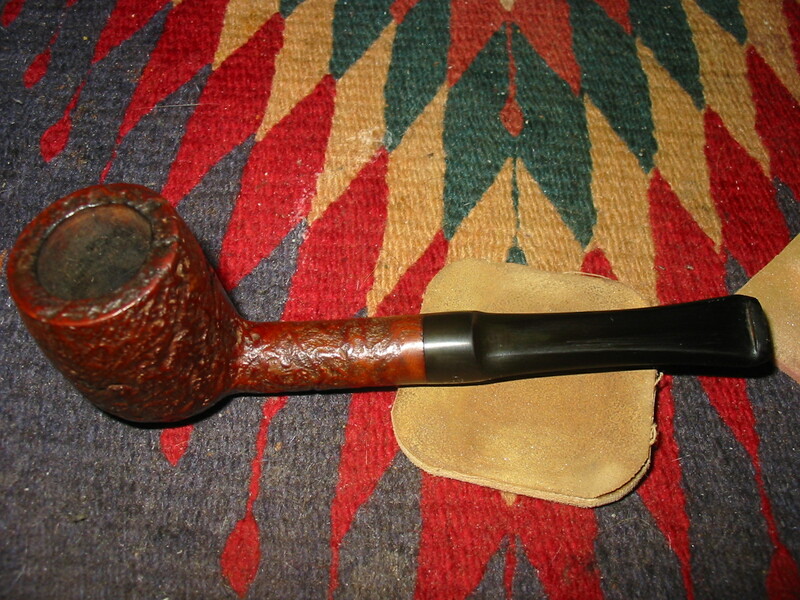 I used the first three grits – 1500, 1800 and 2400 and wet sanded the stem. I find that the rounded corners of the sanding pads allow me to work closely around the roundel and clean up the oxidation and scratches. 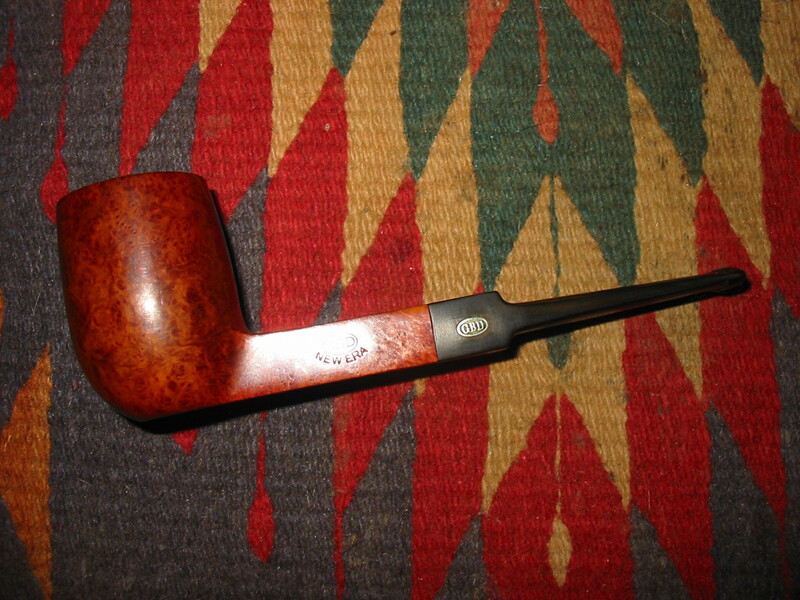 I then polished the stem with Maguiar’s Scratch X 2.0 to remove the surface scratches and to see what remained to work on in terms scratches and marks. 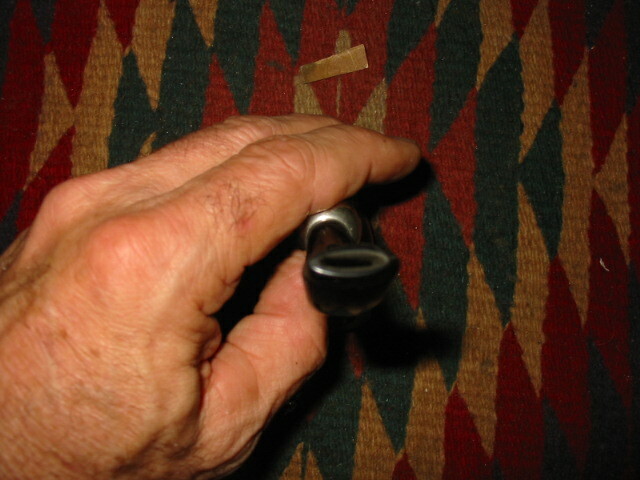 I rub the polishing compound on with my finger and work it over the surface of the stem and into the angles of the button. 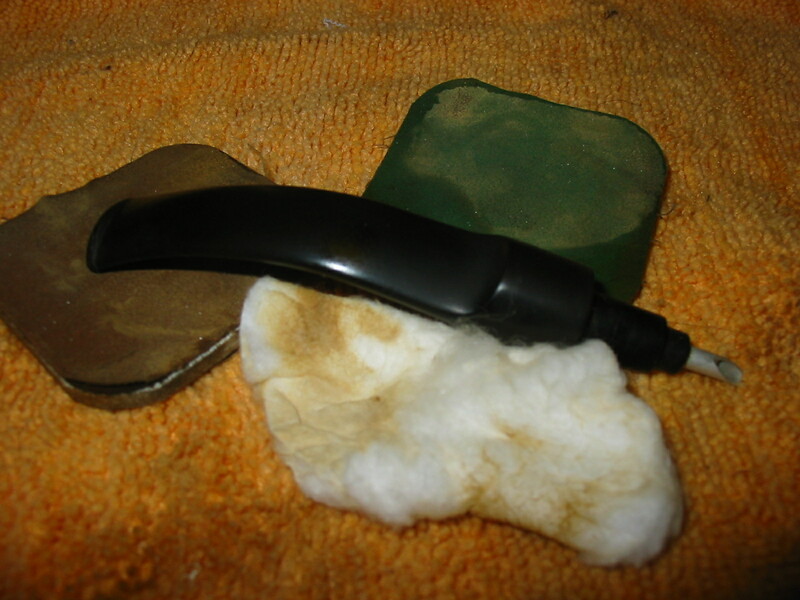 Once it is applied that way I scrub it with a cotton pad to polish and remove the compound. 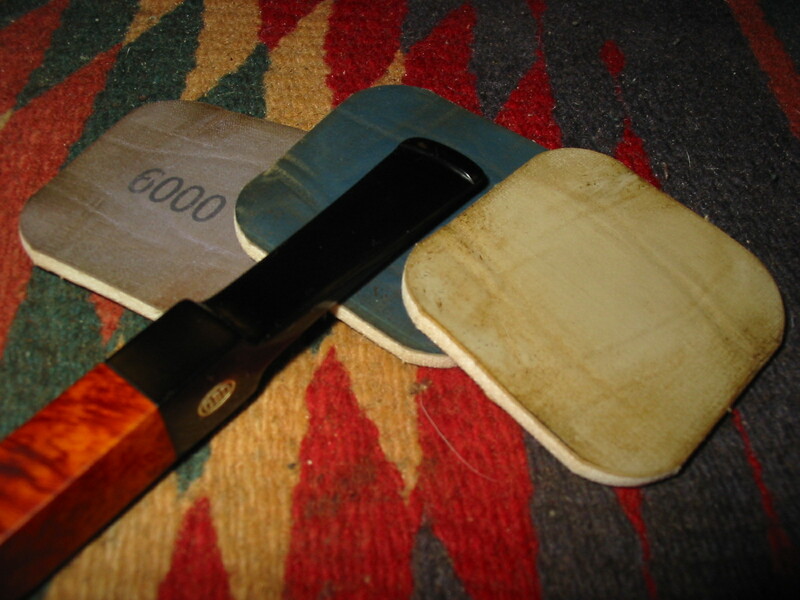 I then sanded it with the next three grits of micromesh – 3200, 3600 and 4000. 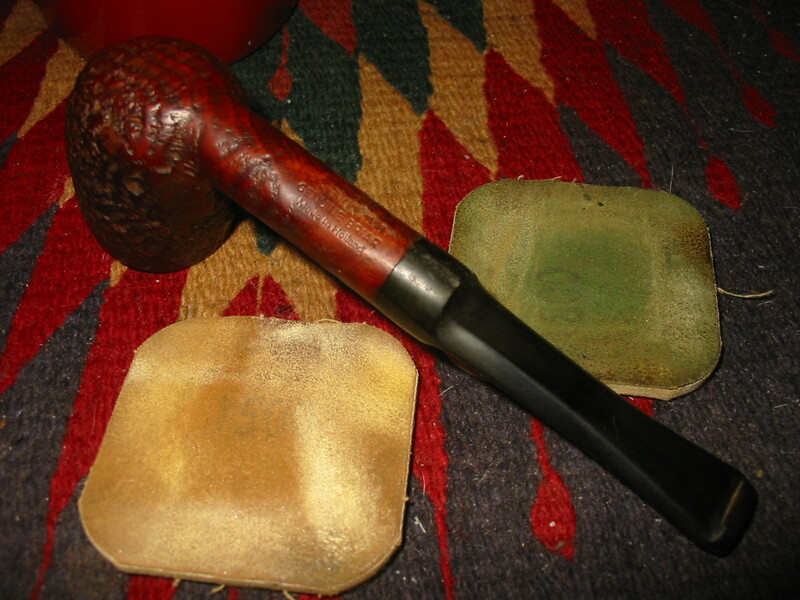 I dry sanded with these grits and began to see a deep shine emerging. 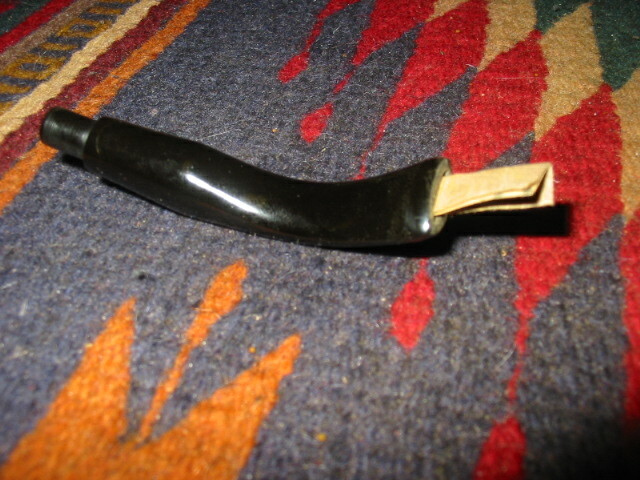 Once finished with the 4000 grit I rubbed the stem down with Obsidian Oil and set it aside. 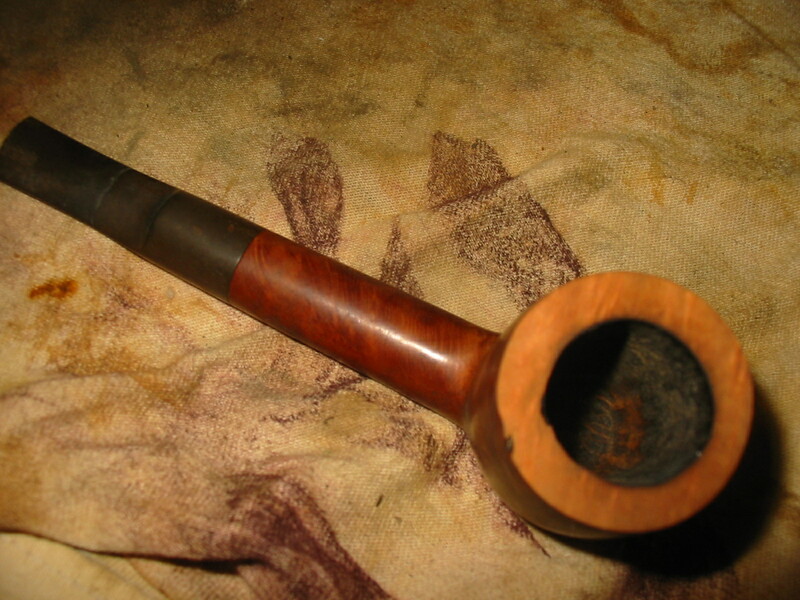 I then stained the pipe with medium brown aniline stain that I thinned down 2:1 with isopropyl. I flamed the stain to set it and then reapplied the stain, flamed it again and then reapplied it to the rim a third time and flamed it. I took it to the buffer and used Tripoli and White Diamond to buff it. 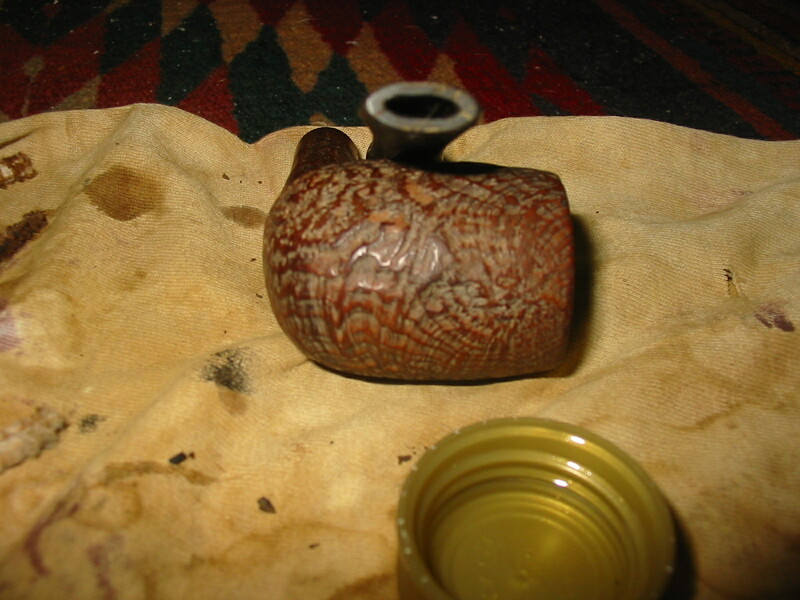 I wiped the bowl down with isopropyl on a soft cotton pad to lighten the stain and make the grain variations more visible. 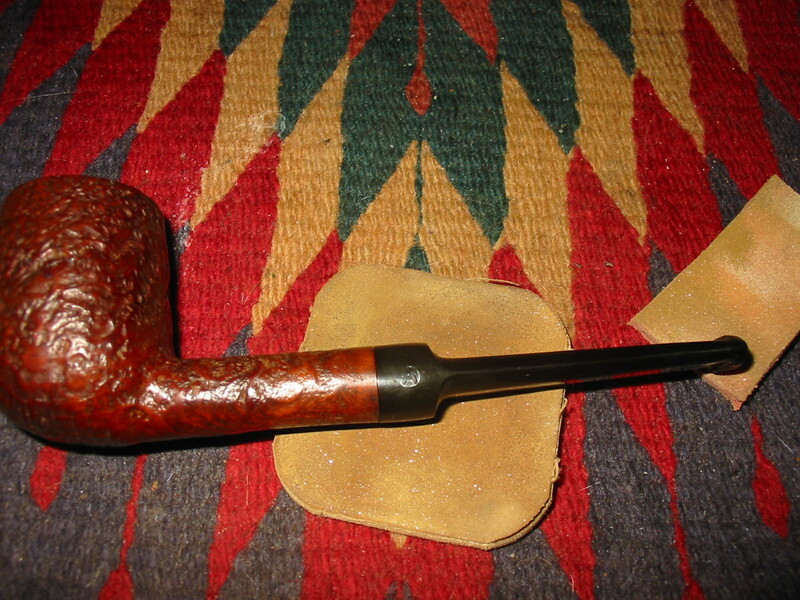 I put the stem back on the pipe and finished sanding it with the final three grits of micromesh – 6000, 8000, 12,000. 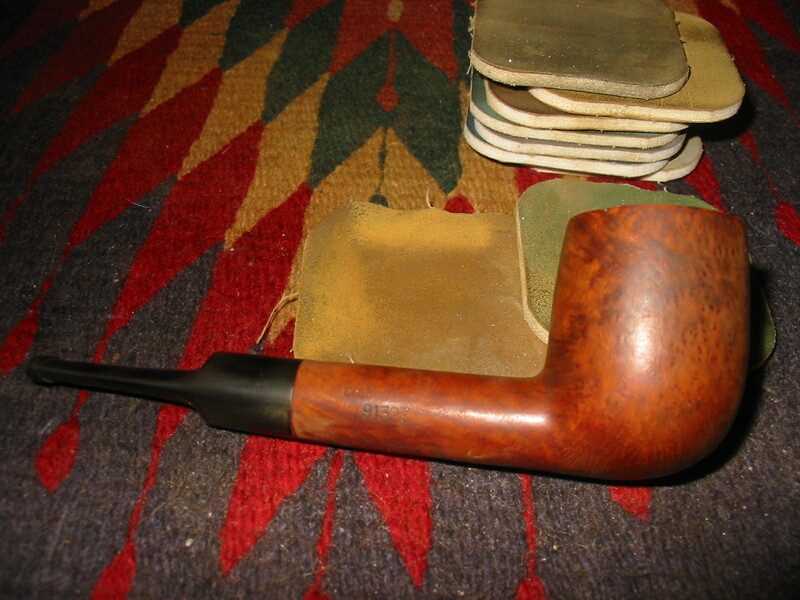 After dry sanding with these pads I took the pipe to the buffer and buffed it with White Diamond. 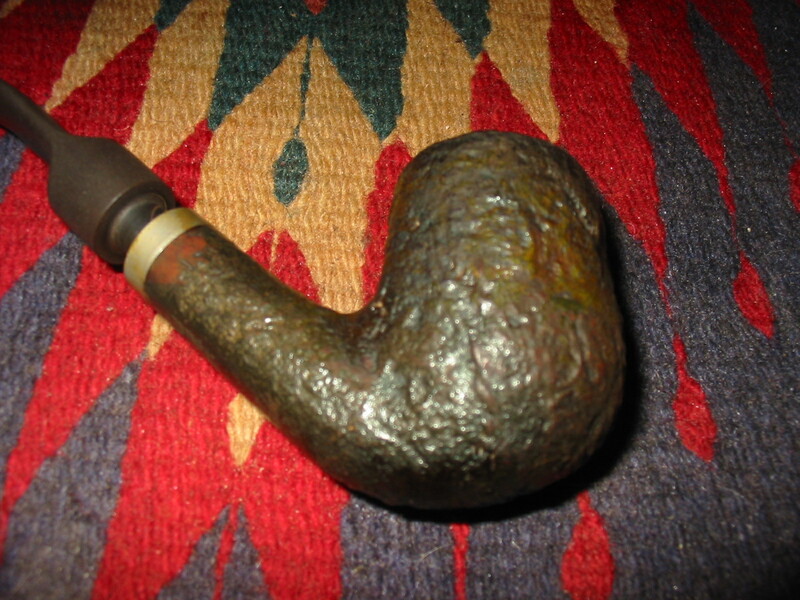 I finished by giving pipe and stem several coatings of carnauba wax and buffing with a soft flannel buff. 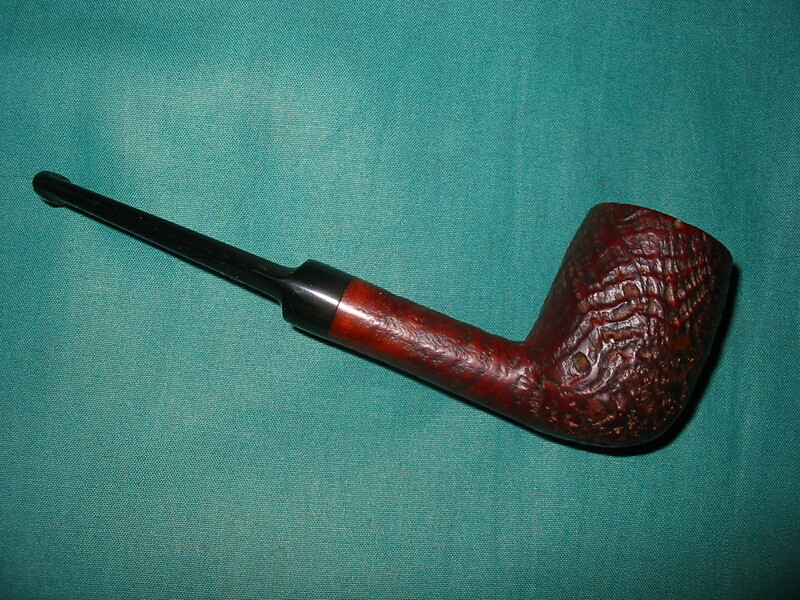 The new little lovat is pictured in the four photos below. 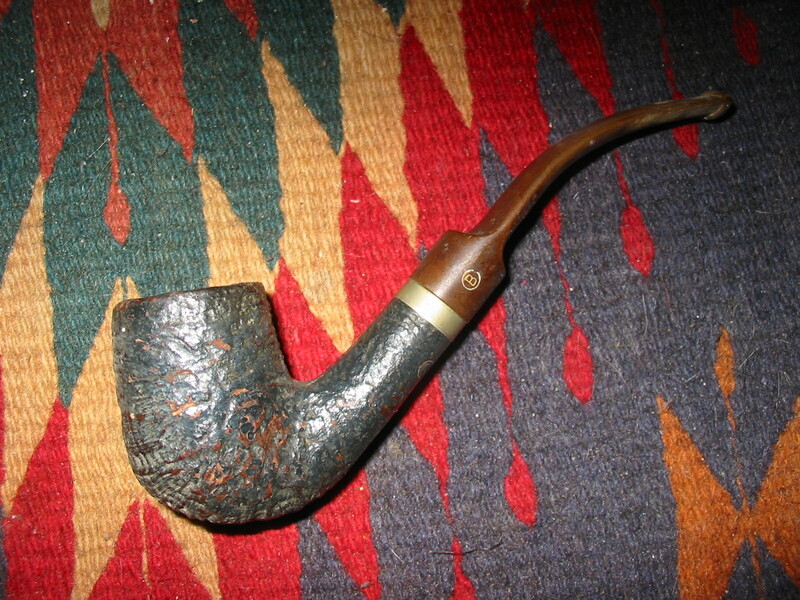 This entry was posted in Pipe Refurbishing Essays and tagged cutting a new button, GBD New Era, GBD pipes, opening a slot in the button, Oxidation, refurbishing, reshaping a stem, restaining on January 9, 2013 by rebornpipes. 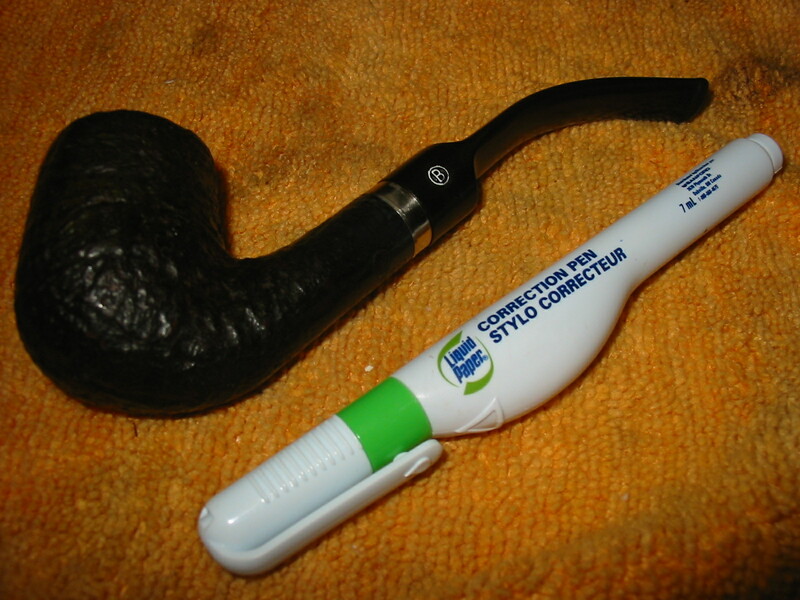 This afternoon I was thinking it would be helpful to write up a tutorial on how I use needle files to open the slot on a pipe stem. 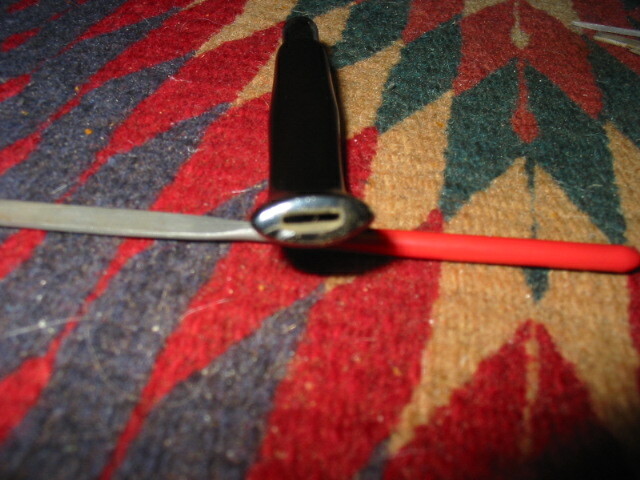 In this photo essay I describe in a step by step breakdown the process I use to open the slot. I will describe it and illustrate it with pictures of the stem at each step and the files that I use to do the work. In the past I have just done the work but never documented it so this will be interesting for me as well as you. 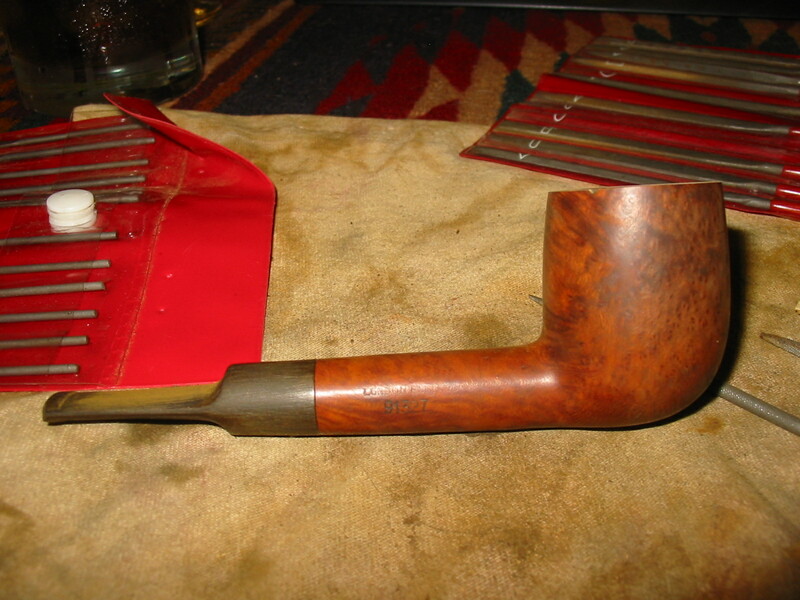 The stem I have chosen to open the slot on is a Peterson 69 that has a replacement bit that was fit by Howard Schultie of Schulties Pipe Repair. 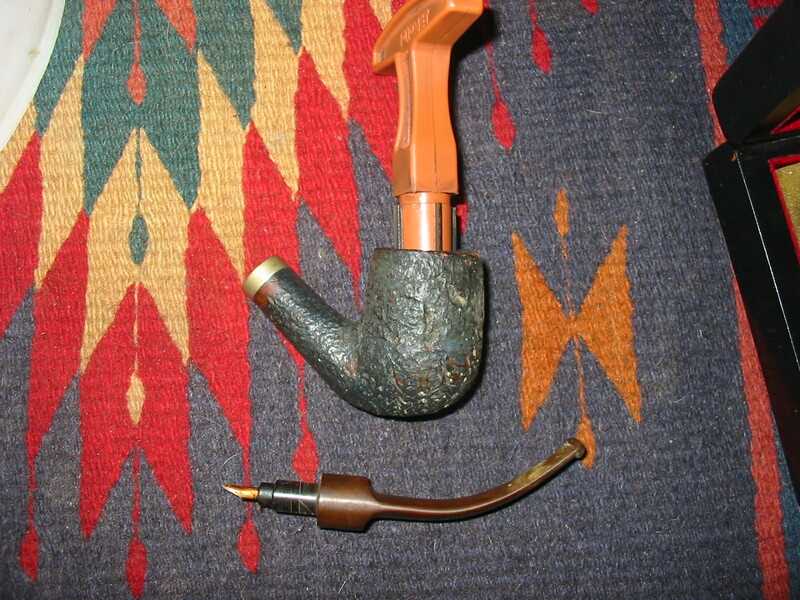 Howard did an amazing job of fitting the stem with a great tight fit in the end cap of the older Peterson that I sent him. I topped the bowl and restained it when it arrived yesterday. I only had one issue with the stem when I examined it and that was that it came with a fairly small slot that made fitting a pipe cleaner a chore and the draught a bit tight as well. 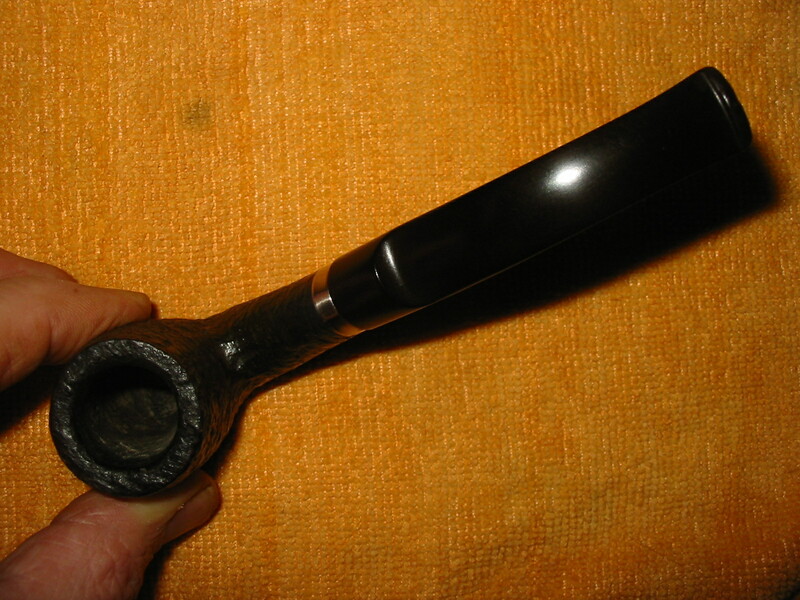 I removed the stem and blew air through the bowl and the airway was nice and open. 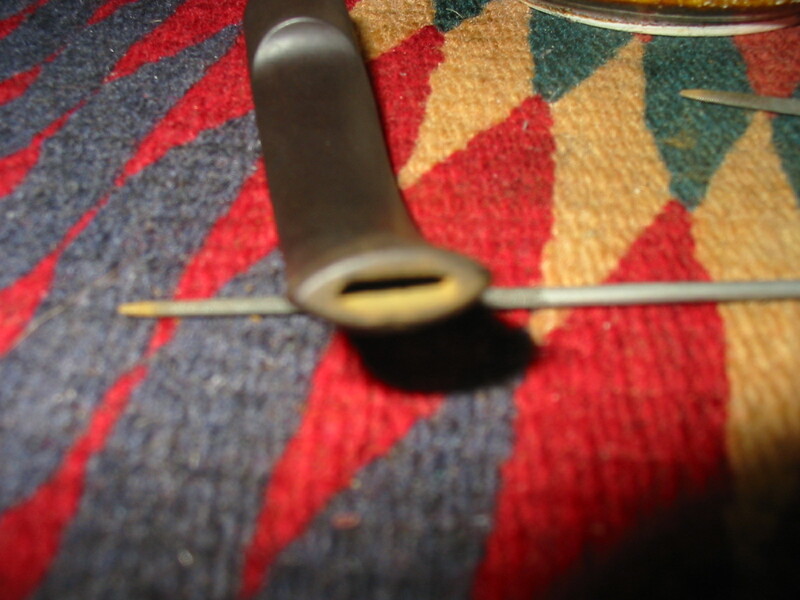 I slid a round needle file into the stem from the tenon end up to the bend and it too appeared to be open. From that point on the airway narrowed as it moved toward the slot. 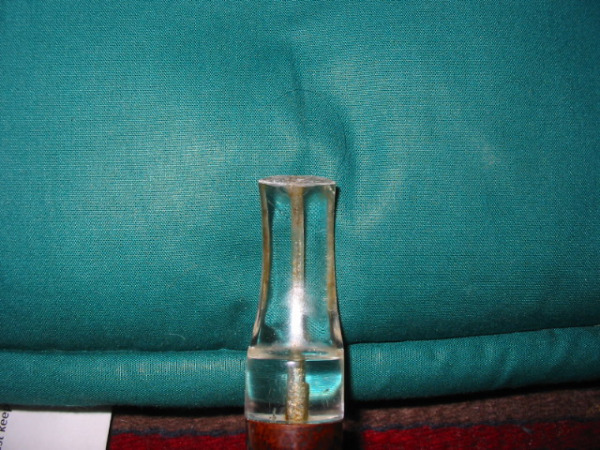 The slot was narrow and the v shaped funnel at the slot was shallow. I like a more open slot and deeper v in the button and end of the stem so I went to work on it with the files. I do the filing with my right hand while holding the stem in my left hand. I probably could use a bench vise to hold the stem but I do not have one set up on my temporary worktable. I start the filing with the flat rectangular bladed file or a flat pointed file depending on which fits in the slot. 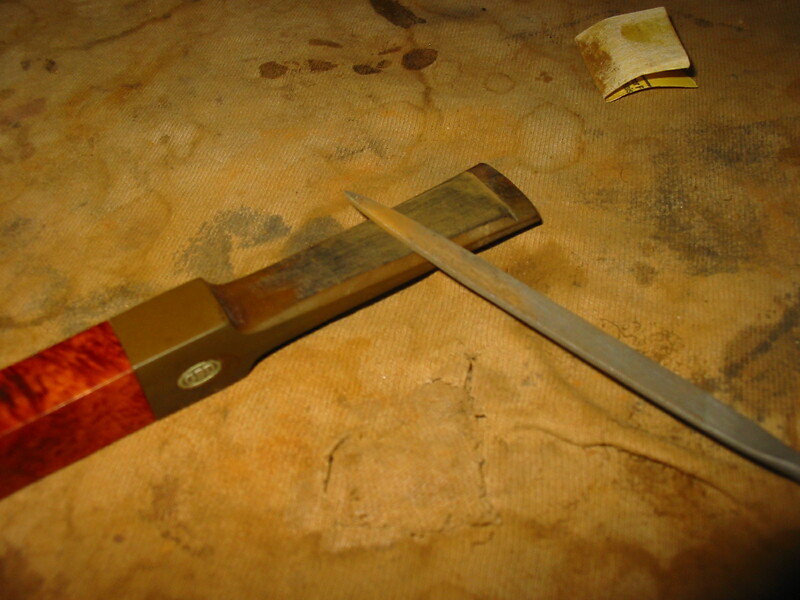 In this case the flat rectangular blade was too thick so I used the pointed flat blade to begin. I filed the top and bottom edge of the slot to open it up wider. My preference for the slot is that is an elongated oval shape so I started by opening these top and bottom edges first. 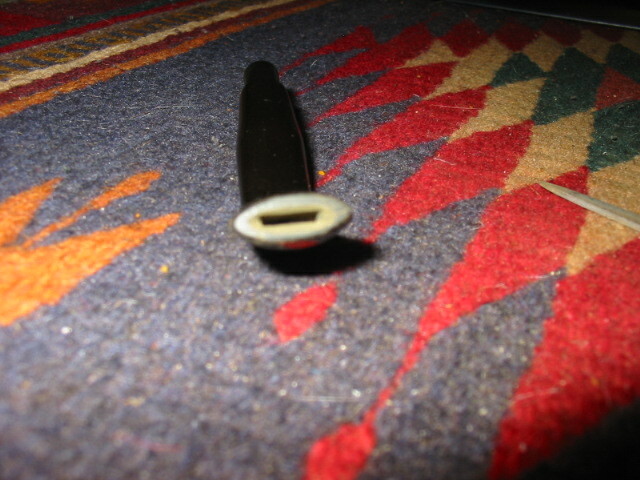 I also slanted the edges of the slot inward toward the airway. 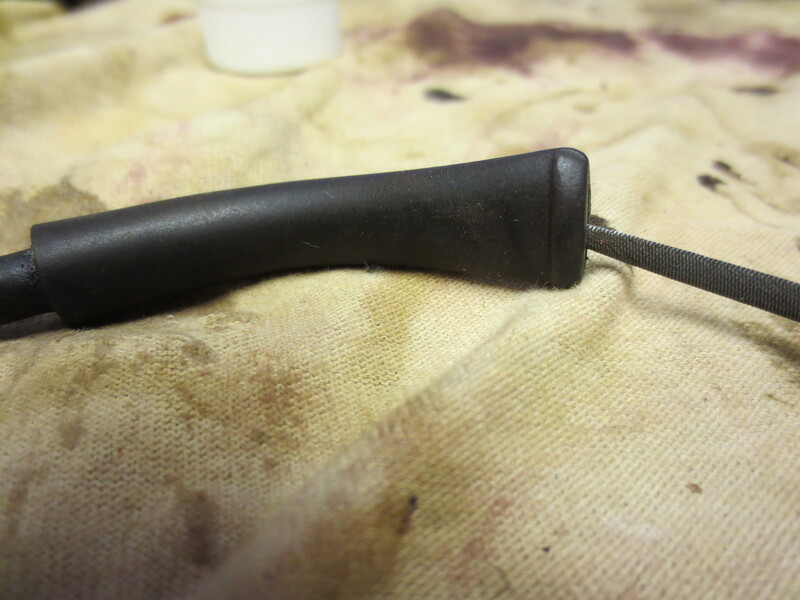 I have found that doing so allows me to use the thicker round and oval files to shape the ends of the slot. 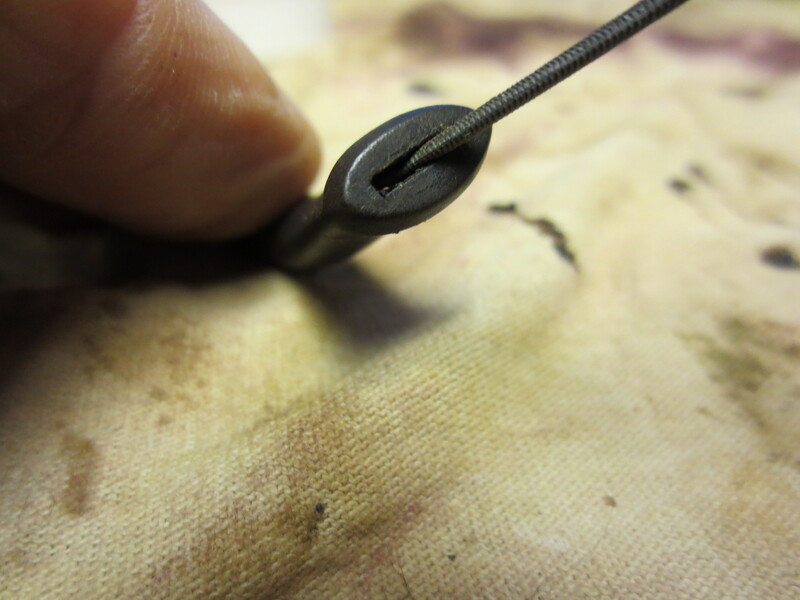 The next series of four pictures show how the stem progressed as I used the pointed needle file to open the top and bottom of the slot and the slope of the edges inward. Each photo shows more progress until the fourth picture which shows how the slot looked when I was finished with the flat pointed blade. 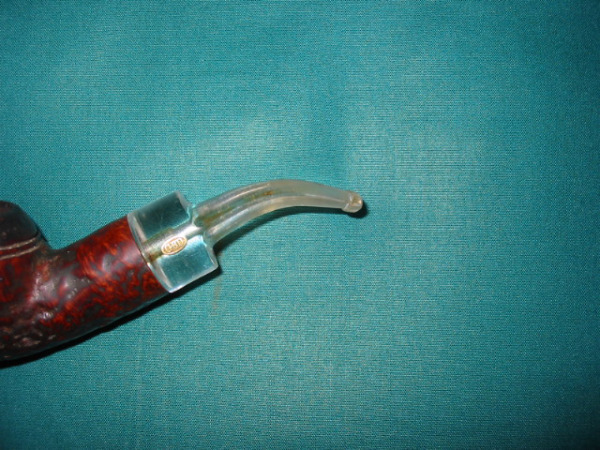 Once I had opened the top and bottom of the slot I could use the wedge file to deepen the v funnel in the airway. This takes a bit of work to keep the angles even on both side of the airway. 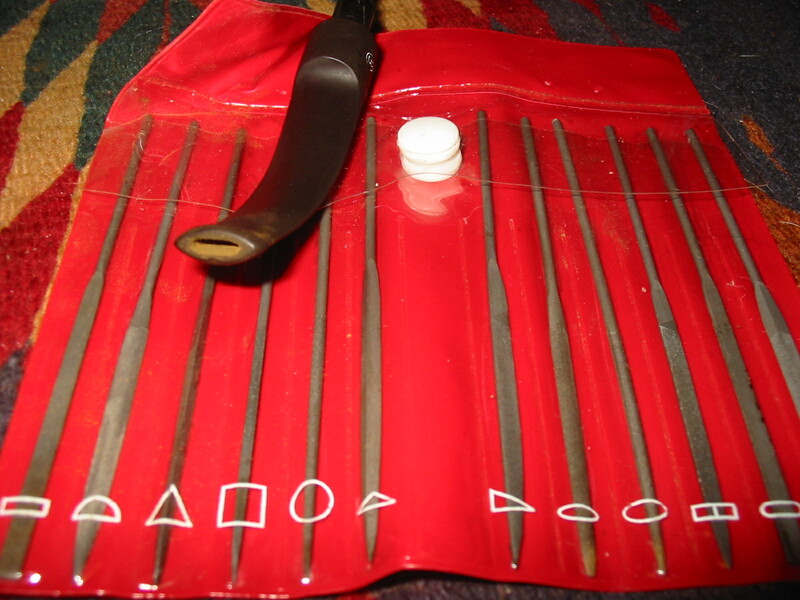 The wedge file keeps the slot rectangular and really focuses the cutting of the file on the sides of airway and slot. Once I have the angles filed and the v deepened I change to the oval file and keep working both sides of the slot until I get the slot to the correct depth. The oval file also rounds the edges of the v on the inside of the slot and also rounds the corners of the outer edges of the slot. 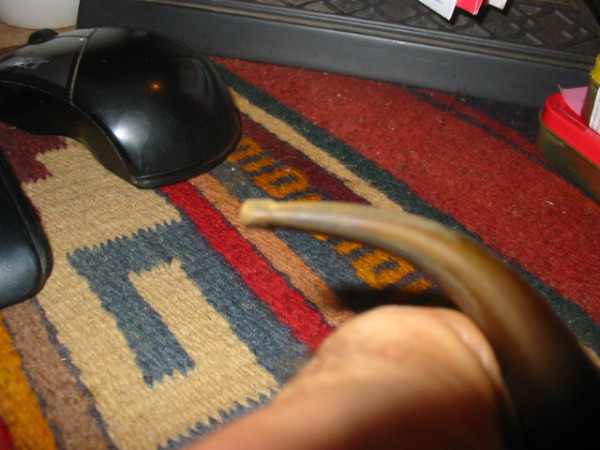 The next series of three photos show the progress of the rounding of the edges and the deepening of the v funnel. The last of the three shows the state of the slot when I had finished this step in the process. 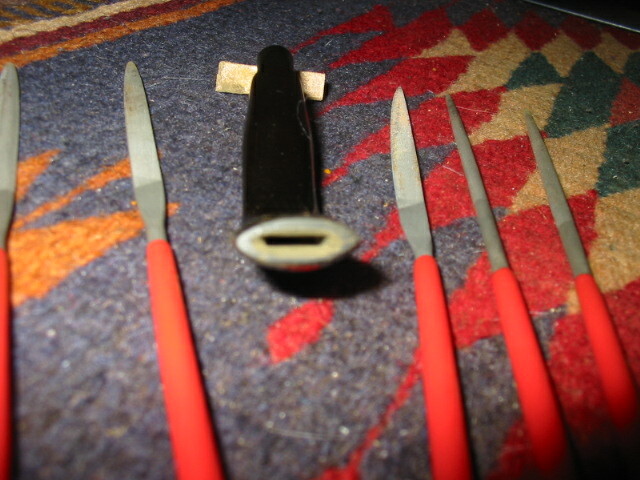 When the v funnel is completed I used the round file to round the edges of the slot on both ends. I also used it to widen the slot in the process so that it extends the equally to both sides of the button and the top and bottom. It is getting closer to the goal of the oval smooth slot. At this point in the process I use the folded piece of sandpaper in the photo above to work on the inside of the slot to smooth out the roughness left by the filing. I used 240 grit sandpaper to work on the inside until it was smooth and then shifted to 400 and 600 wet dry to finish the sanding. 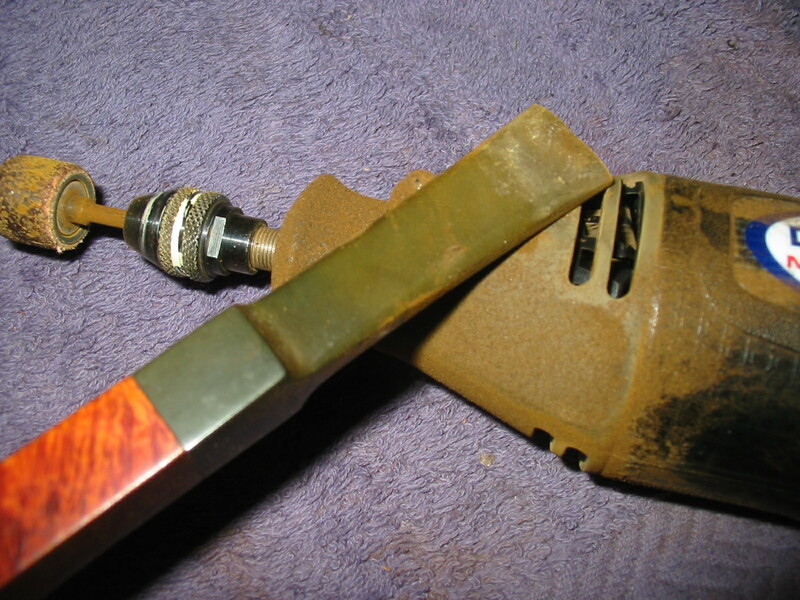 The final picture below in this series of four photos shows the state of the slot after sanding. 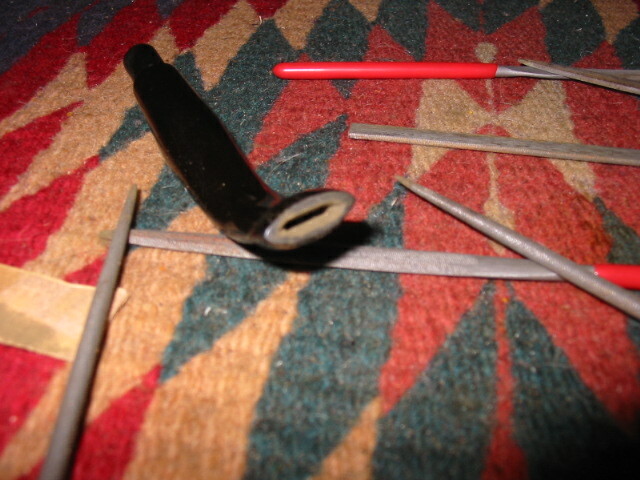 After finishing the basic shaping of the slot I decided to line up the files that I used to get the stem to this point. 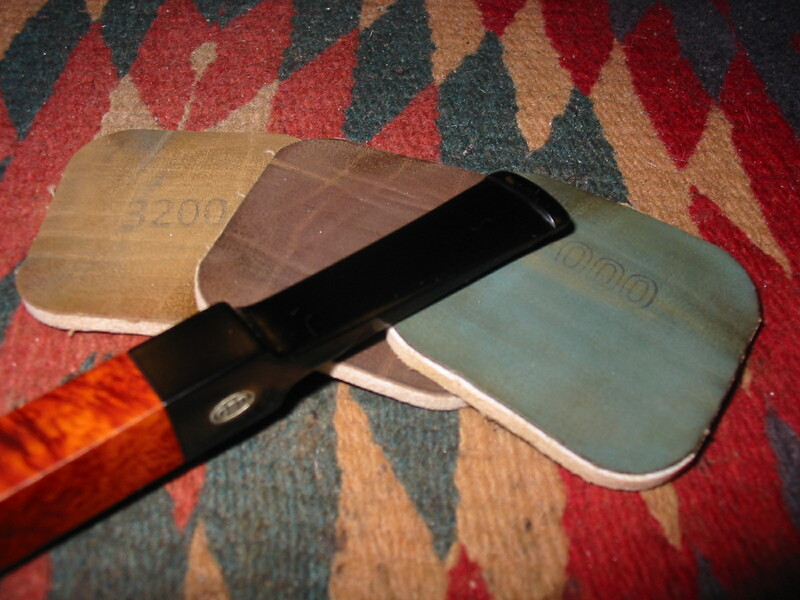 The next series of four photos show the files and the current appearance of the reshaped and opened slot. After taking these photos I did quite a bit more sanding on the internals of the slot. 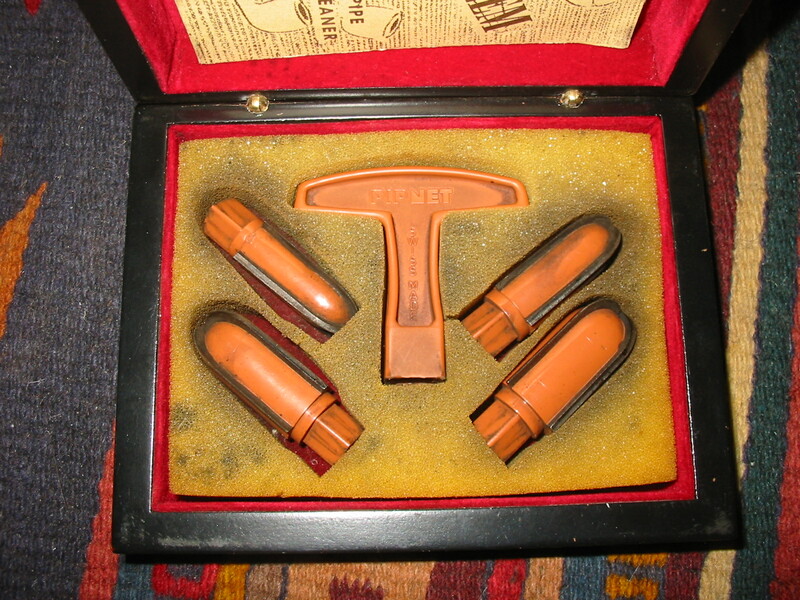 I used the folded sandpaper pictured above to open it up and smooth it out. 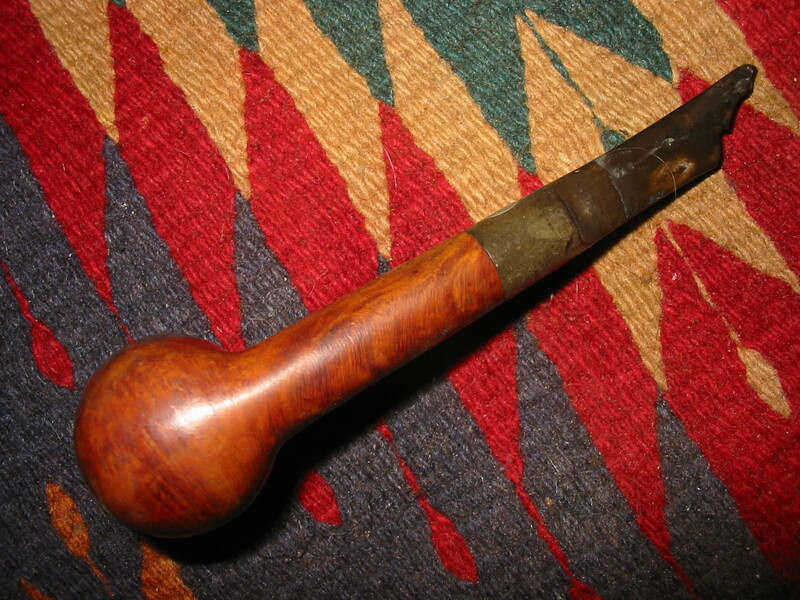 The first photo shows the finished shape of the slot. From there I used fluffy pipe cleaners to clean out the sanding dust and vulcanite bits that were left in the stem and slot from the sanding. The second photo shows the finished slot after I had sanded it with the 240 grit, 400 and 600 grit sandpaper and water to get it smooth. The final photo below shows the finished slot. It is no longer the slight slot but is now a wide open and oval shaped slot. It easily takes a fluffy pipe cleaner with little effort. The draught is now very open. 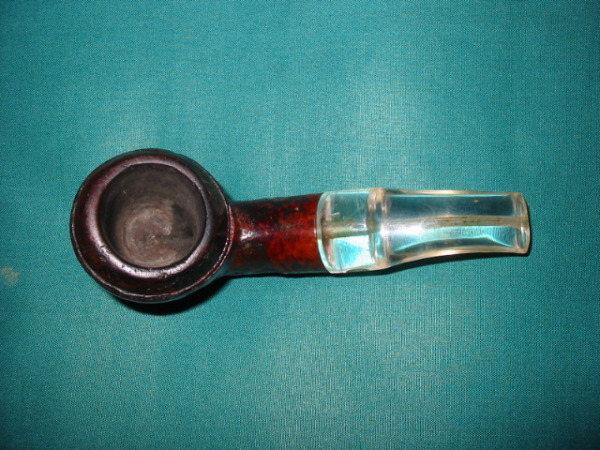 The internals are shaped in a wide open v shaped funnel that comes to a point ½ inch into the slot. Each side of the v is gradually sloped to the airway at the bottom. The whole process did not take too long. From start to finish I spent 45 minutes. I like the finished appearance of the slot far better than the original one. The feel in the mouth and the draw is comfortable. 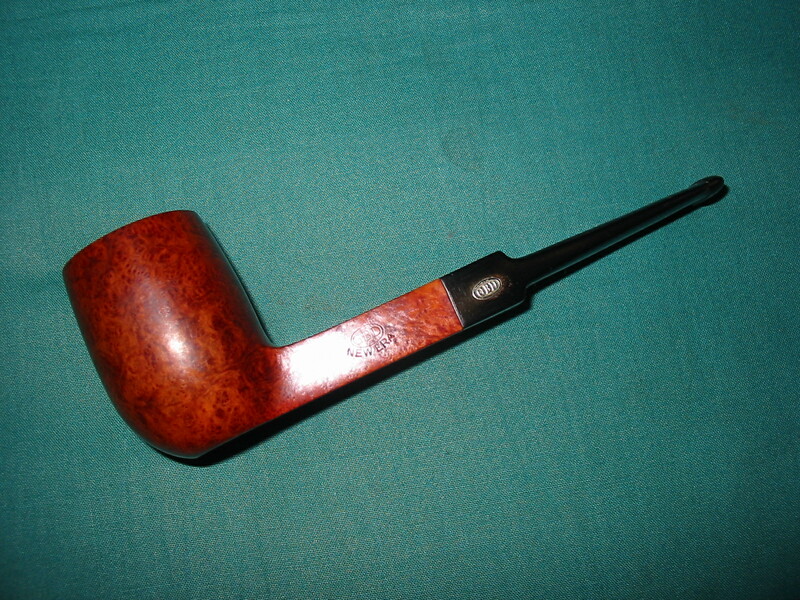 This entry was posted in Pipe Refurbishing Essays and tagged opening a slot in the button, shaping a button, shaping the slot, working on a stem on August 24, 2012 by rebornpipes.